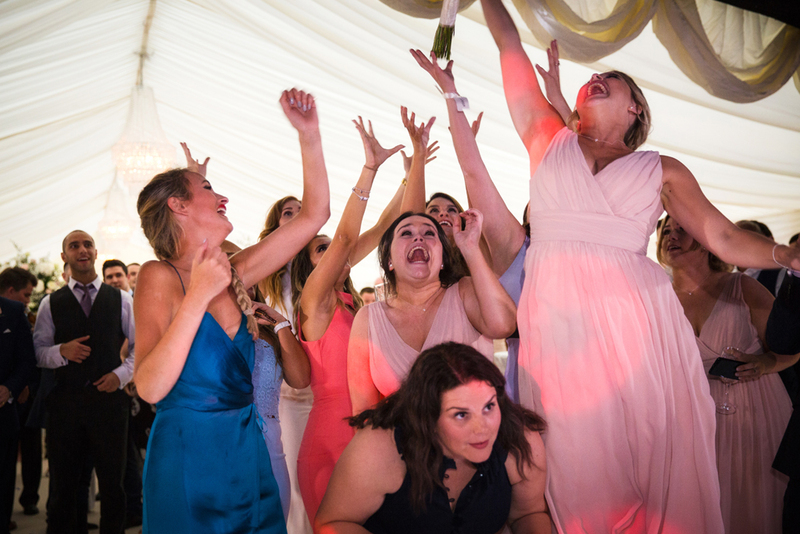 Last week we showed you what happens when you catch the bouquet in the most epic bouquet toss ever. 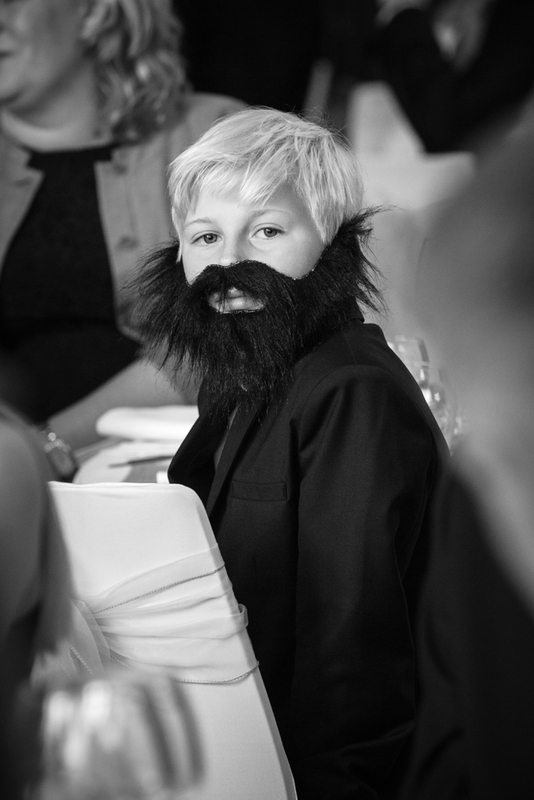 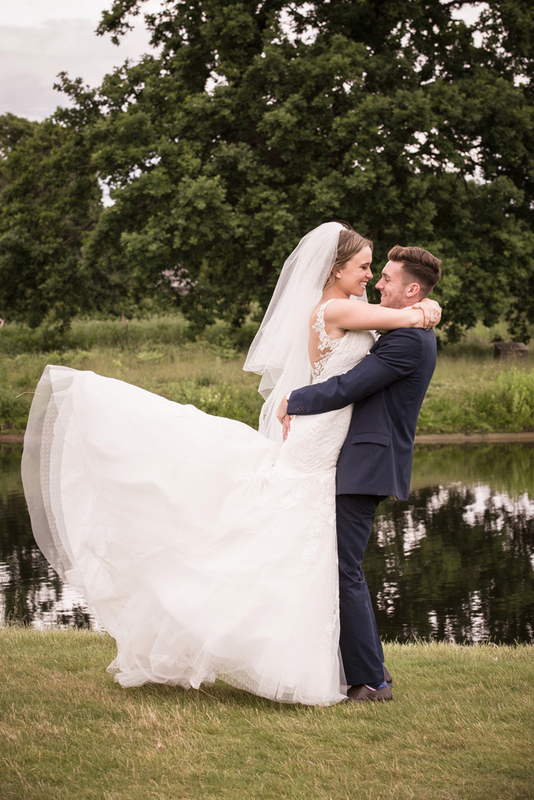 We also teased you with an image from Georgia & Sam’s wedding. 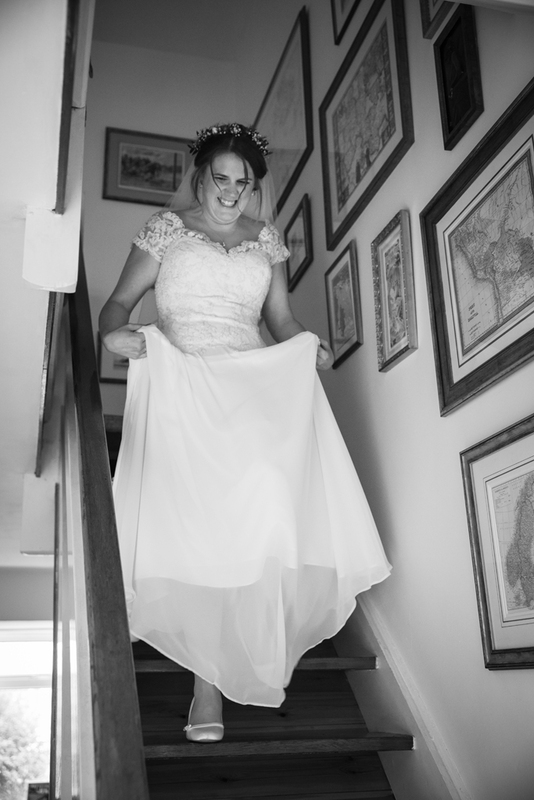 Now it’s time for their sneak peek! 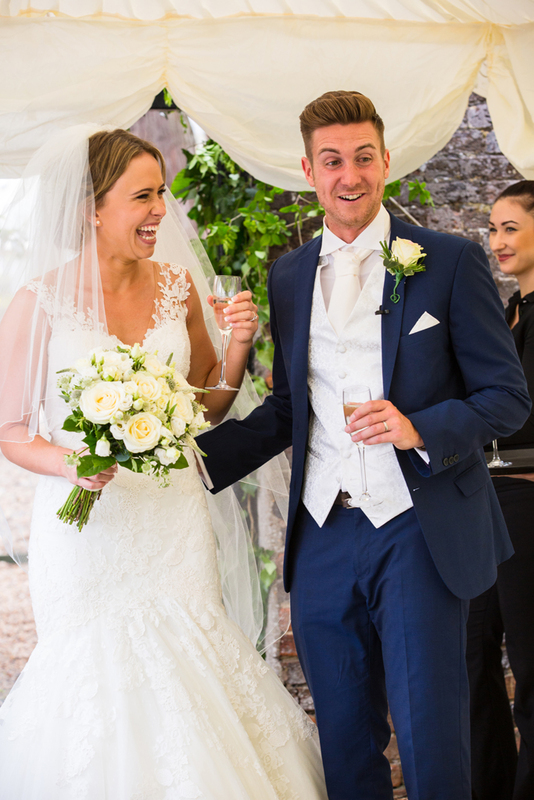 It’s always lovely to book weddings through recommendation & lovely to know how our happy Brides & Grooms have told their friends & families about us. 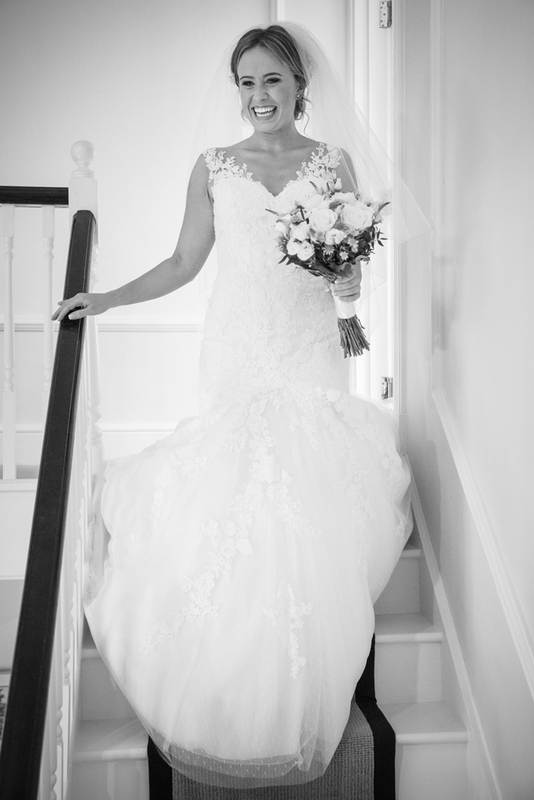 We photographed Georgia’s sister Charlotte’s wedding to Alex two years ago & before that had photographed Alex sister’s wedding. 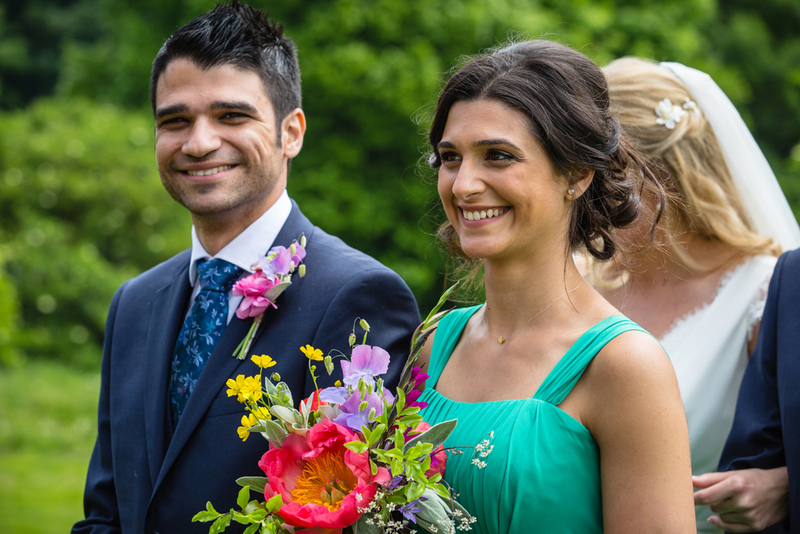 Kiti & I arrived in Weybridge in plenty of time for the wedding & recce’d the locations so we knew where we were going. 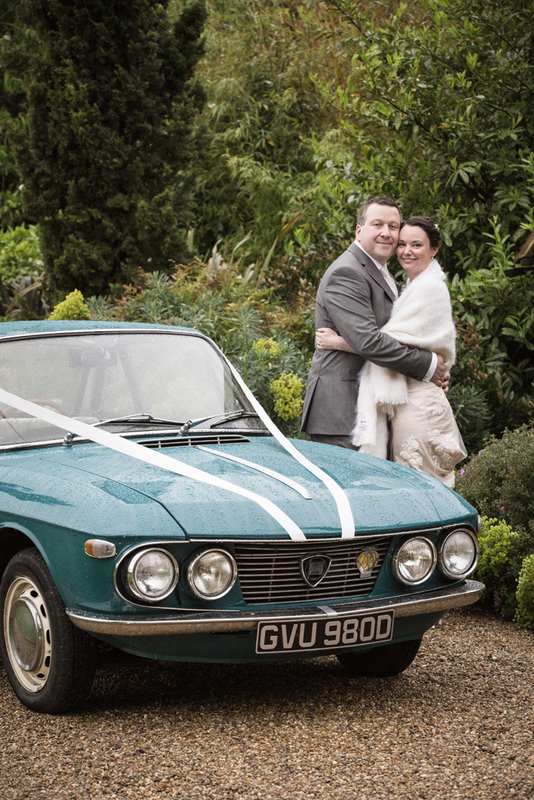 You so often hear about wedding cars getting lost & cakes going missing. 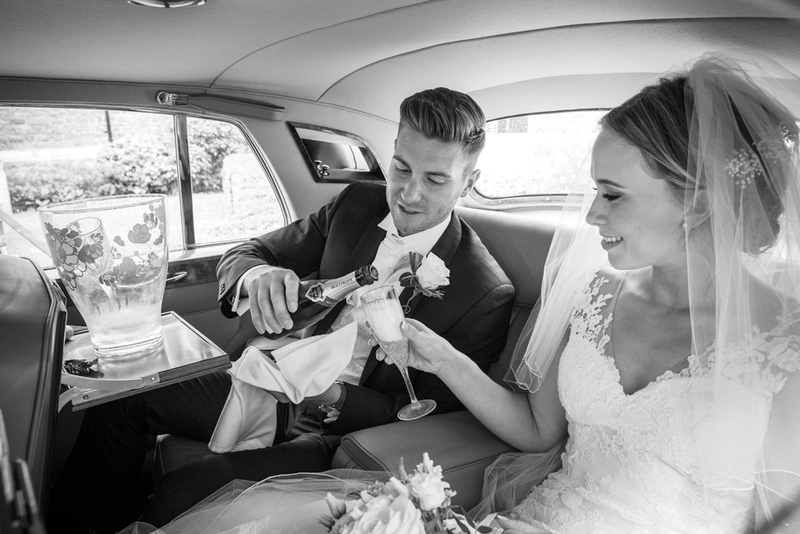 We always make sure that routes have been timed & we have an idea of where we are going in case the faithful satnav breaks down! 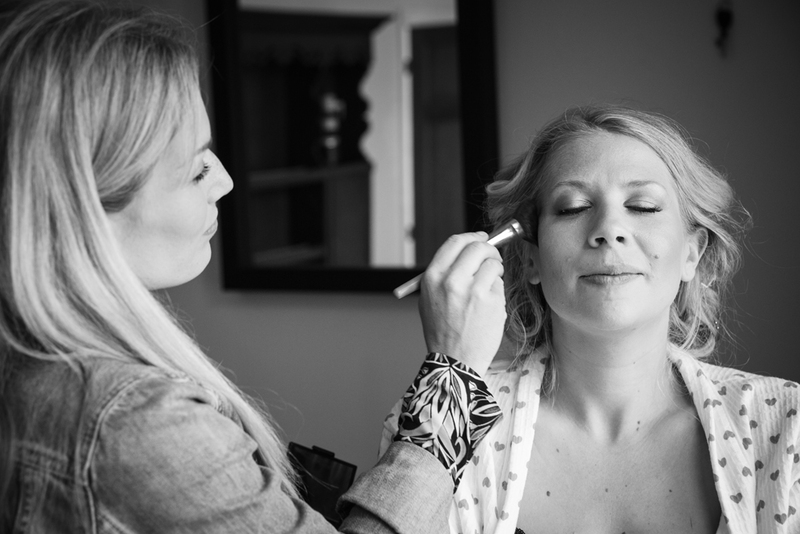 I then dropped Kiti off with Sam & the boys to capture them getting ready. 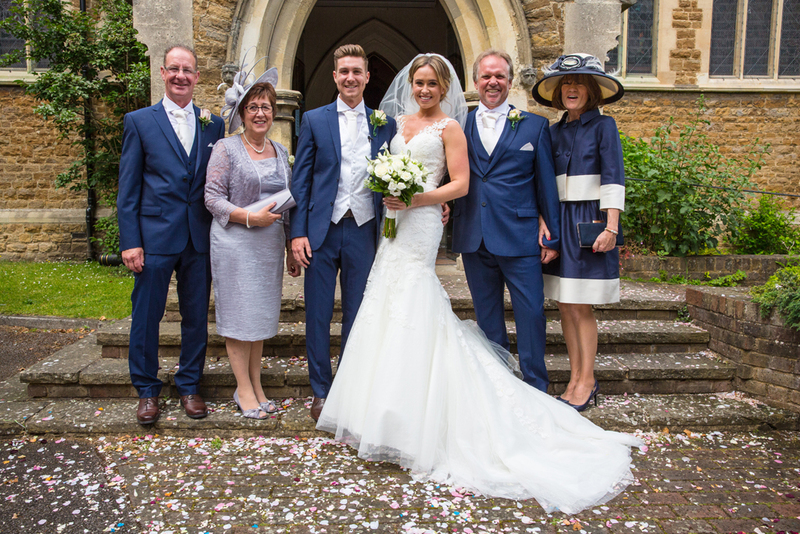 She got there just as they were having the obligatory full English before they were suited & booted….& some graffiti on the bottom of Sam’s shoes. 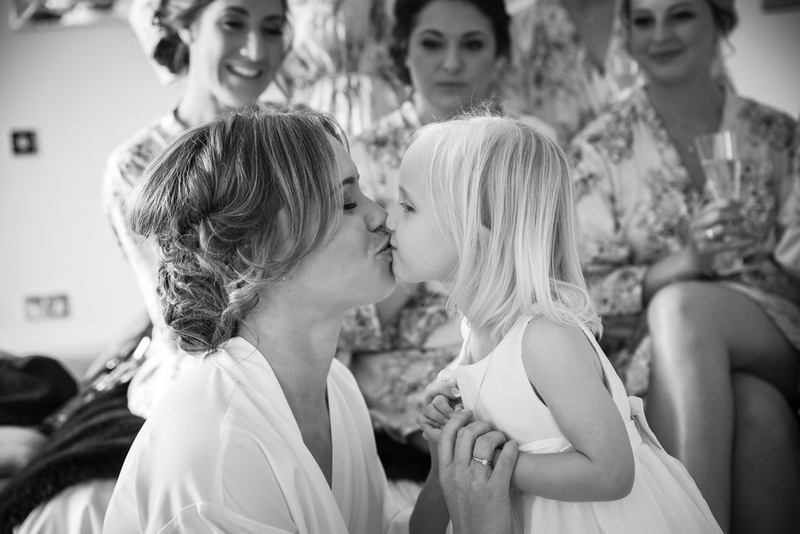 I then joined Georgia & her bridesmaids at her parent’s home. 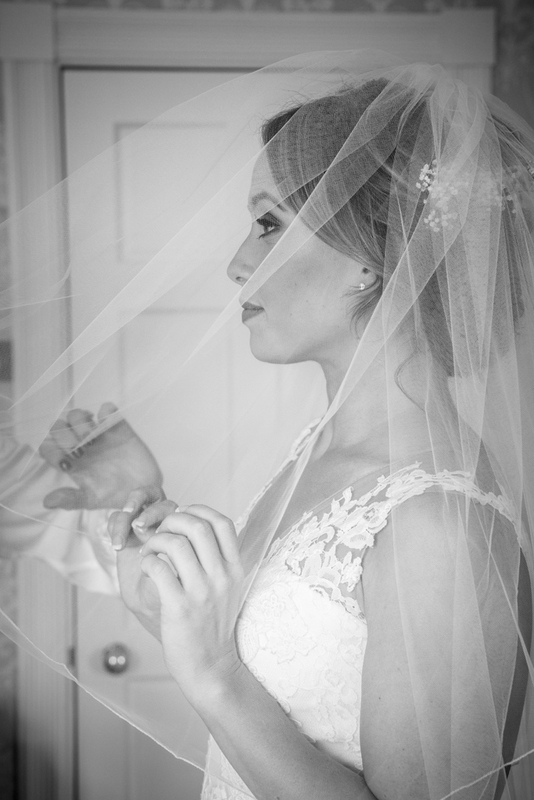 I captured some lovely shots of the Georgia & girls getting ready. 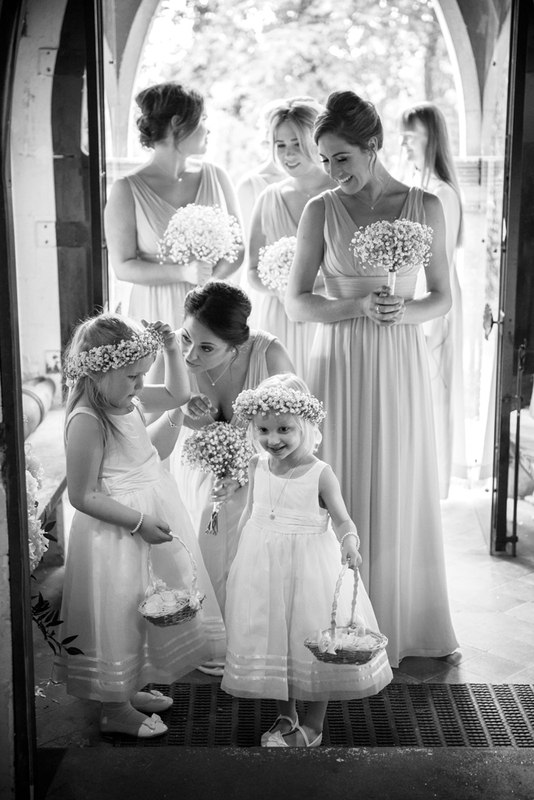 After getting ready upstairs Georgia made her way downstairs where her bridesmaids & Mum & Dad were waiting expectantly for her. 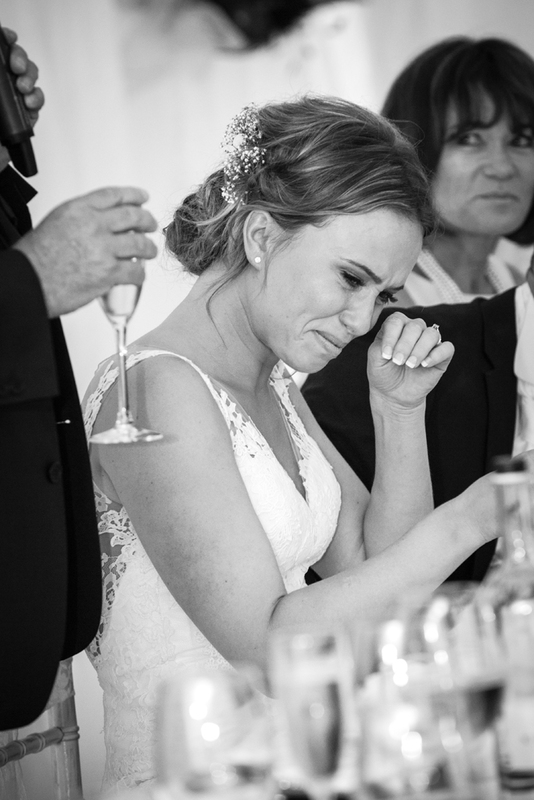 I love the moment where everyone sees the Bride for the first time & Georgia certainly brought a tear to their eyes. 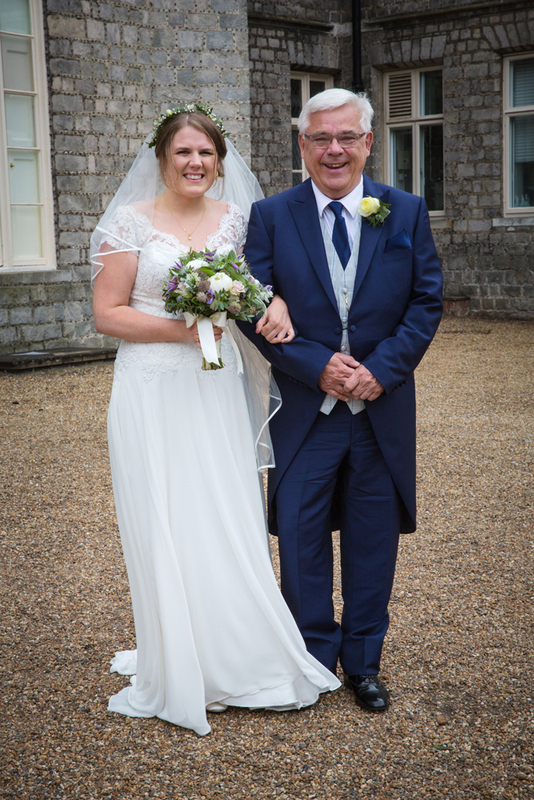 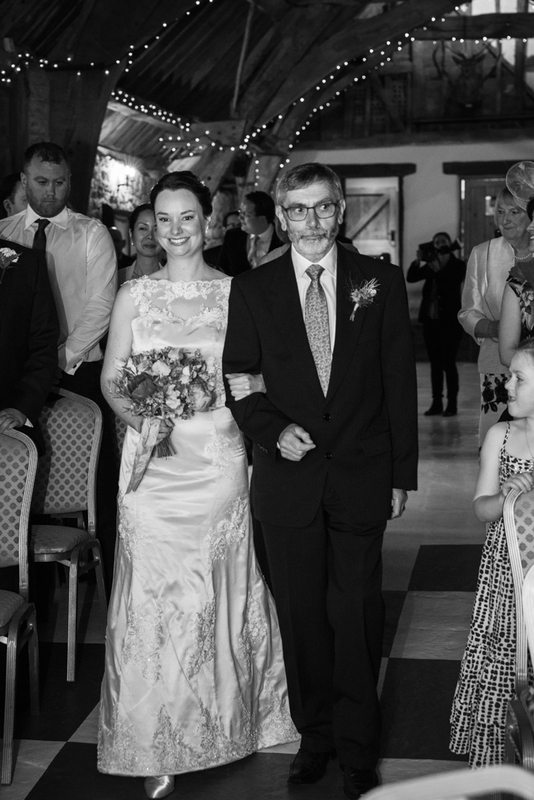 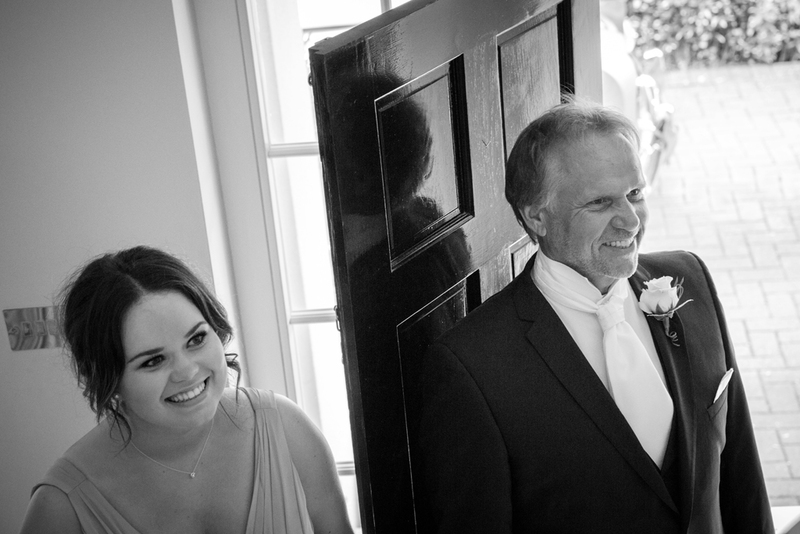 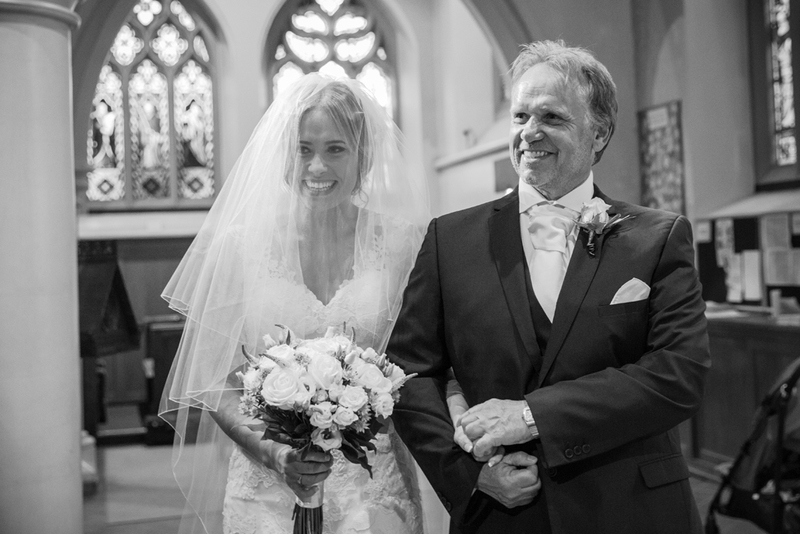 After making the short journey to the church it was time for Georgia’s Dad to accompany her down the aisle to meet her groom. 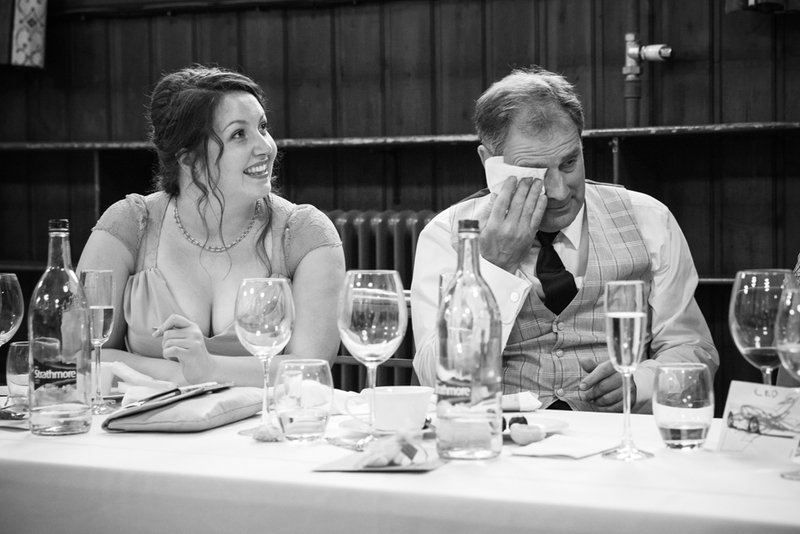 It really was a beautiful service with lots of tears & laughter. 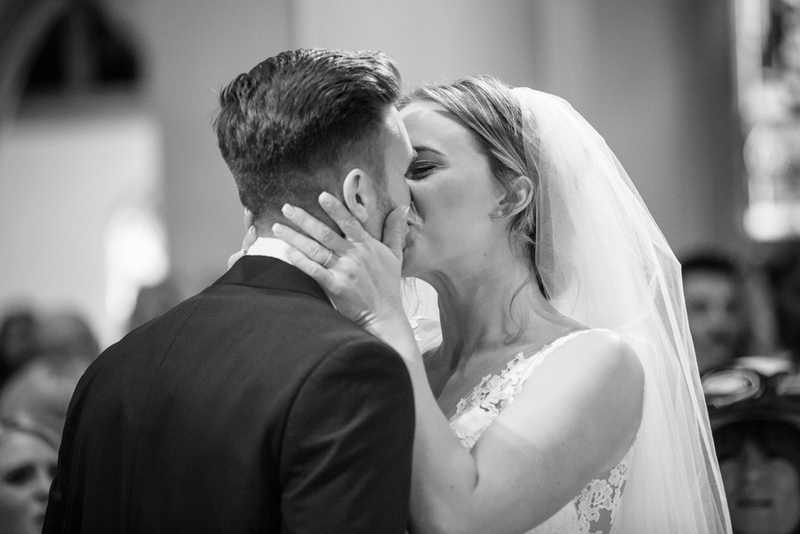 It’s always wonderful to see a couple in love starting their journey together. 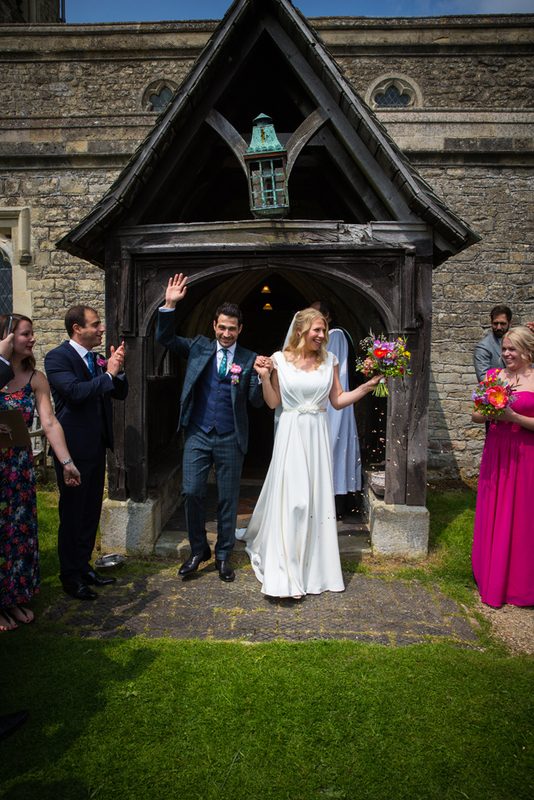 After the service everyone poured outside & mingled with the Bride & Groom offering their congratulations. 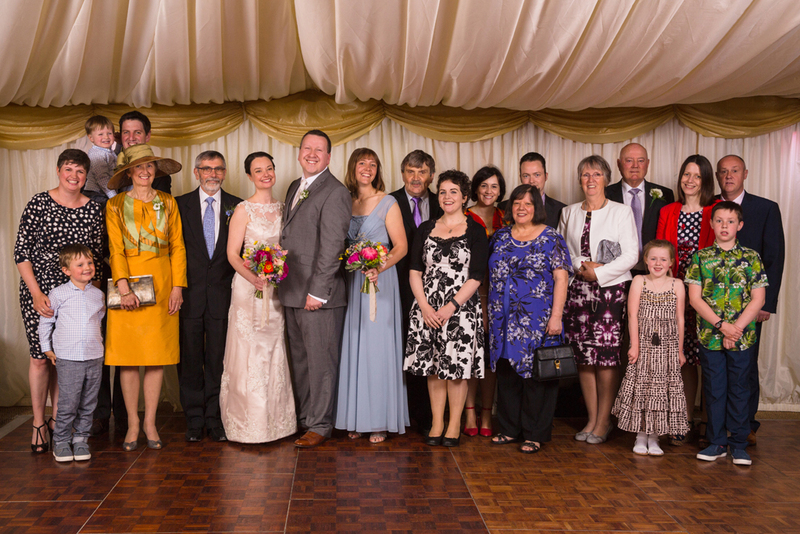 It was then time for a group shots before & the guests got their opportunity to cover the bride & groom with confetti. 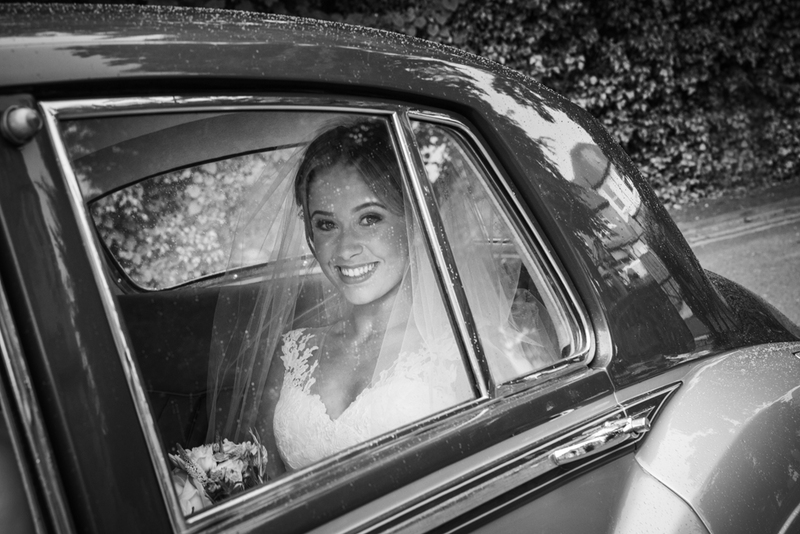 The Bride & Groom were then whisked off to the Burhill Golf Club with Kiti & I in hot pursuit! 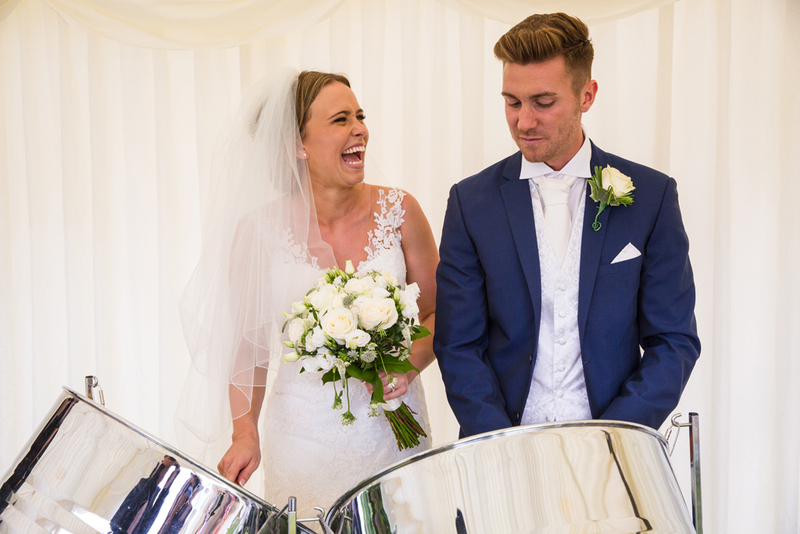 Georgia had surprised Sam with a steel band & I love the moment I captured where he first heard them as they were walking to the marquee. 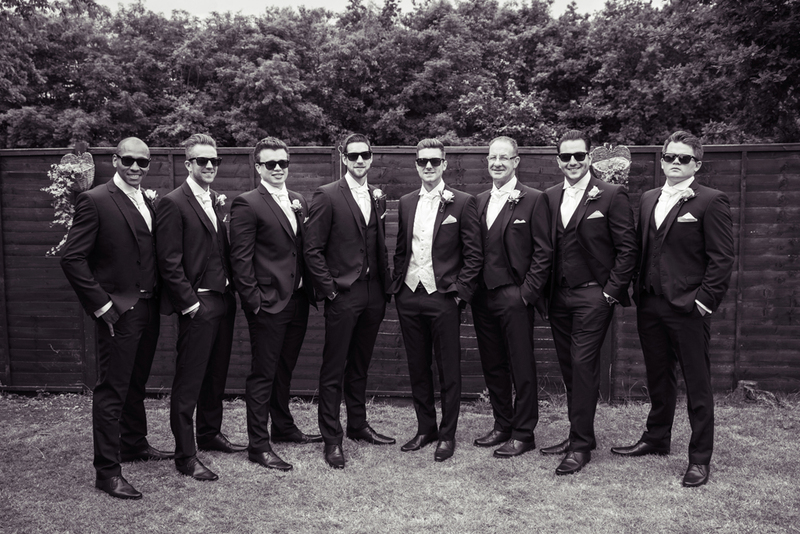 As the guests were mingling in the sunshine Kiti & I took the bridal party away to do some cool group shots. 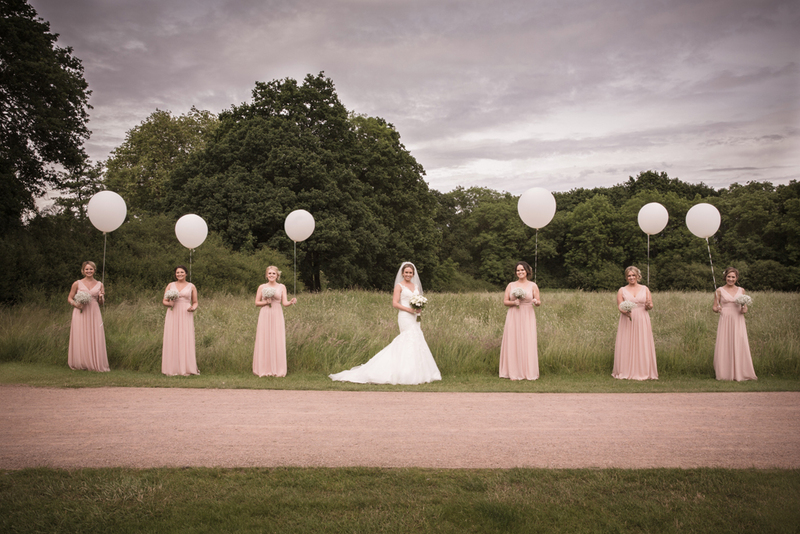 I love the large scale balloons that the girls had & they really added to the atmosphere of the shots. 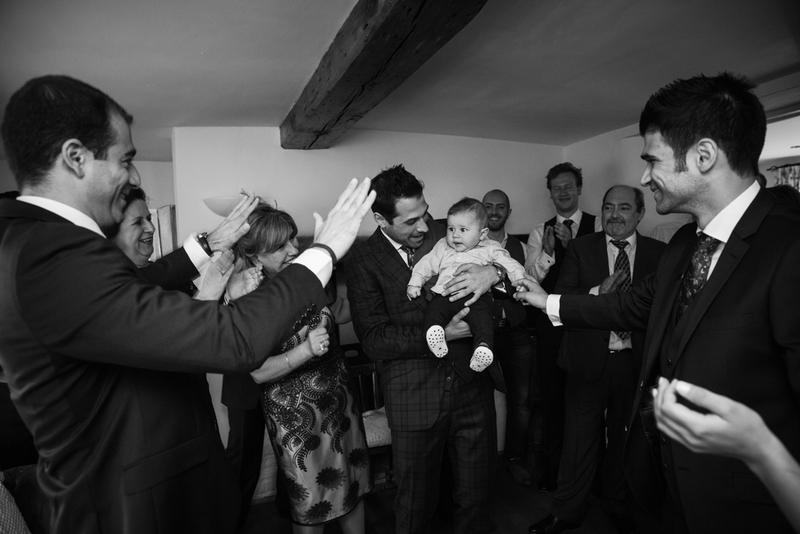 After groups the guys went back to the party & we did some more shots with the happy couple. 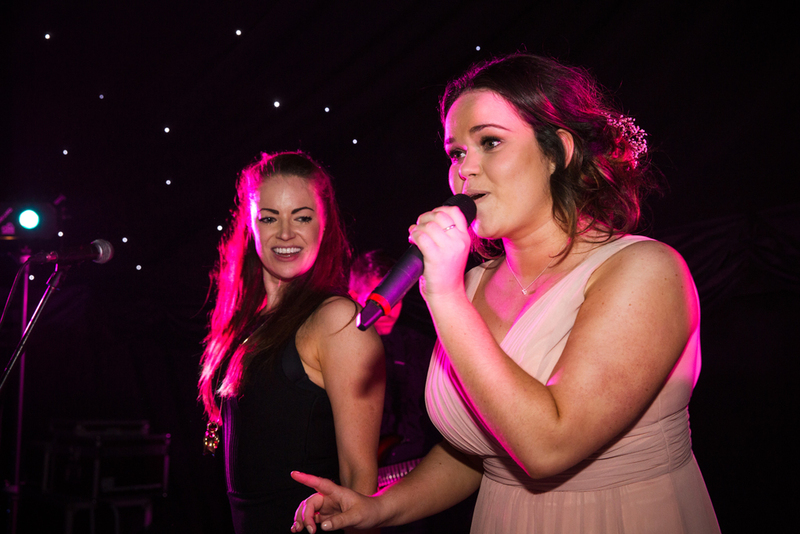 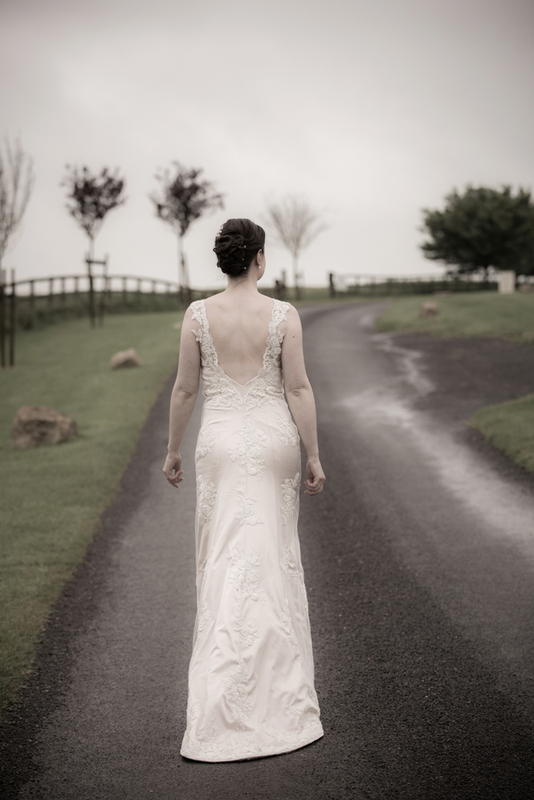 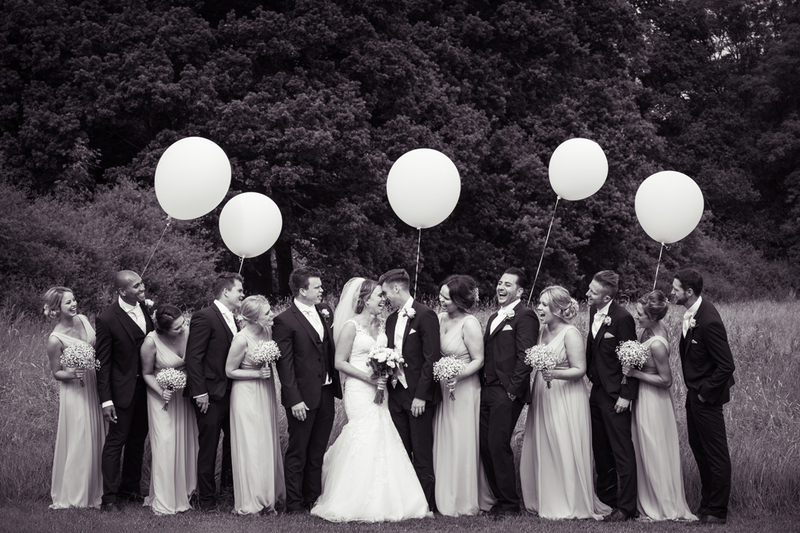 They were really great & looked fantastic, we’re really thrilled with the images we took of them around the golf course. 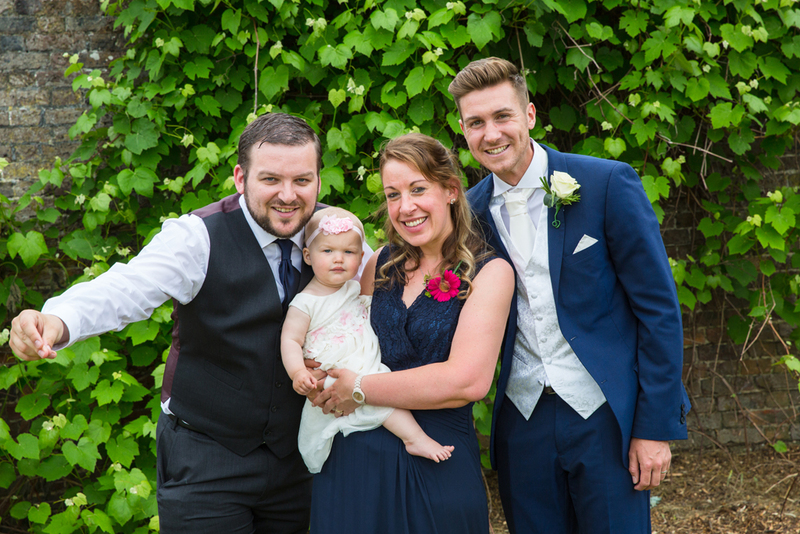 After not too long it was time for the wedding breakfast so we took Georgia & Sam back to join their guests. 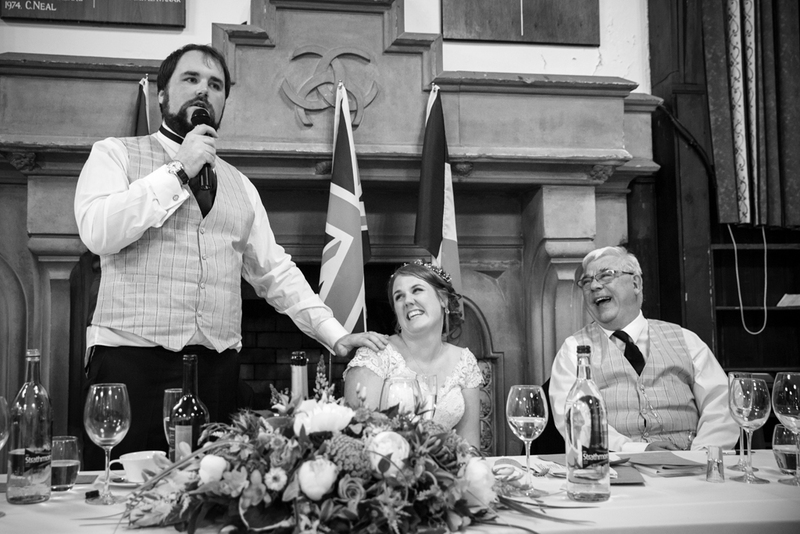 There were some great speeches & much laughter & tears. 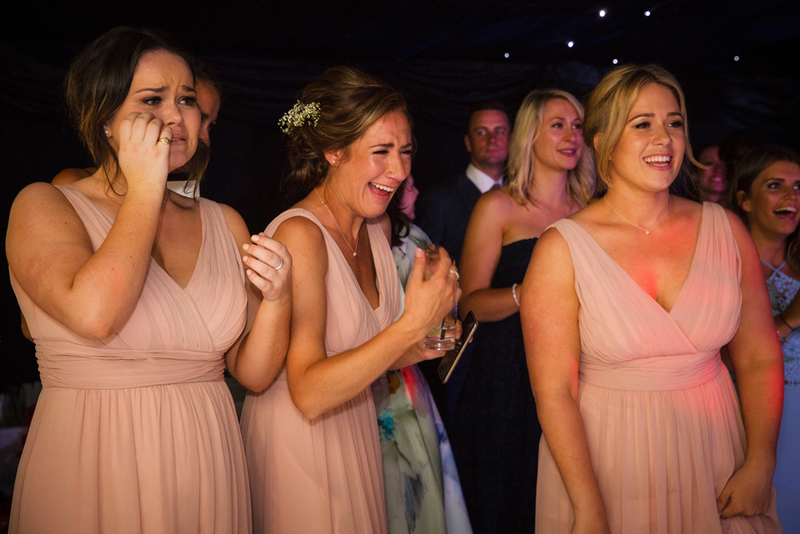 They are always fabulous to capture with some brilliant reactions! 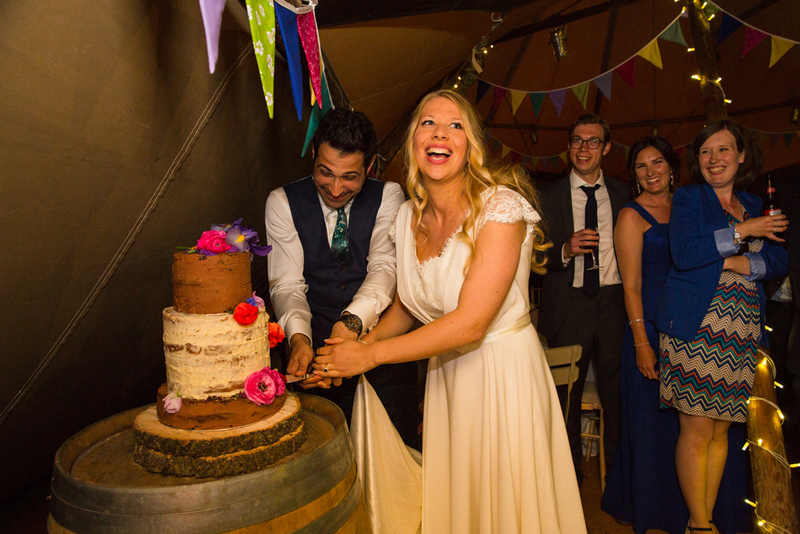 After the wedding breakfast it was time to cut the cake & the first dance. 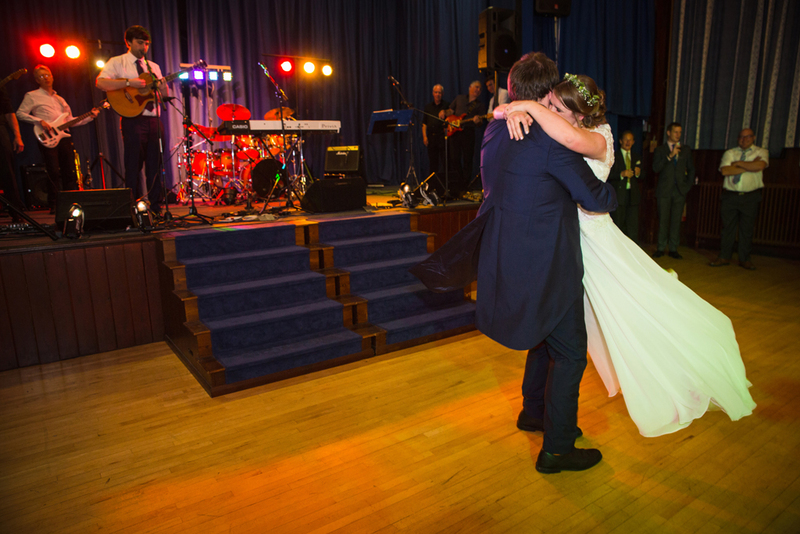 Georgia & Sam hit the dance floor & there was hardly a dry eye in the house. 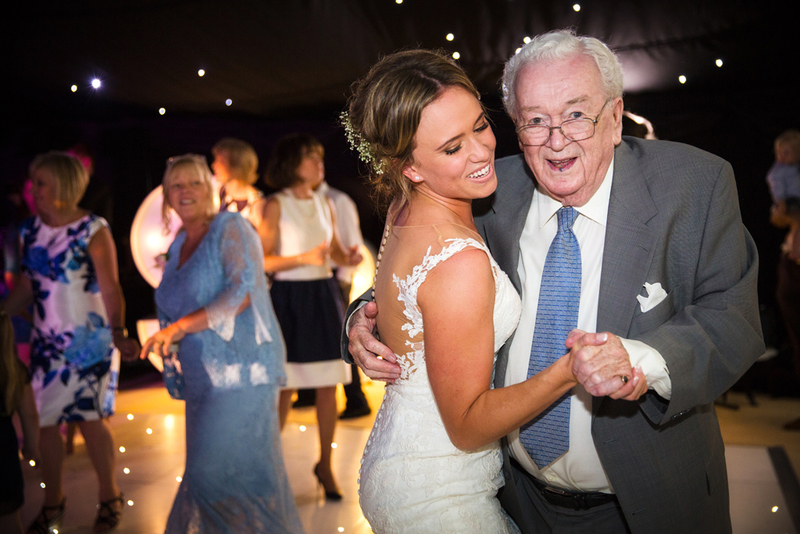 This was certainly true once she’d also danced with her Dad & her lovely Grandad! 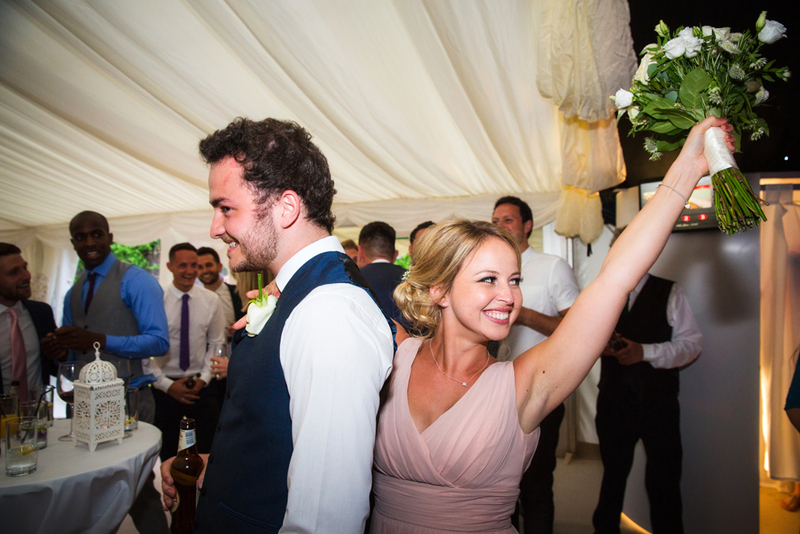 Now, when you’ve been part of the most epic bouquet toss its your duty to then pass the baton on so to speak. 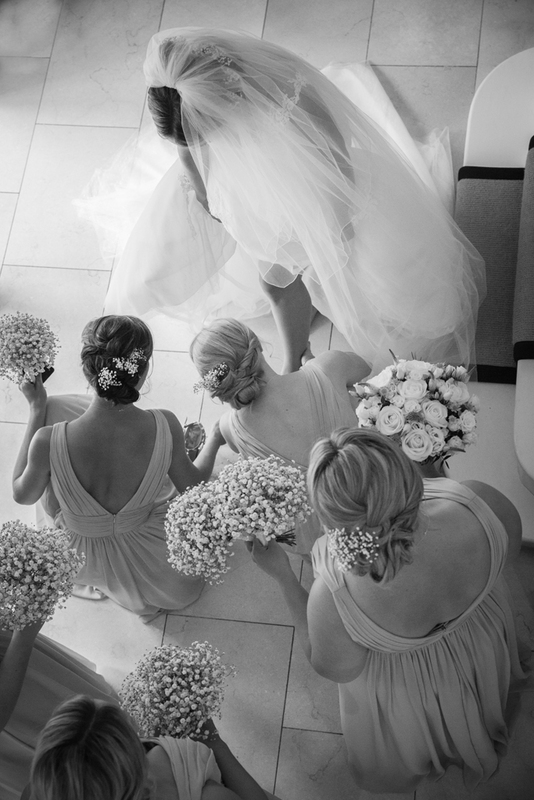 Georgia threw the bouquet & after a bit of a tussle & some spilled champagne her bridesmaid, Caroline, caught the bouquet. 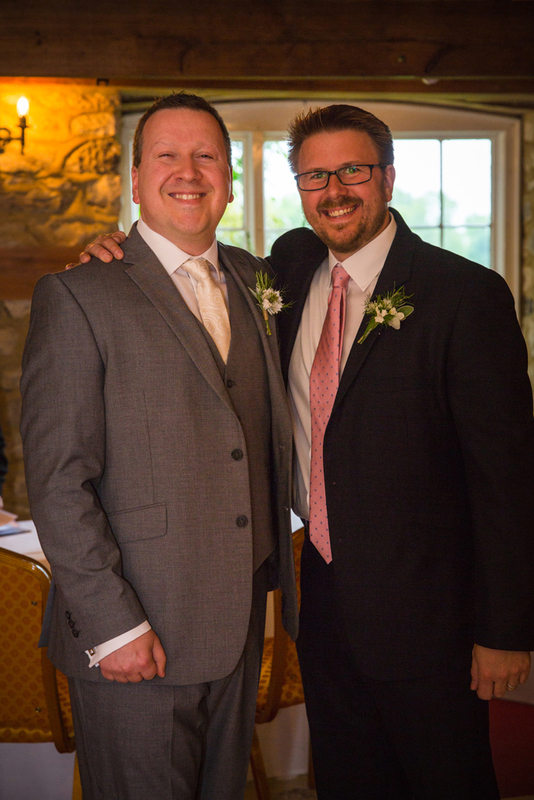 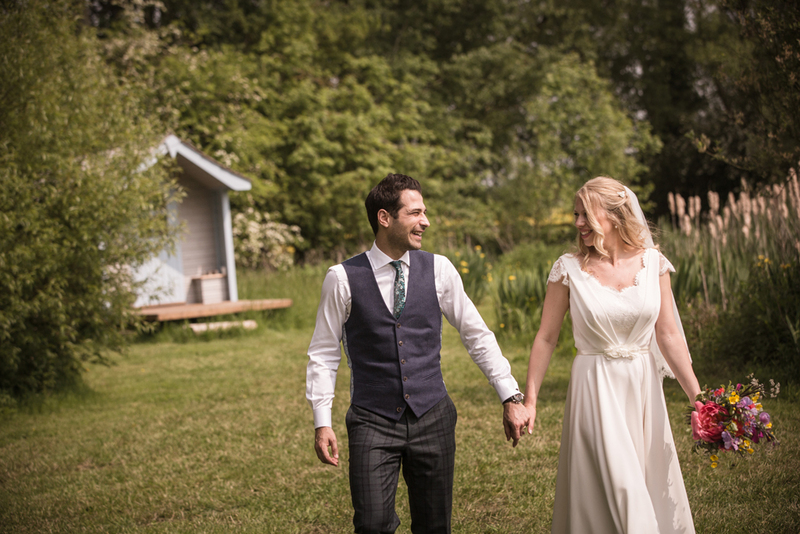 Could we be looking at a happy Mark Lord Photography Bride & Groom of the future?! 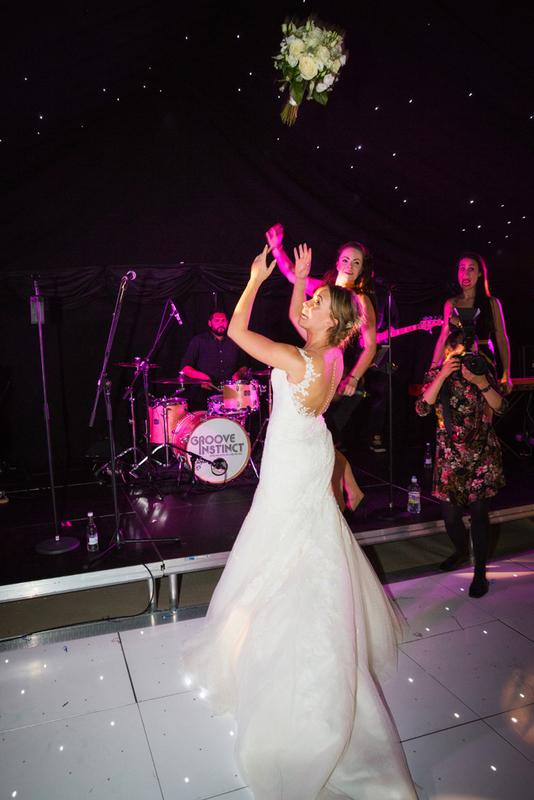 Everyone hit the dance floor & had great fun; the evening included a performance by Georgia’s sister Natalie & a group performance of Candy by Cameo by the entire dance floor! 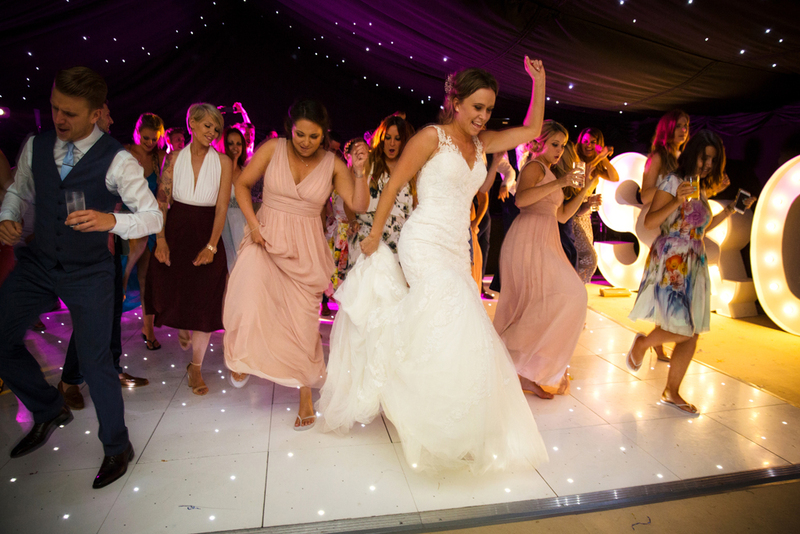 We left everyone on the dance floor having fun! 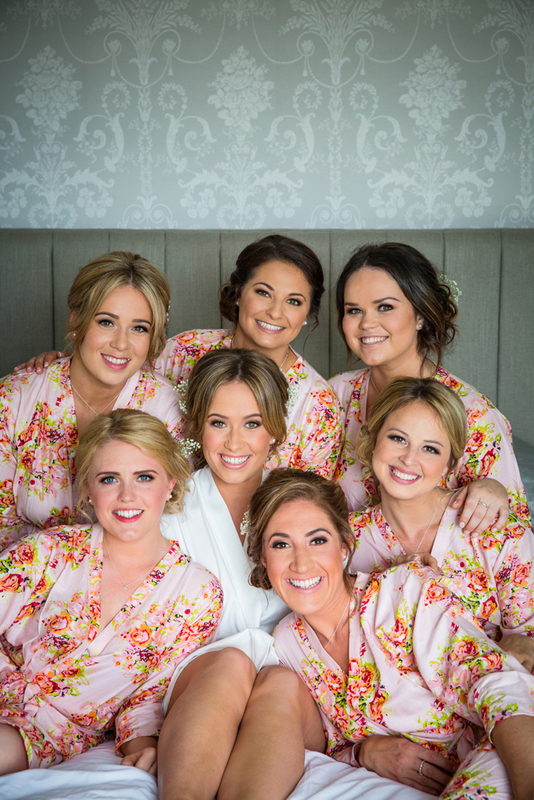 We hope you enjoy your sneak peek Georgia & Sam, wishing you every happiness! 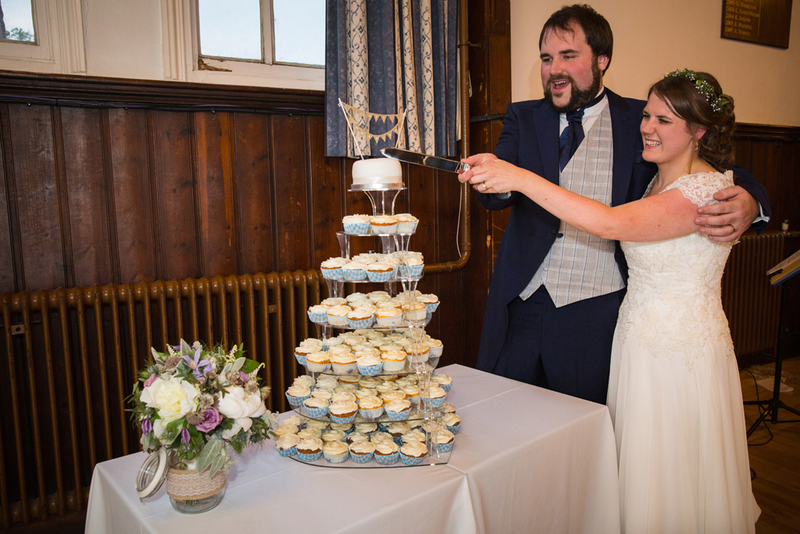 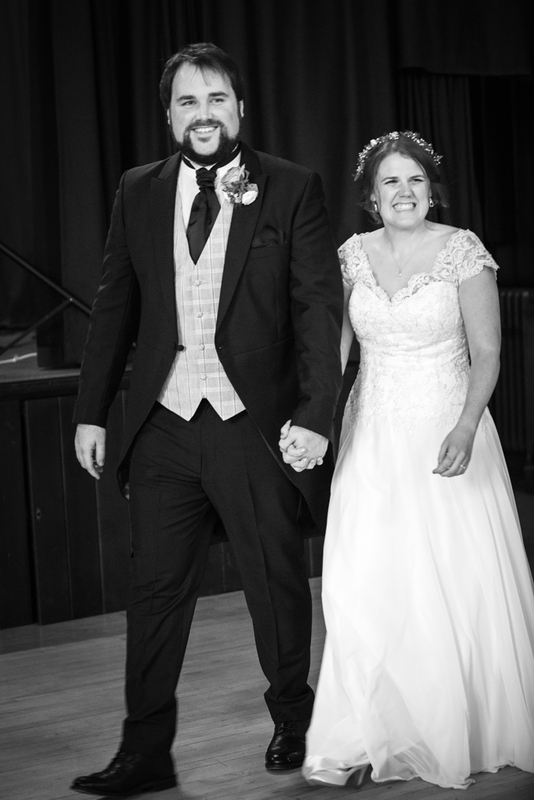 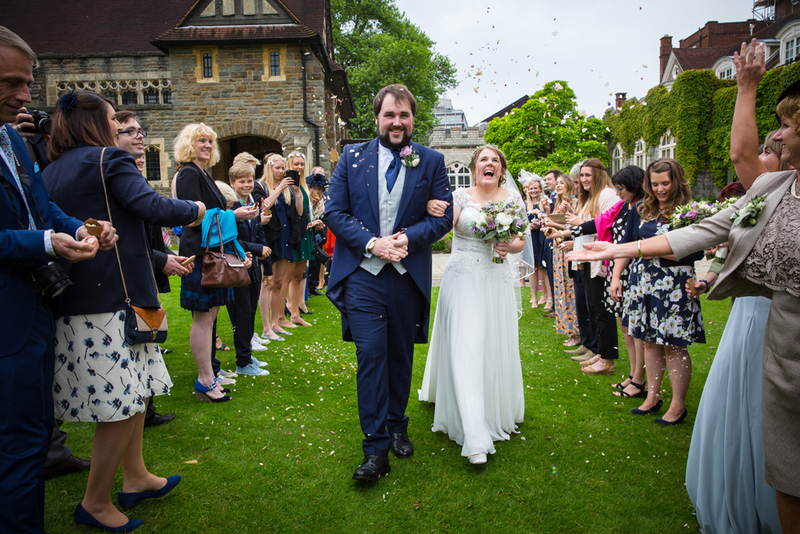 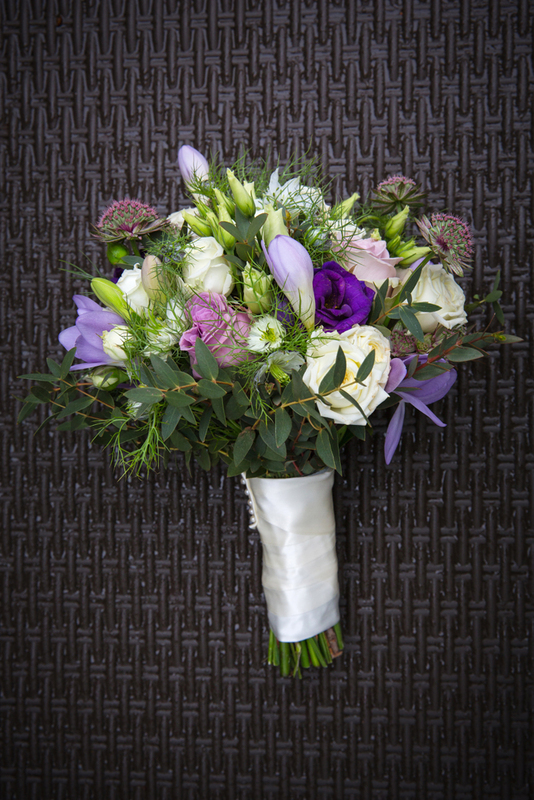 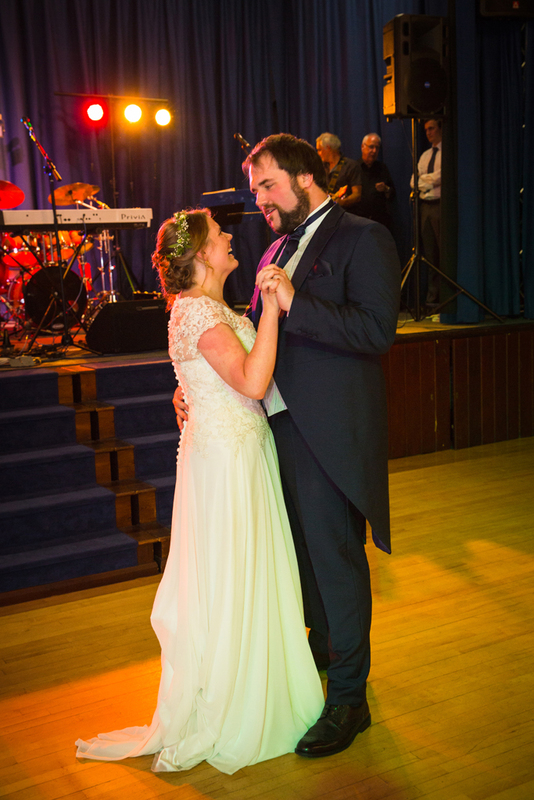 Chris & Gro celebrated their wedding at Wycombe Abbey School in High Wycombe. 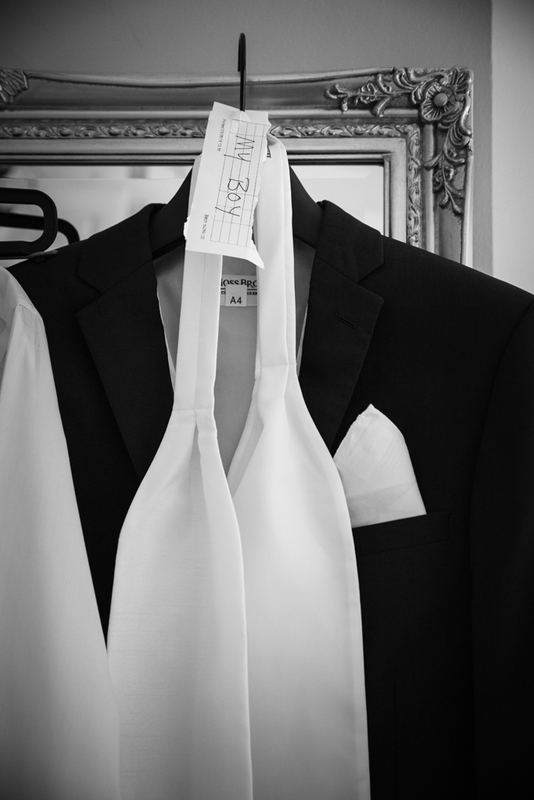 I dropped Kiti off at the school & she started the day with Chris & the boys who were there getting ready. 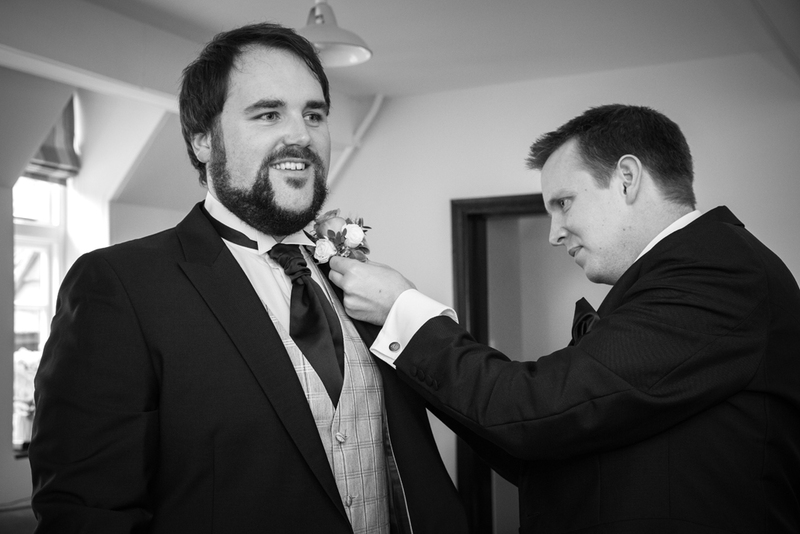 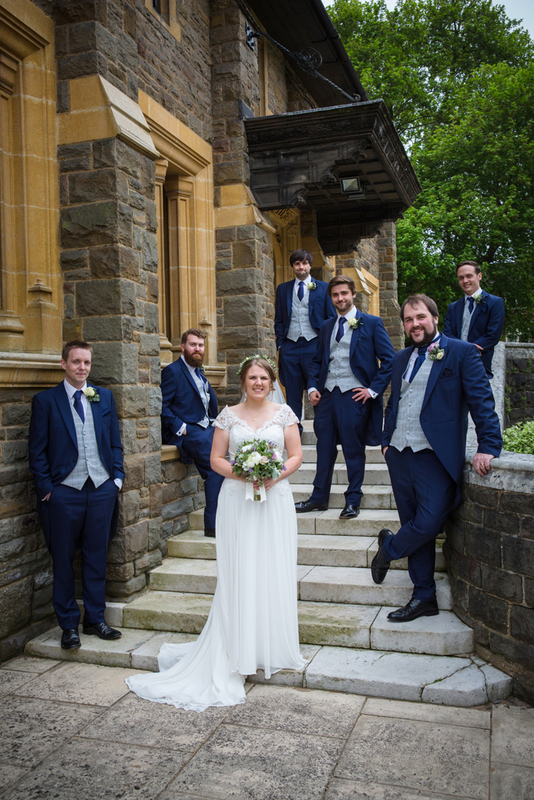 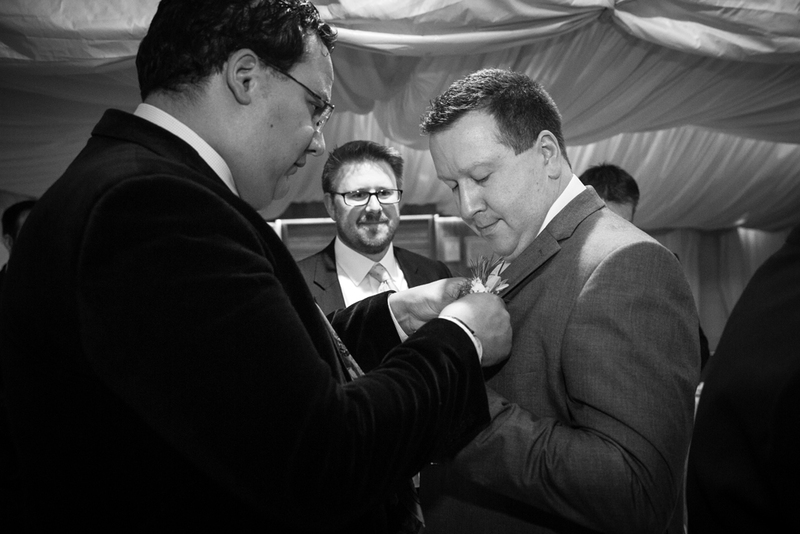 She captured the images of the boys suiting up & applying their buttonholes before making their way over to the chapel to greet the guests. 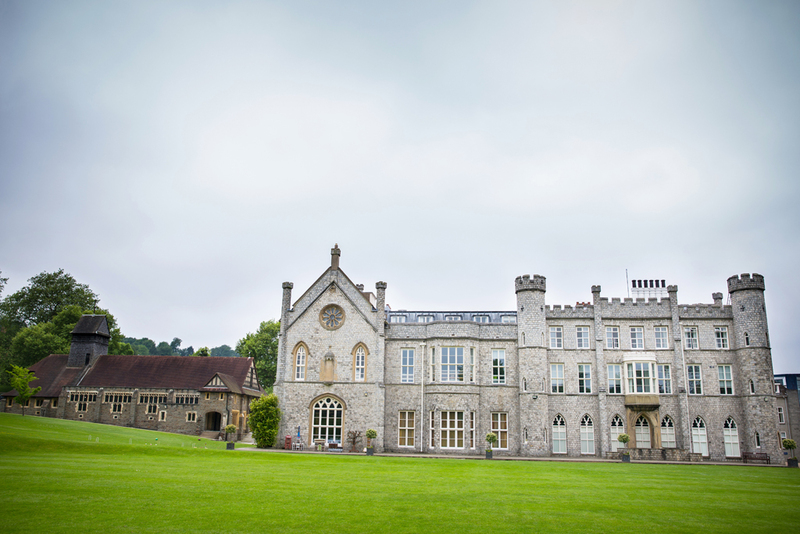 Wycombe Abbey is a lovely school set within lovely grounds. 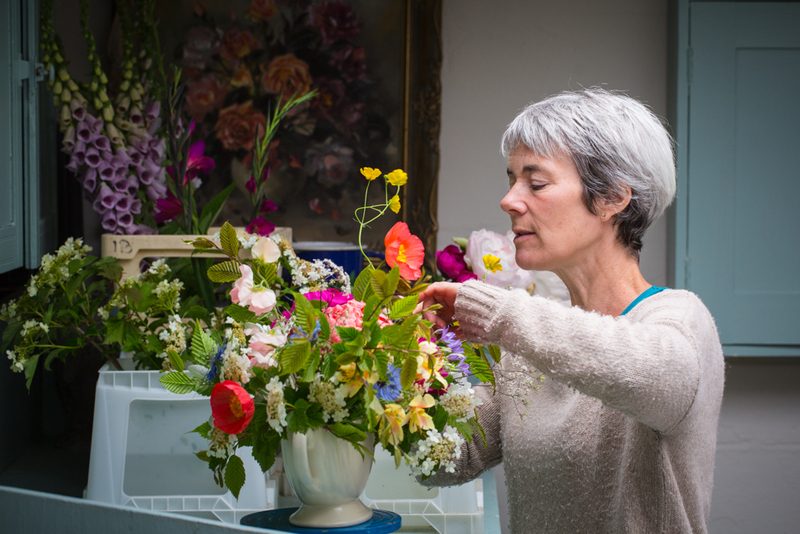 I do a lot of their photography so am very familiar with the school. 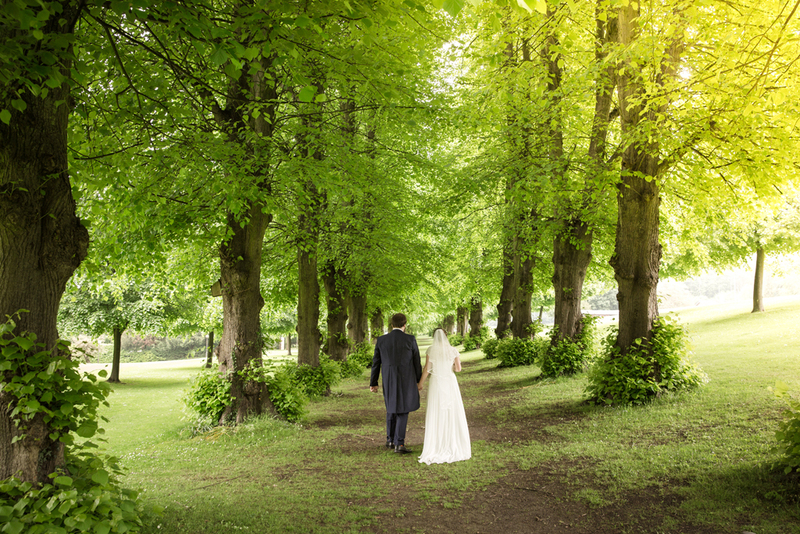 I am still always surprised that there is such interesting buildings & landscaped grounds so close to the middle of High Wycombe. 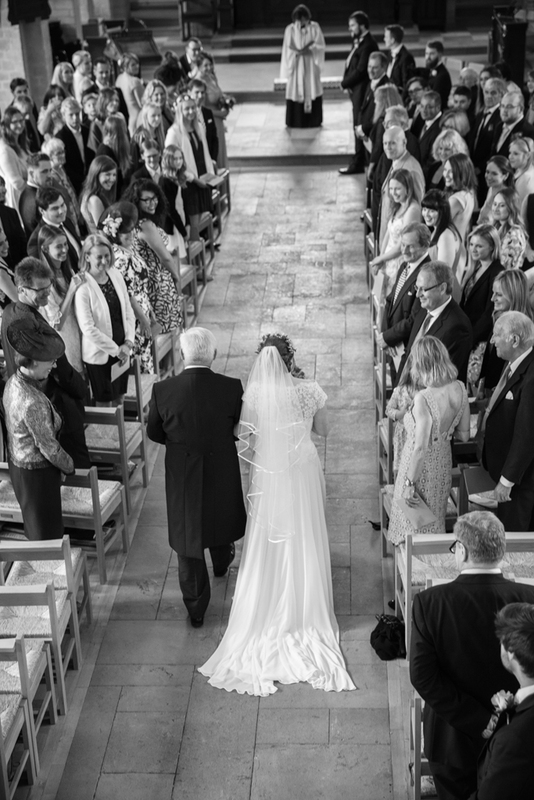 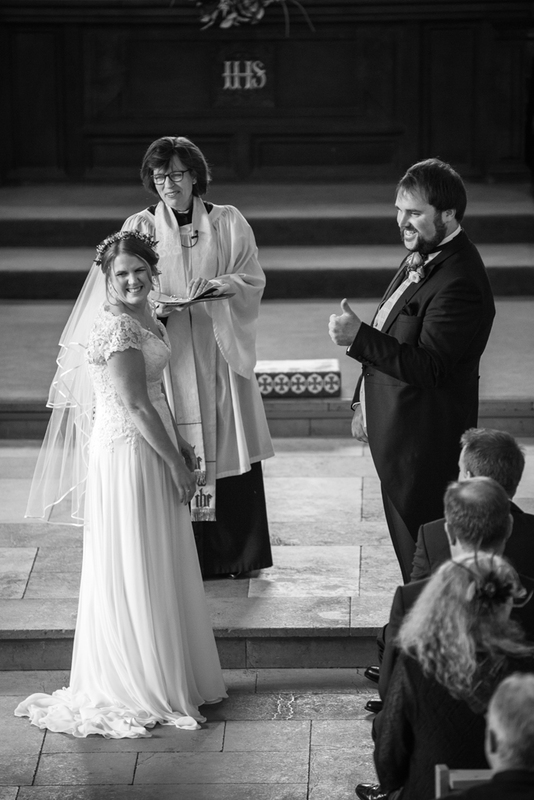 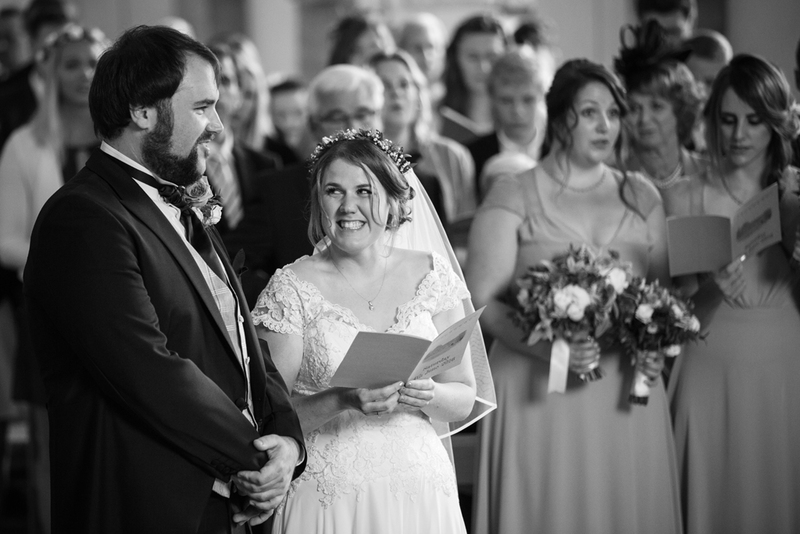 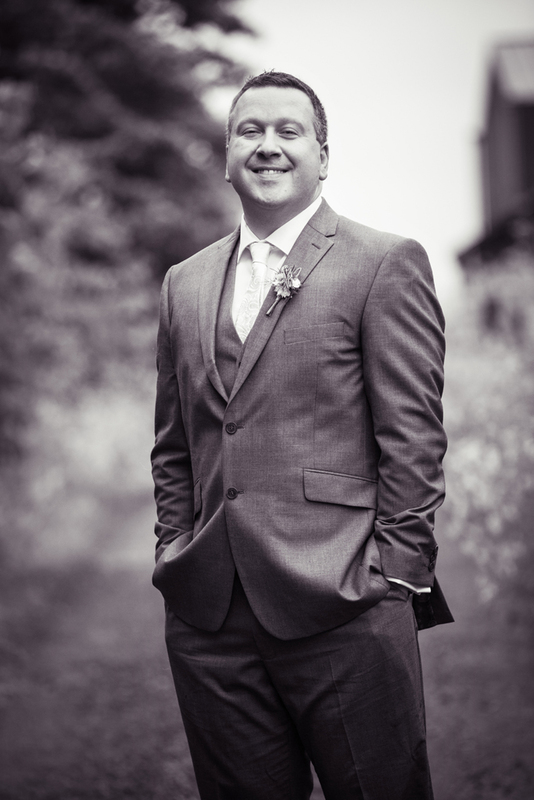 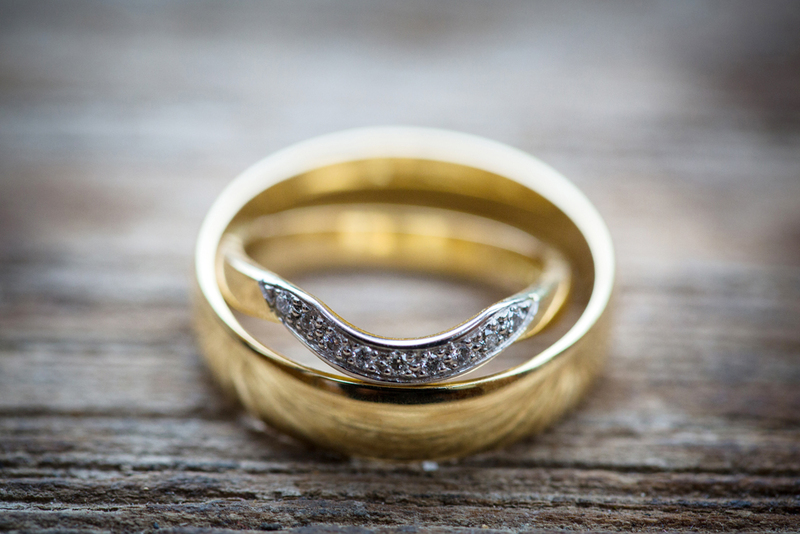 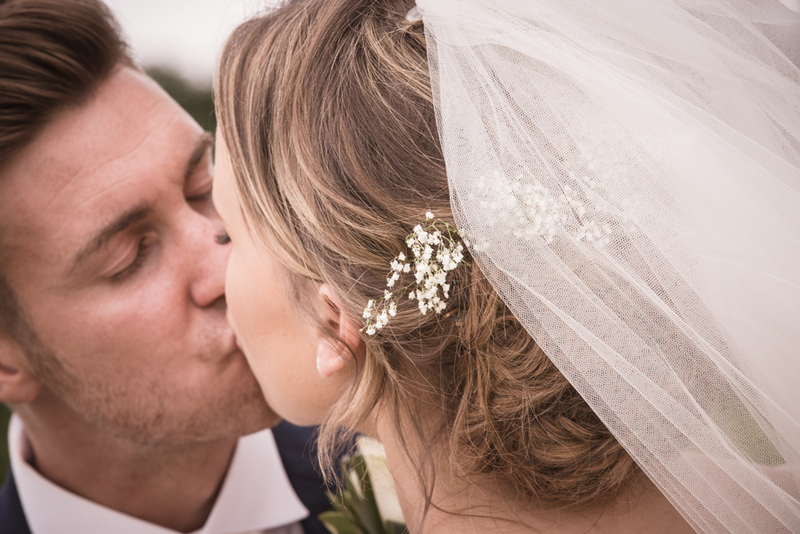 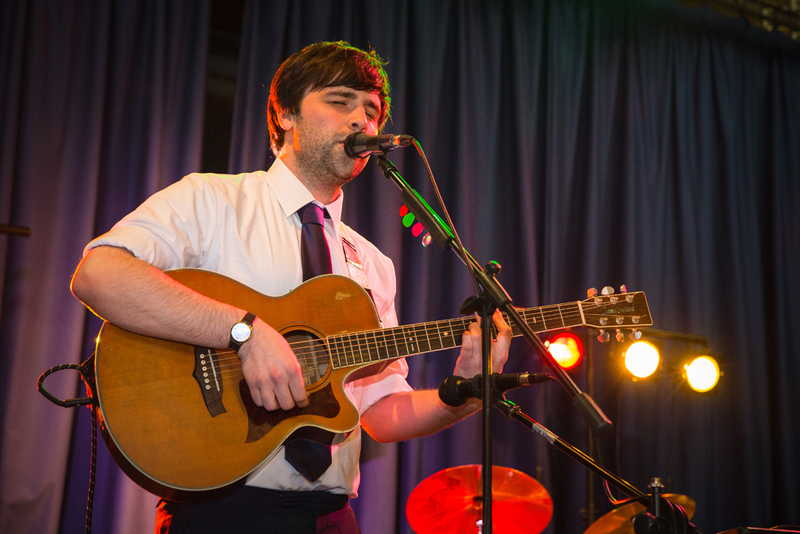 It is only possible to have your wedding there if you have a connection to the school such as a former pupil or member of staff. 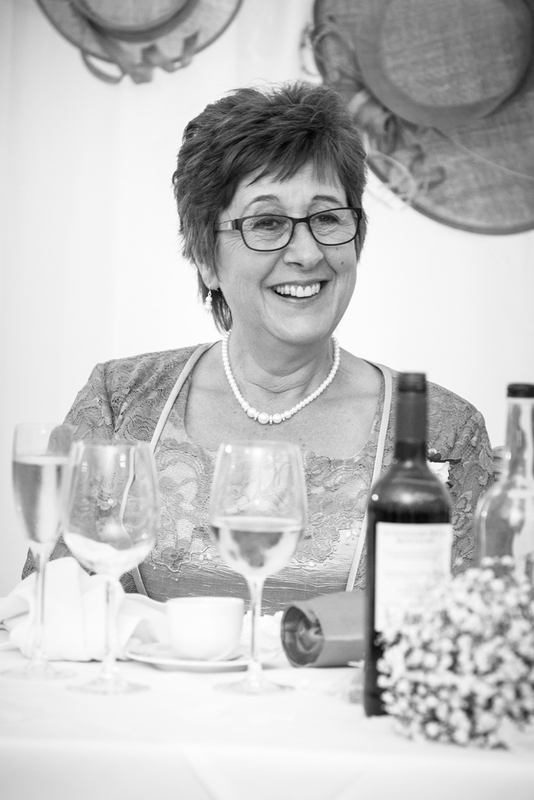 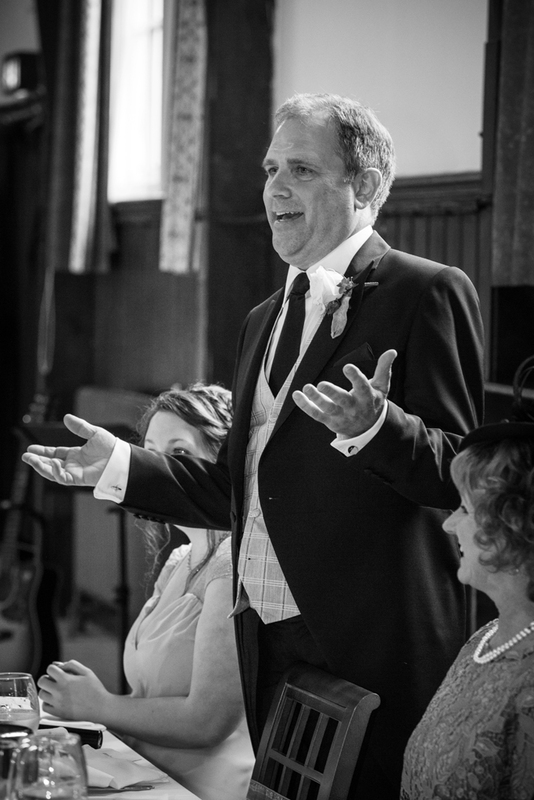 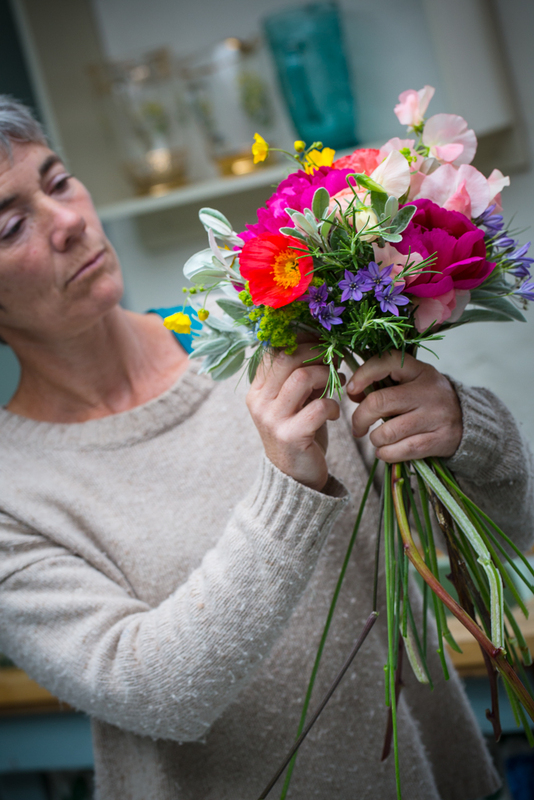 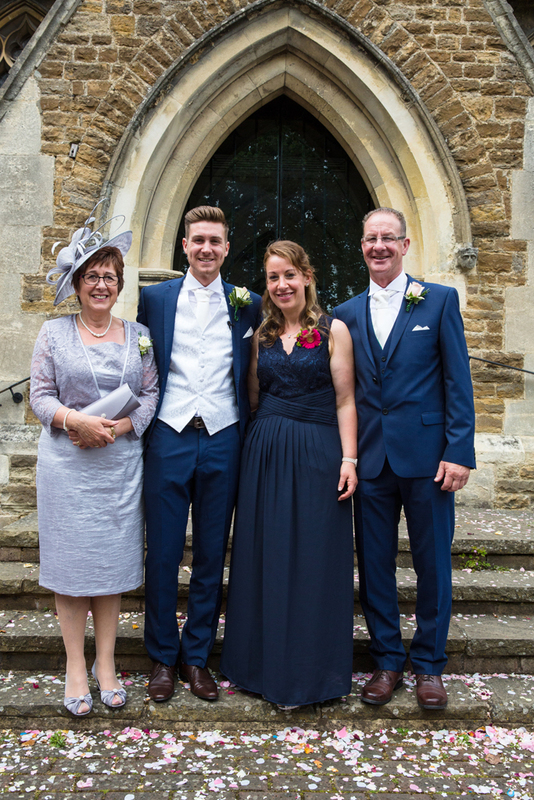 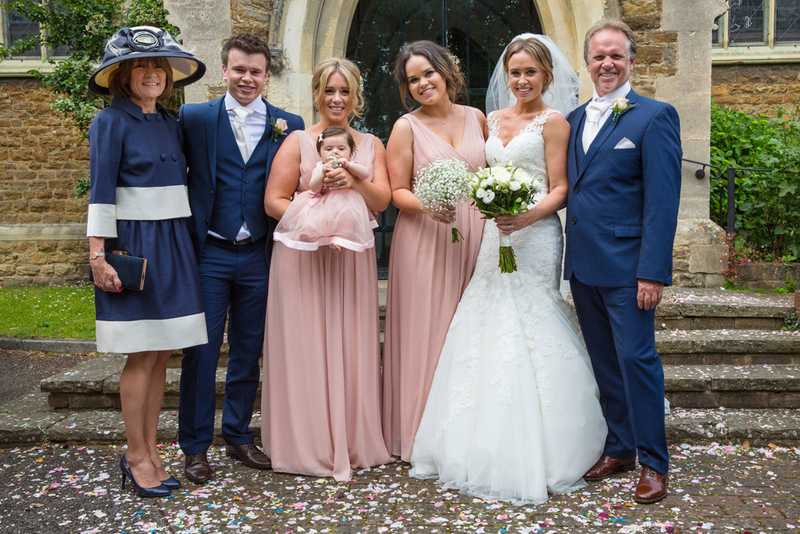 Chris’ Mum is a House Mistress at the school so they were thrilled to be able to have their wedding there. 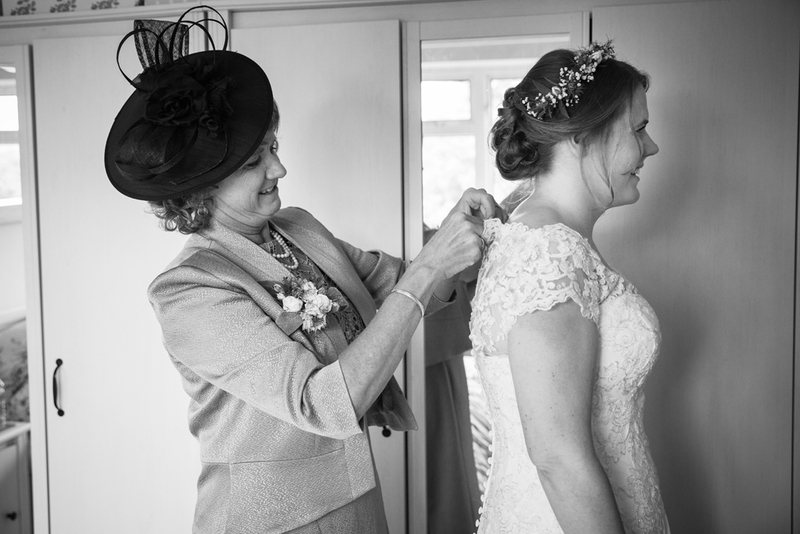 Meanwhile, whilst Kiti was with the lads I made my way over to Chinnor to Chris & Gro’s home to photograph the bride getting ready. 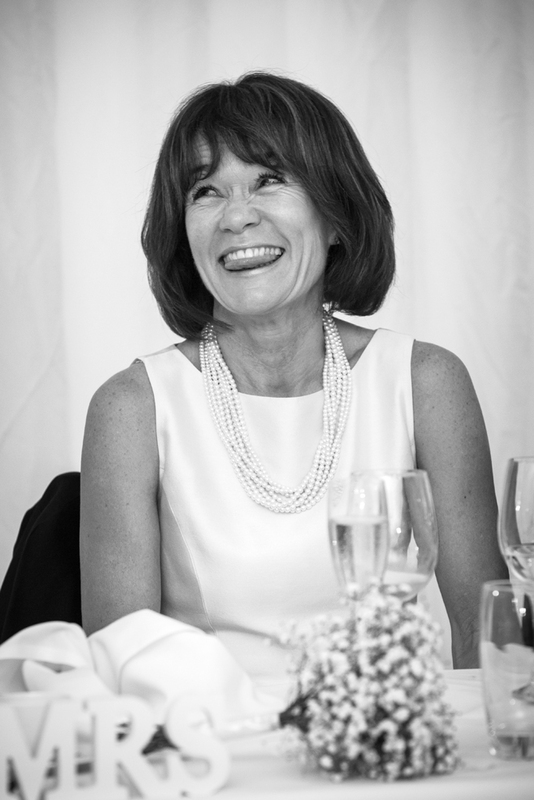 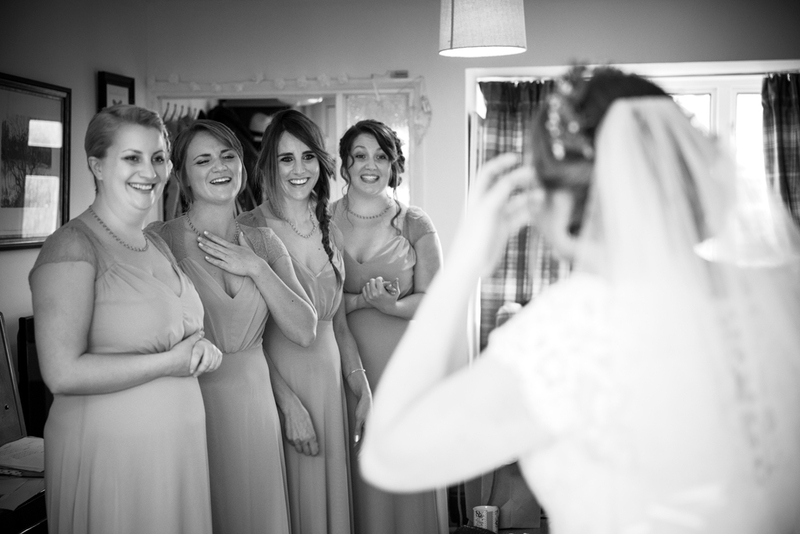 It was a lovely to be with the girls right from the start of the day & Gro was such a relaxed & happy bride. 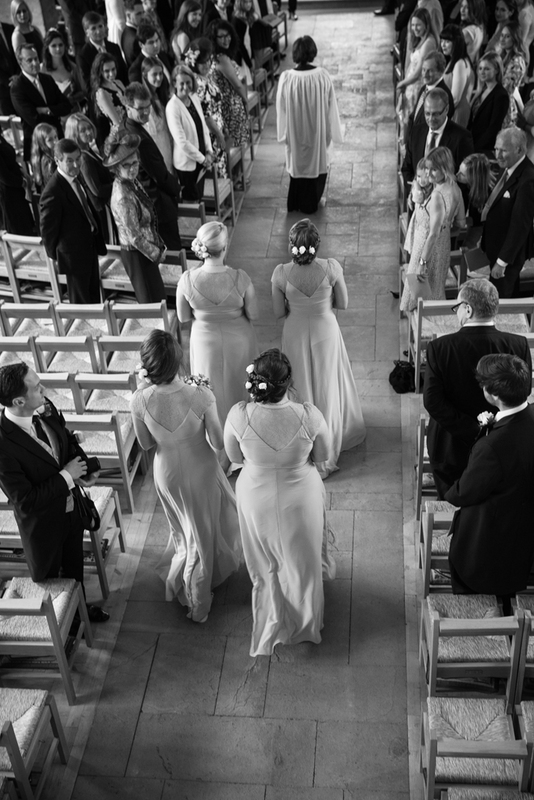 Once the glad rags were on it was time for me to fly back to Wycombe Abbey to make sure I was there & ready for the bride’s arrival. 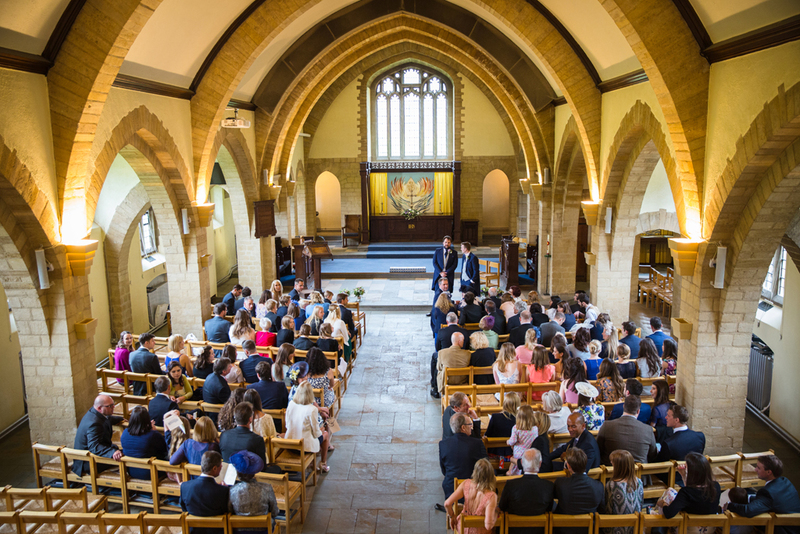 The chapel at Wycombe Abbey is lovely & has a mezzanine level where Kiti had located herself. 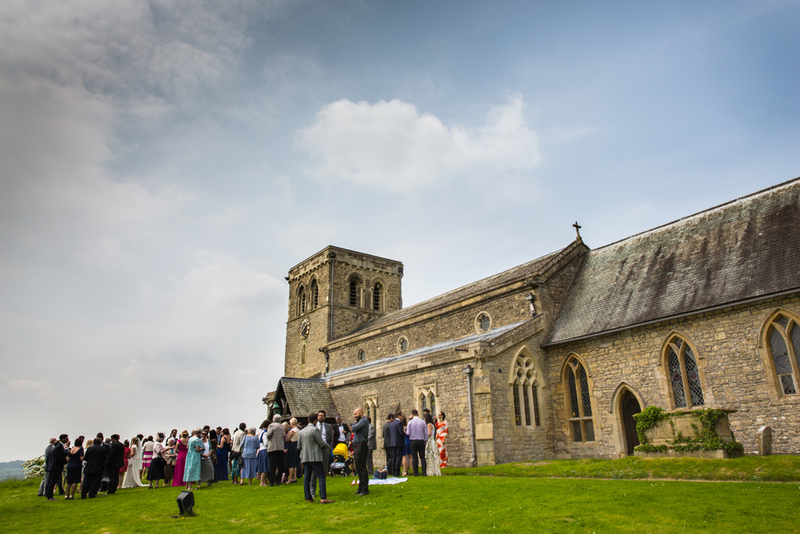 This was perfect as it gave her a fantastic vantage point to capture some unobstructed views of the ceremony. 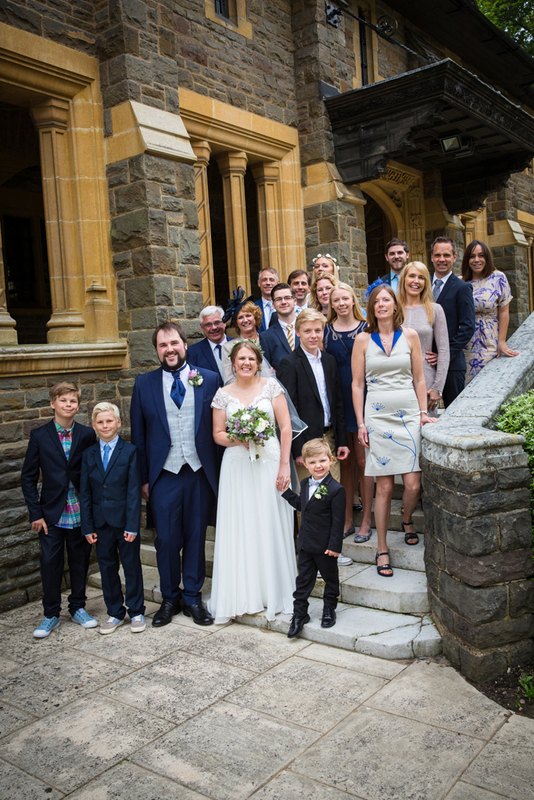 After a beautiful service everyone gathered outside for a drinks reception & we did the group shots of the steps of the chapel. 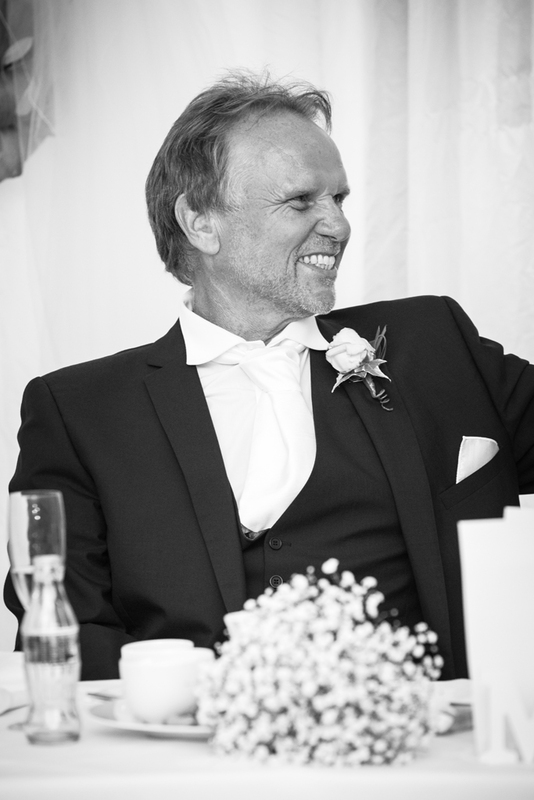 When I first moved up country from Cornwall I worked for a photographic studio who used a local picture framing company. 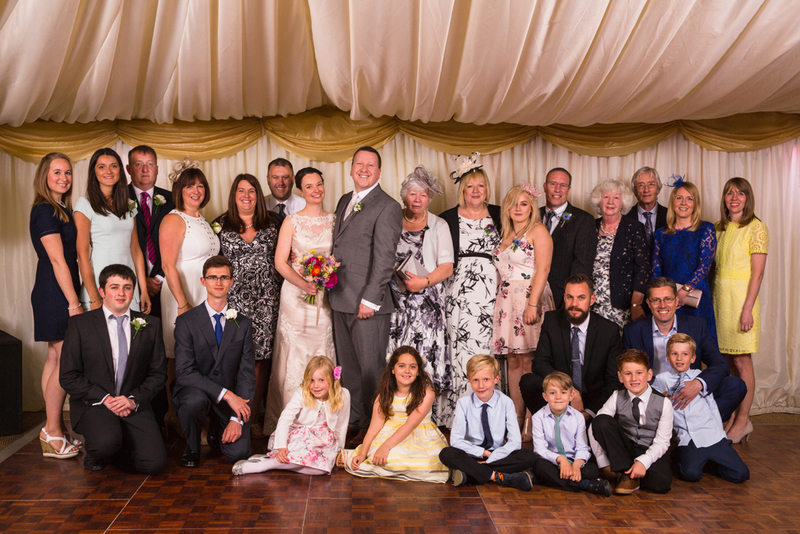 I continued to use the same company for all my framing (once my lovely wife had stopped being a Picture Framer!) 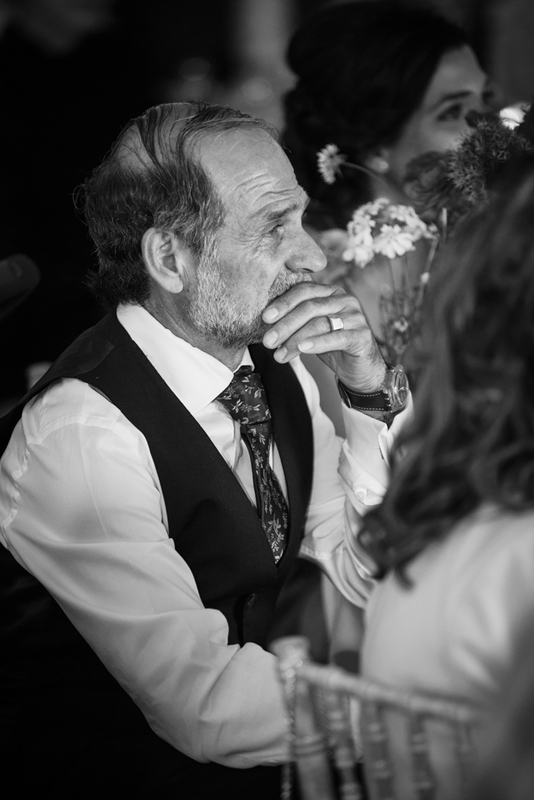 for many years. 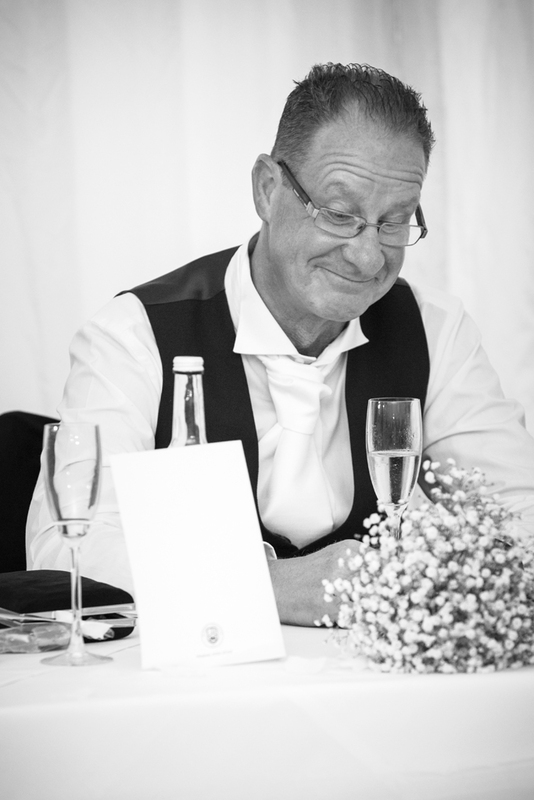 It was a fantastic, bespoke framers & the owner was Chris’ granddad Neil. 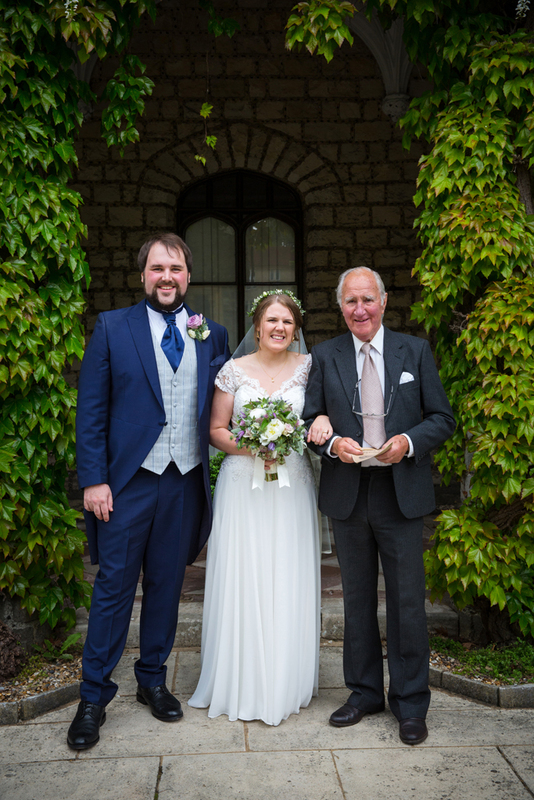 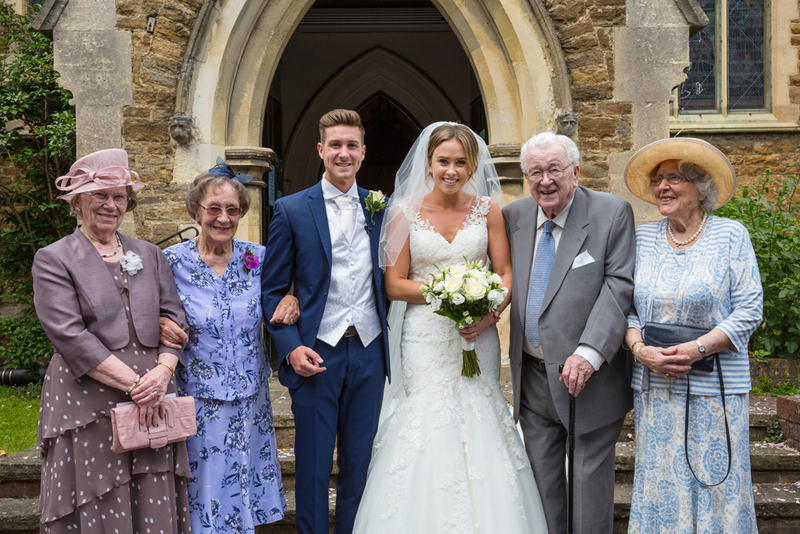 He left after the service but it was great to see him & get some shots of the proud grandfather with the bride & groom! 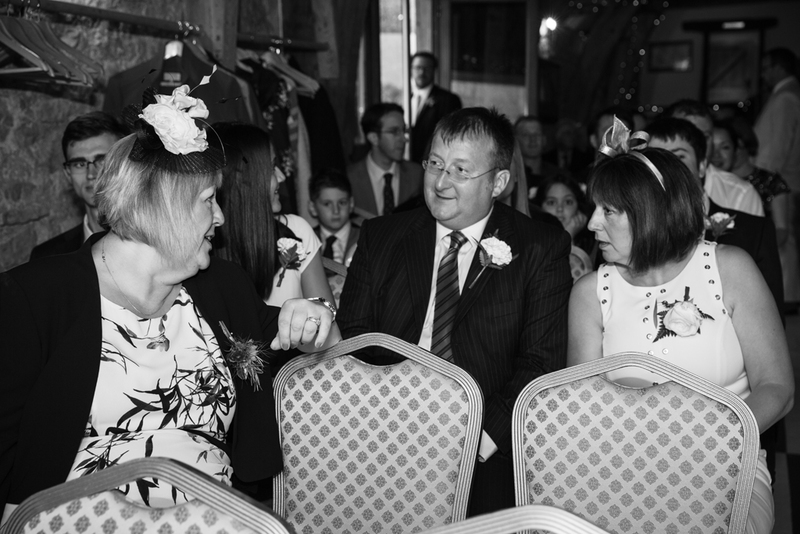 We then organised the guests to line either side & the chucked the confetti & blew bubbles as Gro & Chris wandered along! 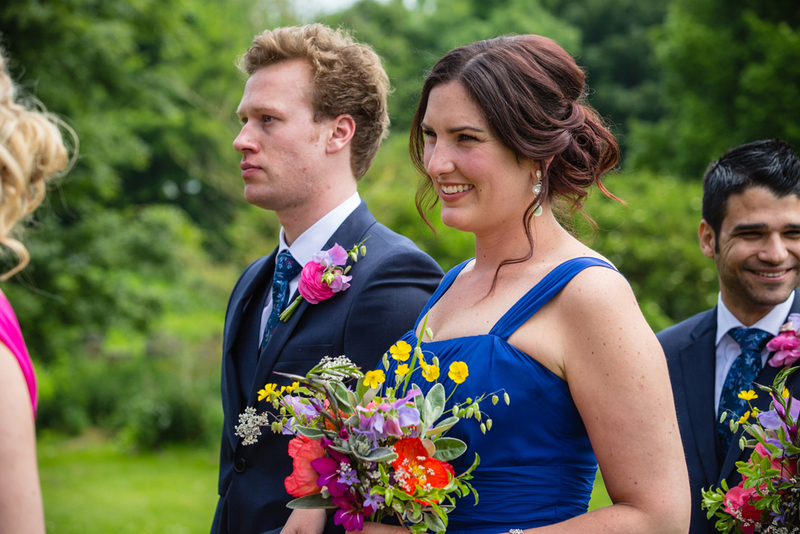 Whilst the guests mingled Kiti & took Gro & Chris into the grounds to capture some stylish shots of the two of them. 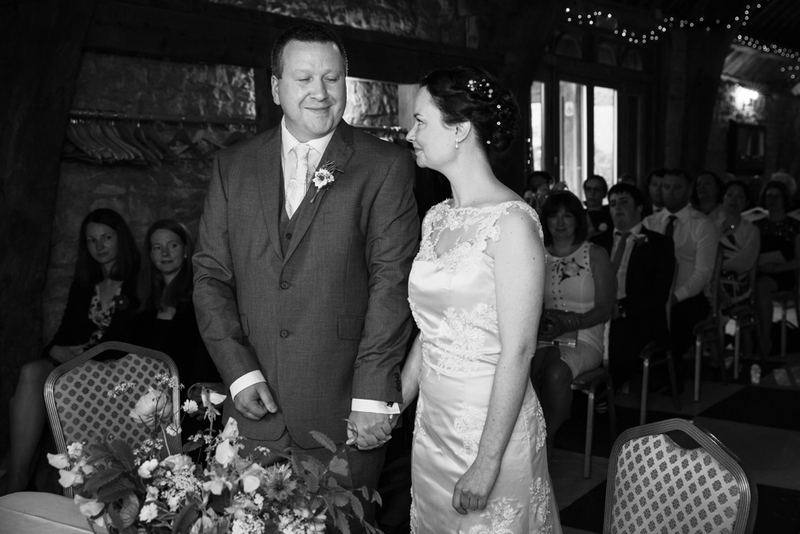 We then went back to the main hall for the wedding breakfast. 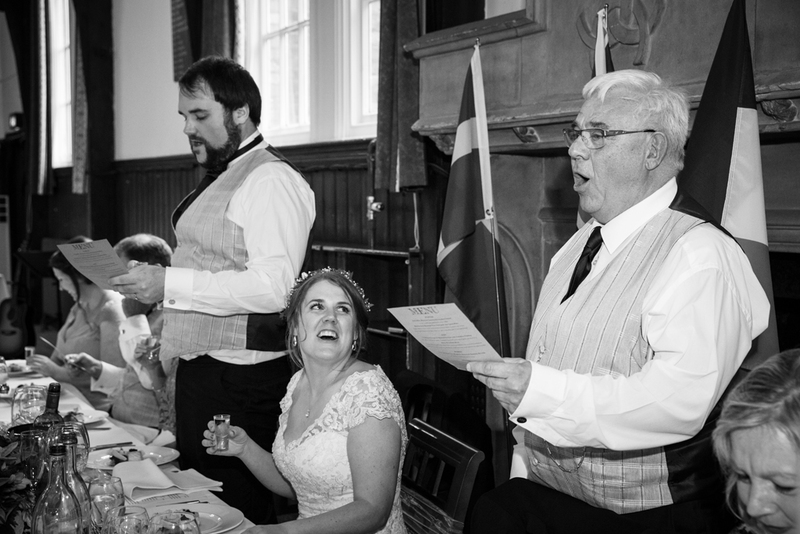 There were some fantastic speeches including musical performances, poetry & thanks to Gro’s Swedish heritage a schnapps toast! 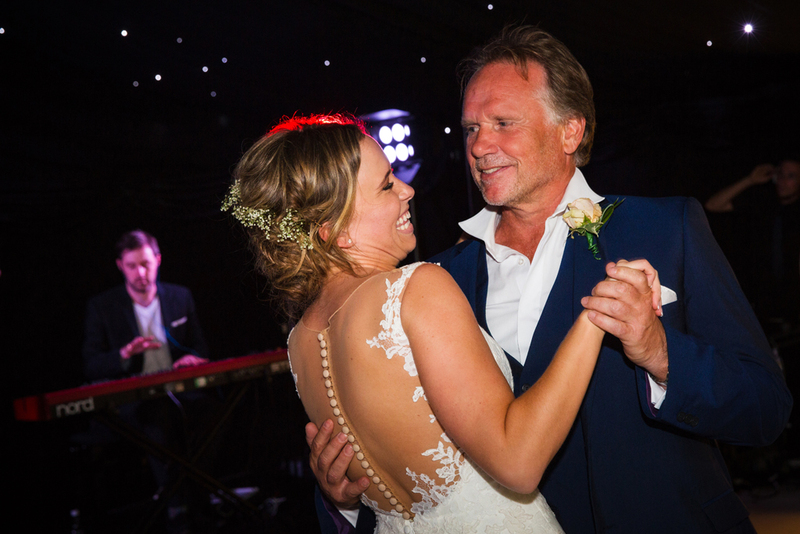 After the speeches it was time for the another musical performance, this time by Chris’ brother, first dance & then everyone hit the dancefloor. 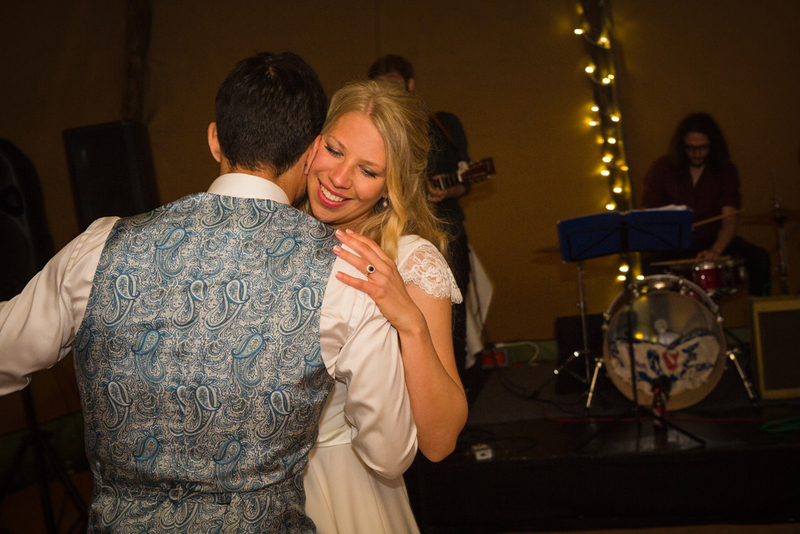 We made our way home as they were dancing the night away! 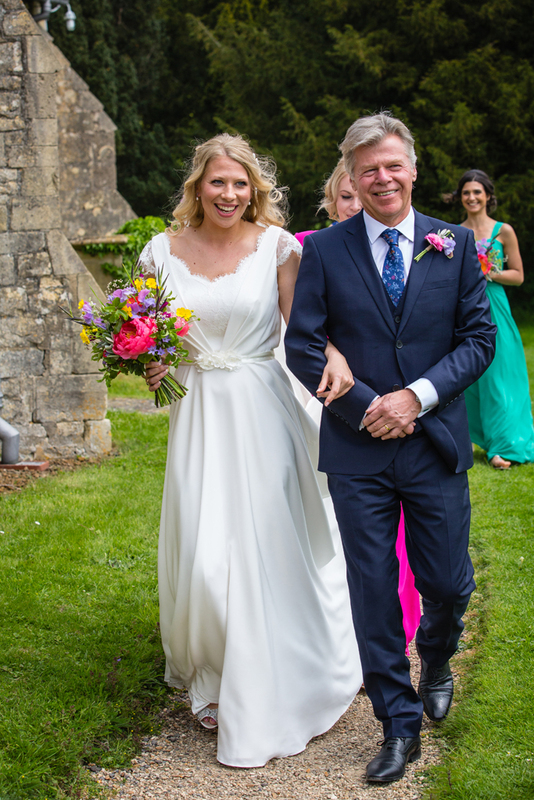 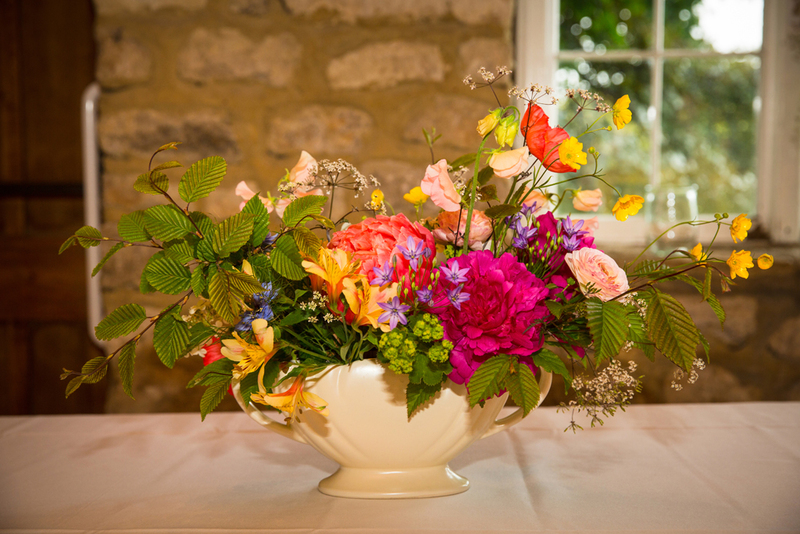 A beautiful late Spring morning saw Kiti & I heading off to the wedding of George & Kerrie in sunny Garsington & Eynsham. 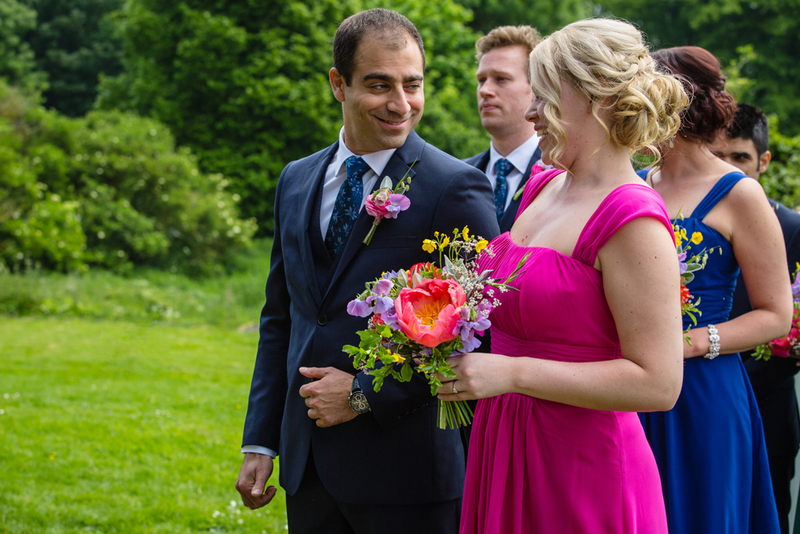 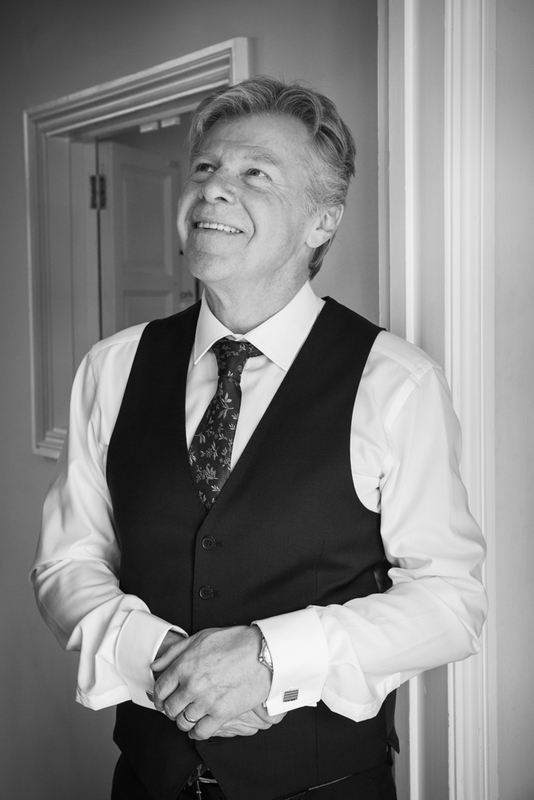 I dropped Kiti in Garsington where she was to capture some images of the groom getting ready with a difference – we’ll come back to that later. 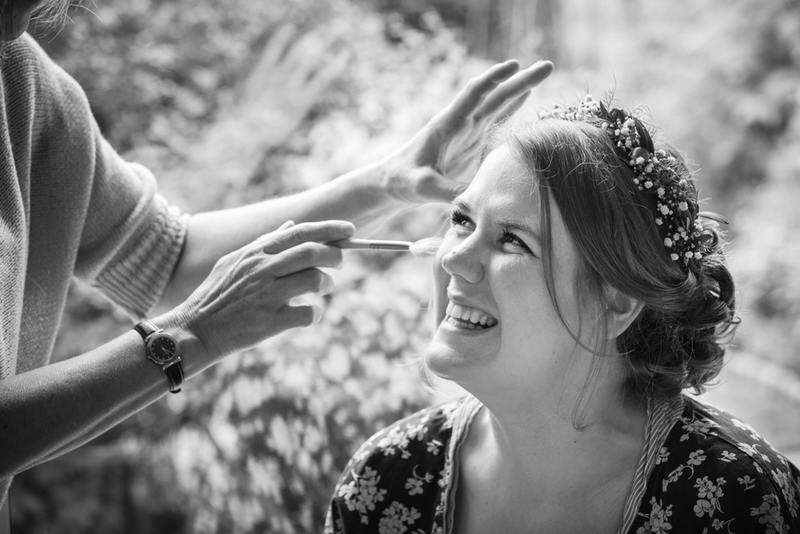 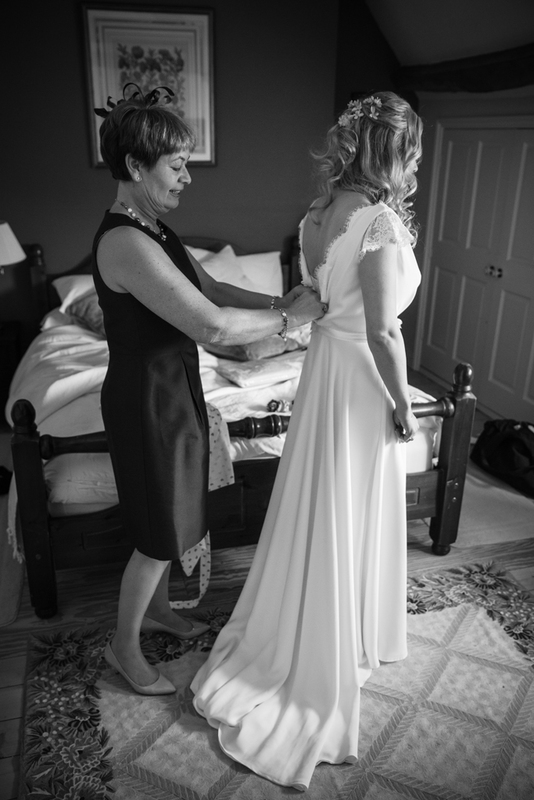 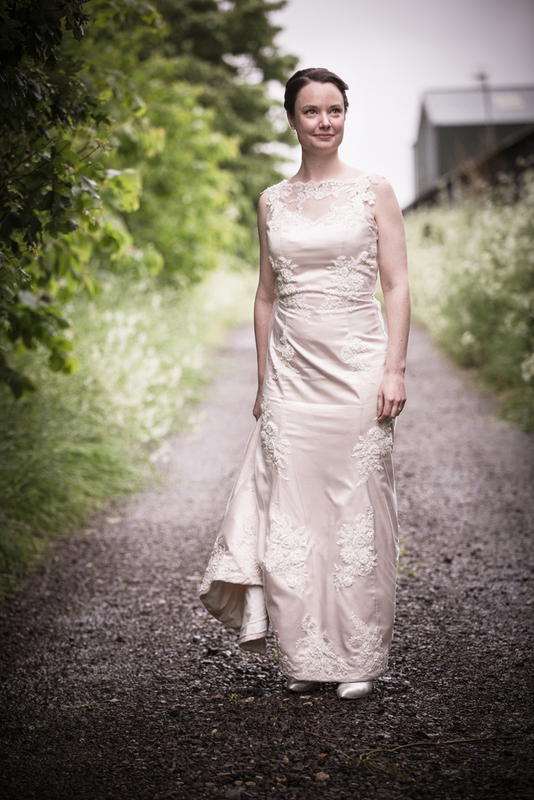 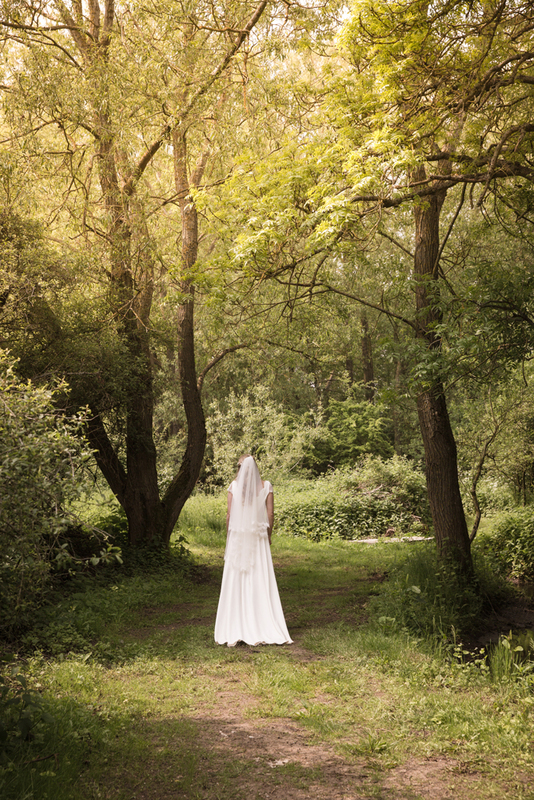 I headed off to the little village of Thrupp just north of Oxford where Kerrie, the bride, was getting ready. 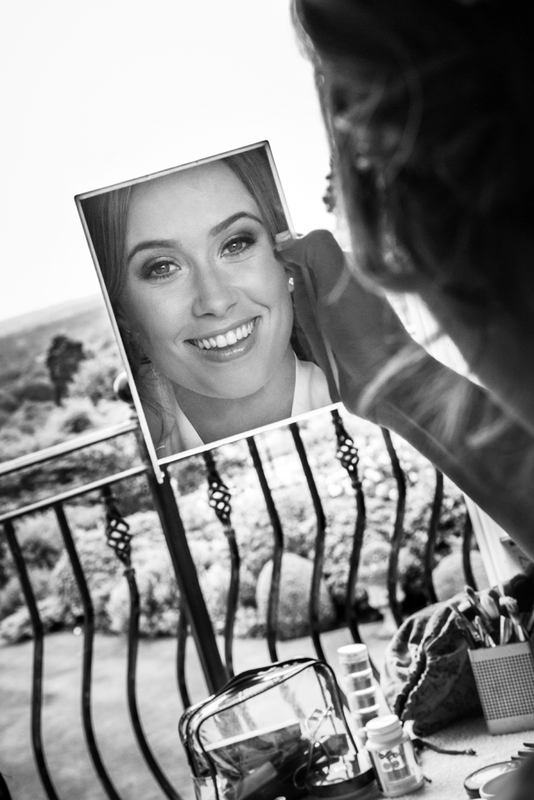 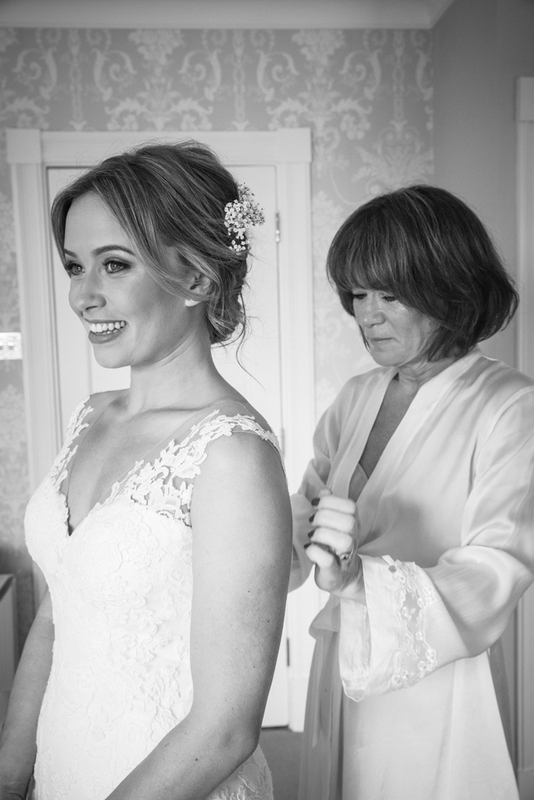 Kerrie’s family are from North Yorkshire so had hired a lovely coach house to stay in which was the perfect place for Kerrie to get ready in. 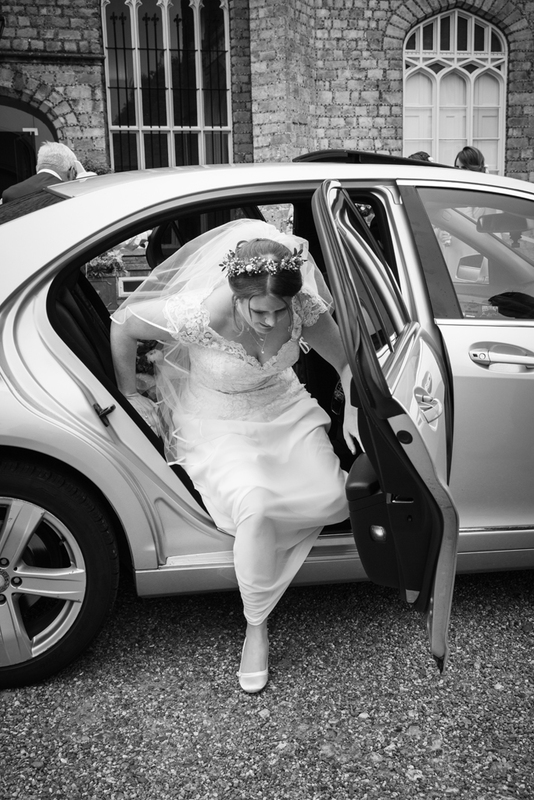 I captured some lovely images of Kerrie & her family getting ready but before long & I had to hop back into the car to get to the church before the bride. 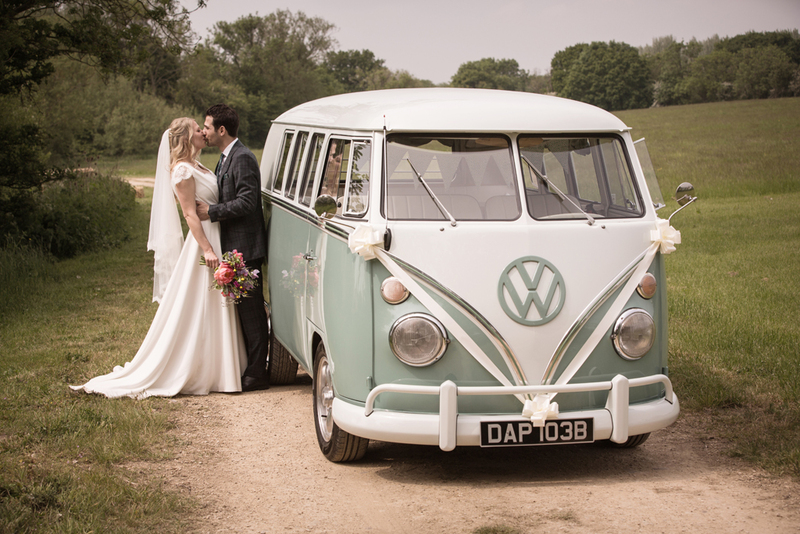 Kerrie was travelling by vintage VW camper van so I knew we wouldn’t be travelling at the same speed but the driver made excellent time & Kerrie arrived at the church on time. 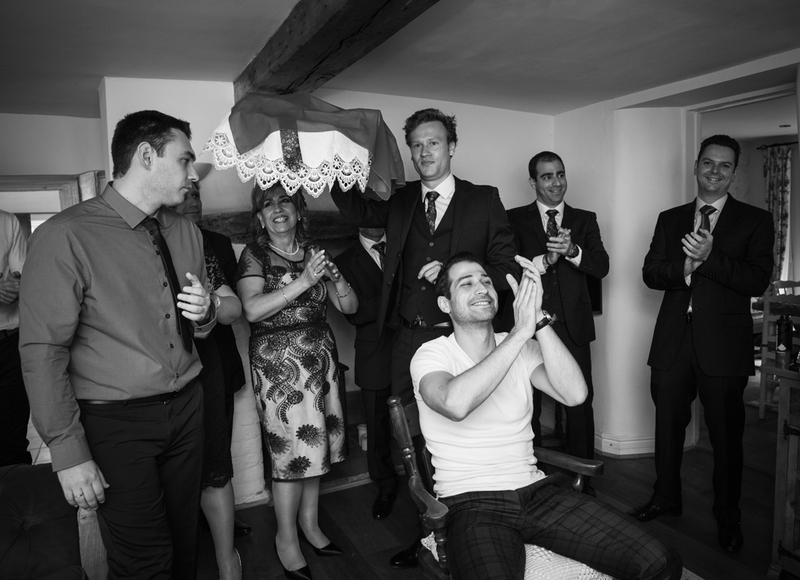 Meanwhile in George & Kerrie’s lovely cottage in Garsington where there was a houseful & the party had already started! 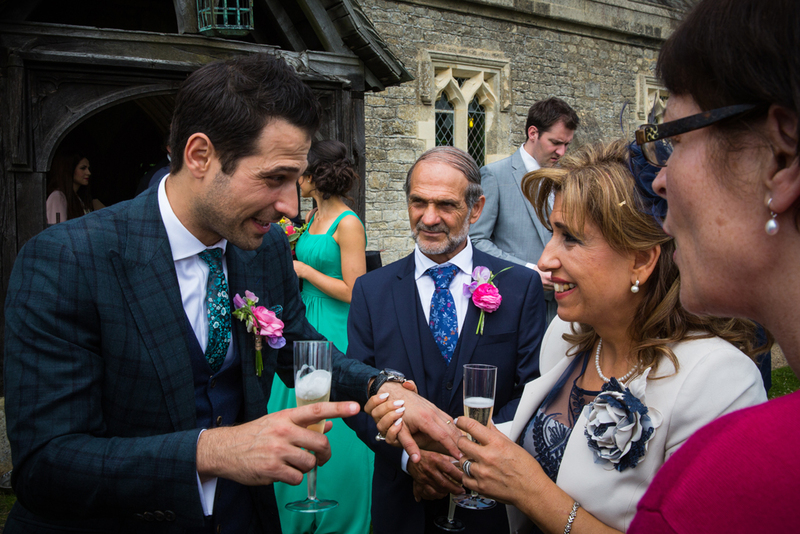 George is originally from Cyprus & there are some important traditions to be celebrated before the service. 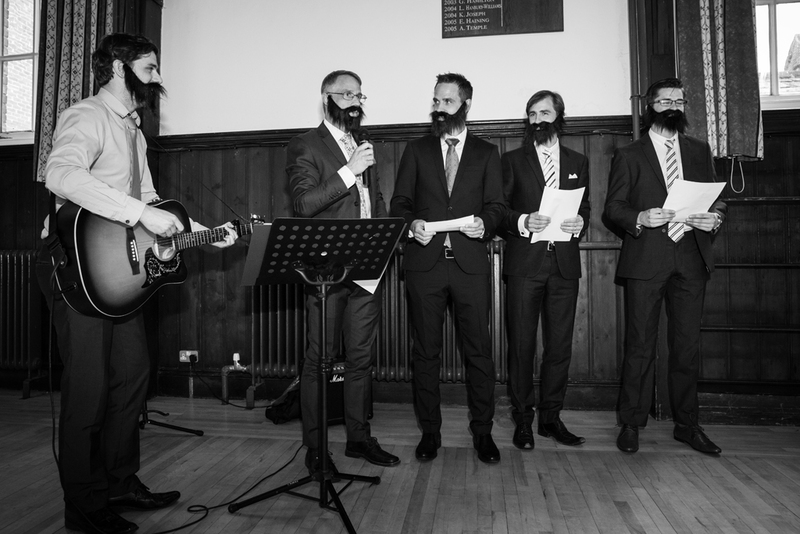 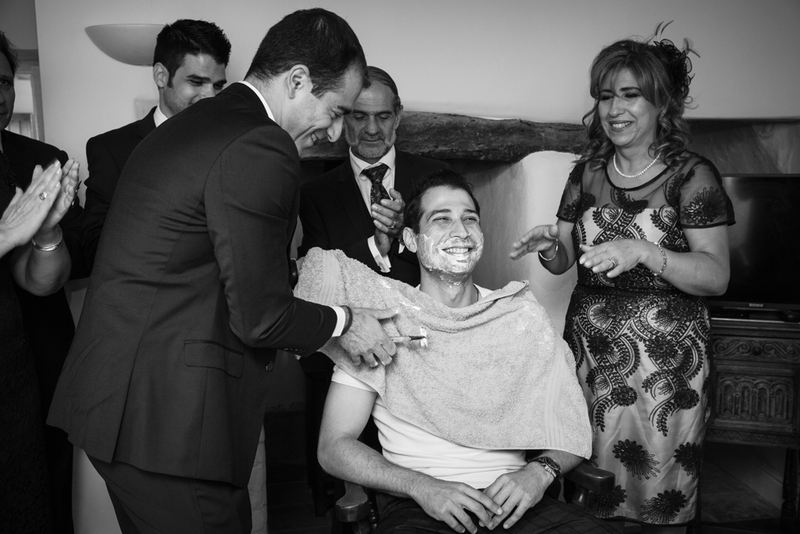 The Best Man shaves the Groom in the presence of his family & friends. 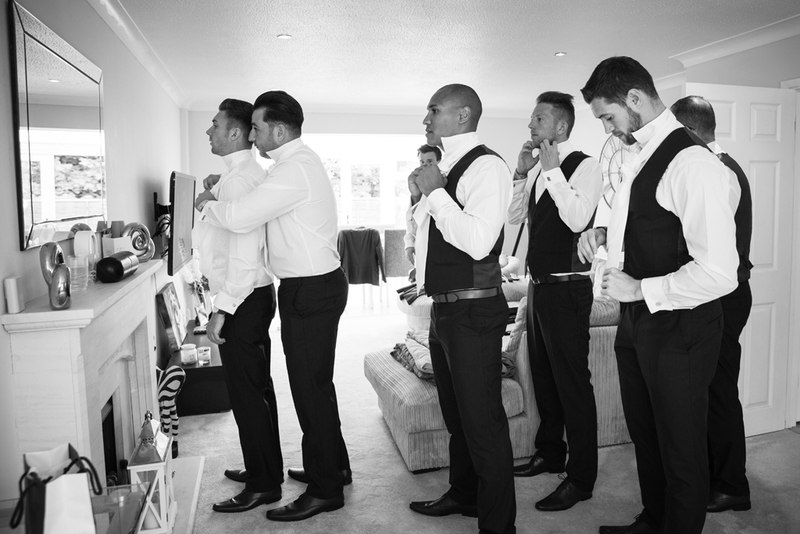 He then dresses the Groom in his shirt, waistcoat, tie & suit while music plays. 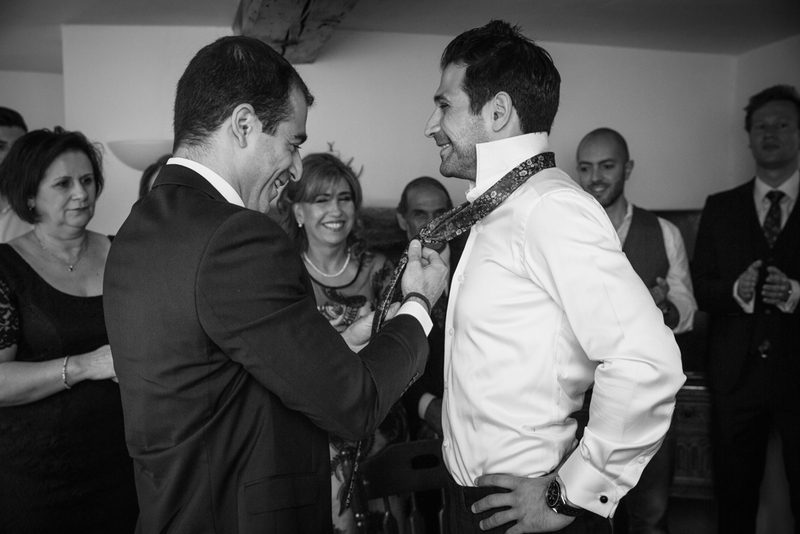 His friends & family then take turn to wrap a red scarf around the Grooms waist as a symbol of his fertility. 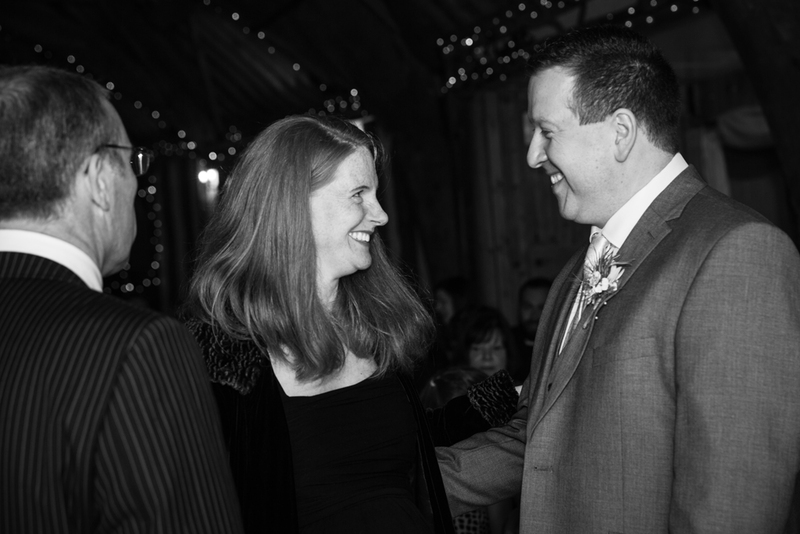 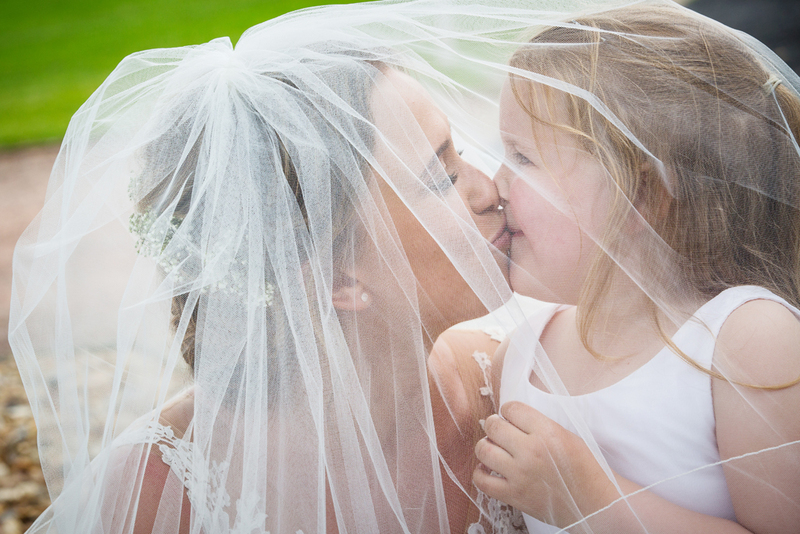 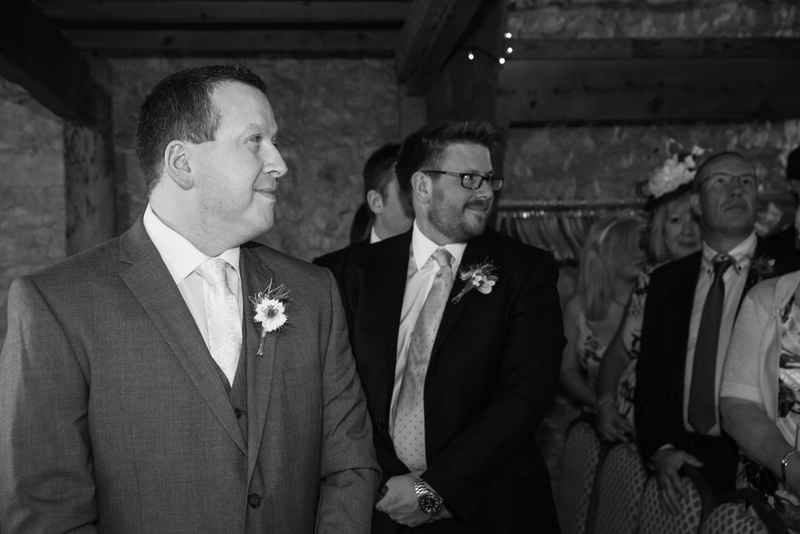 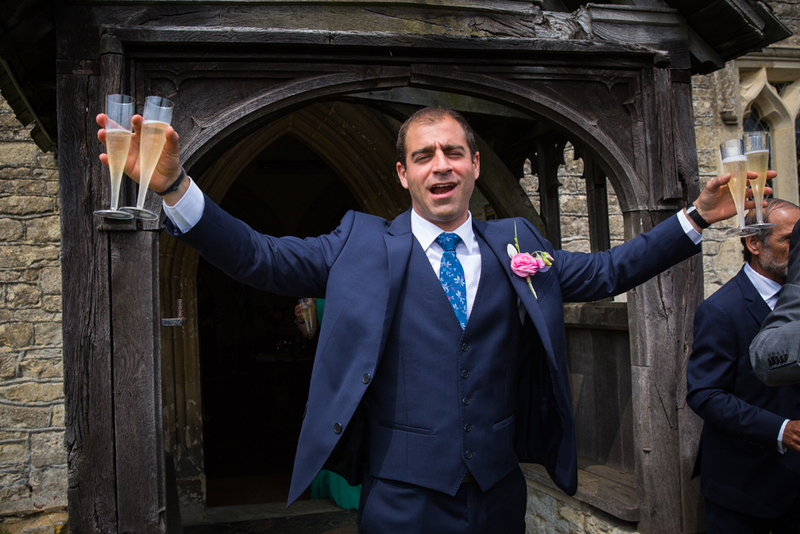 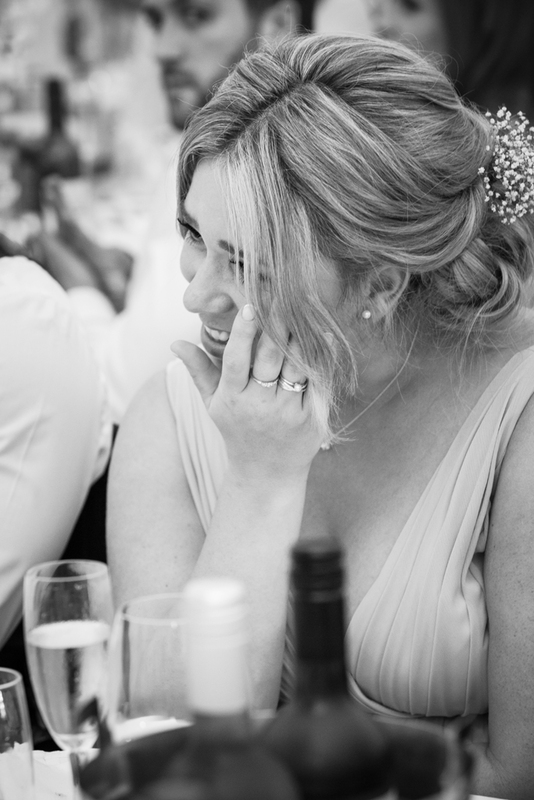 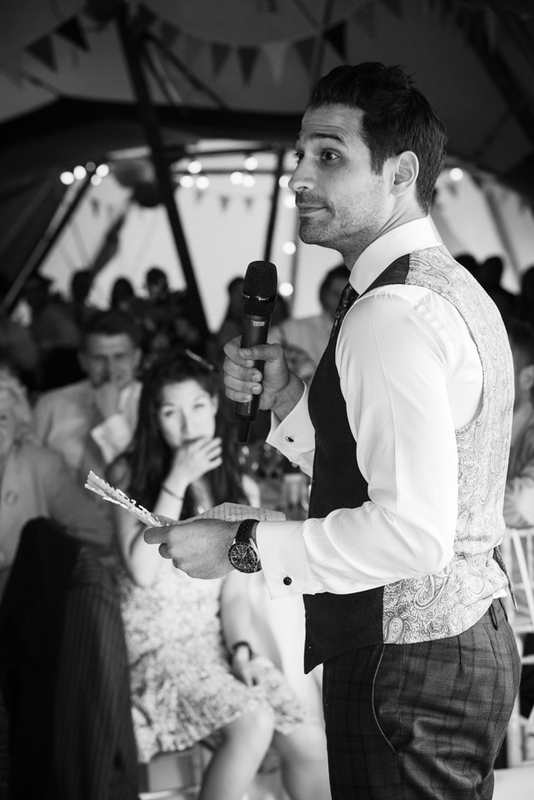 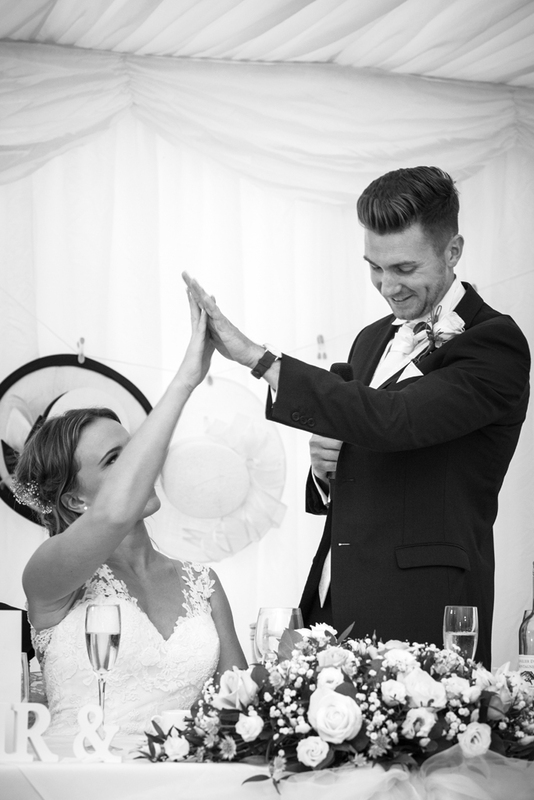 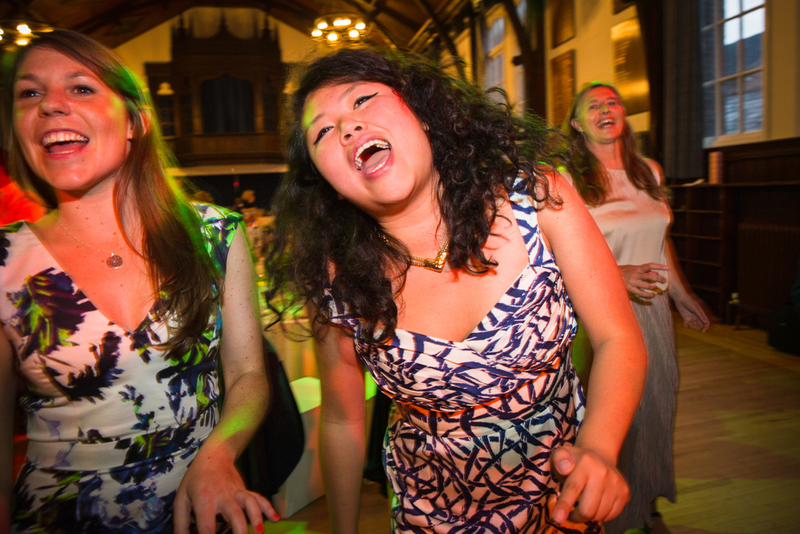 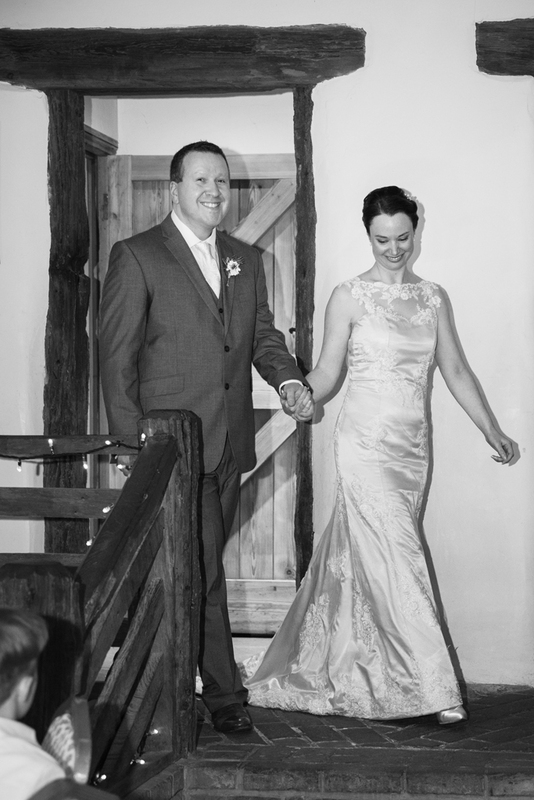 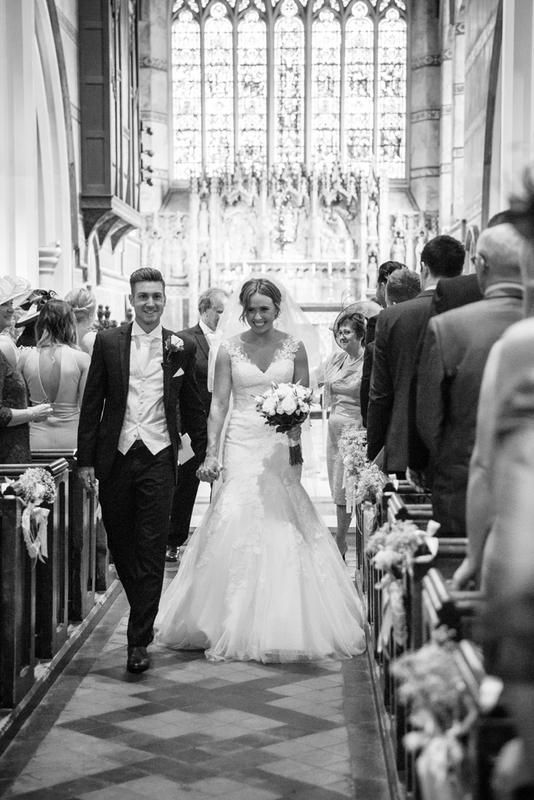 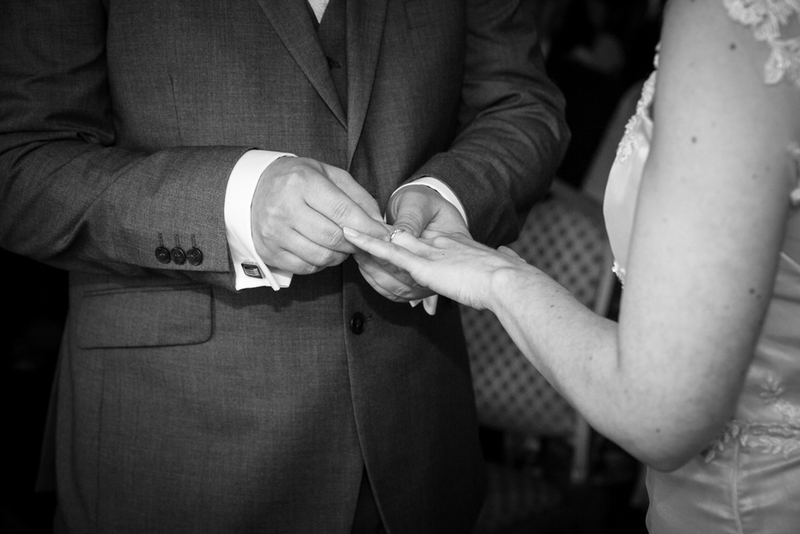 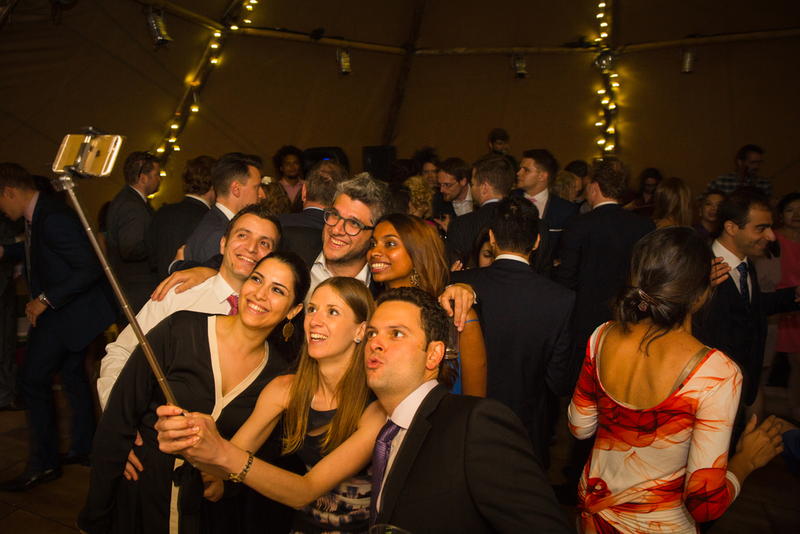 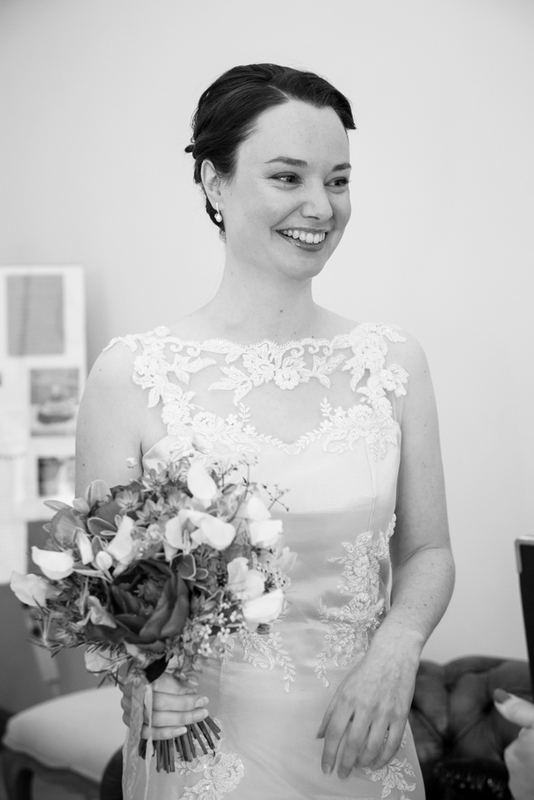 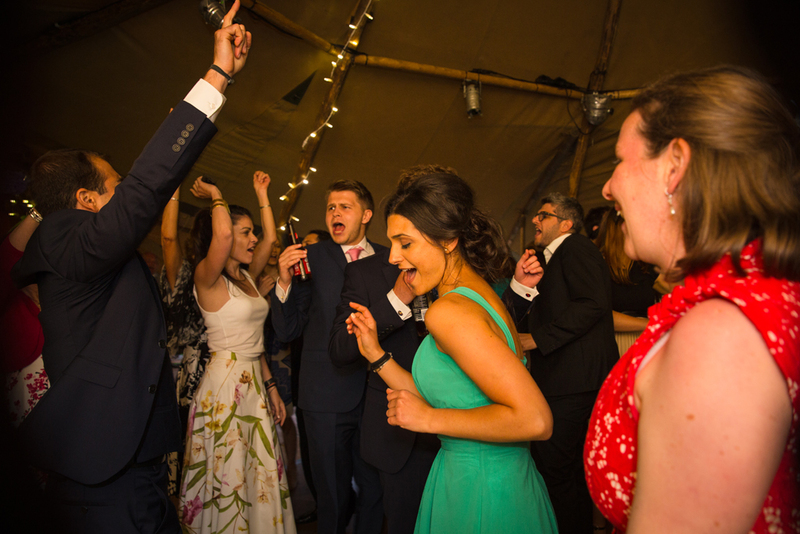 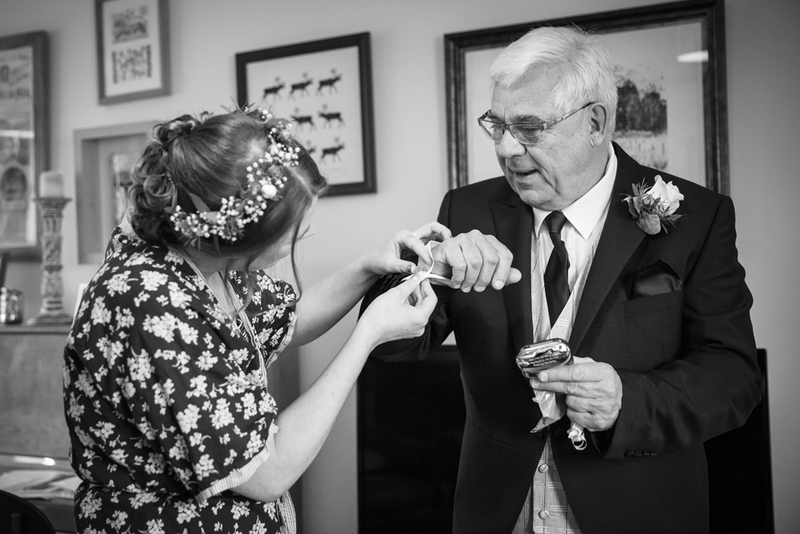 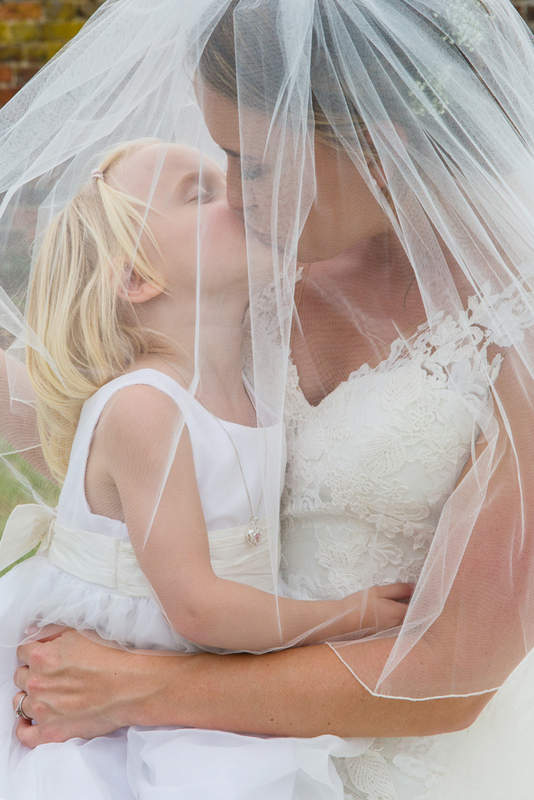 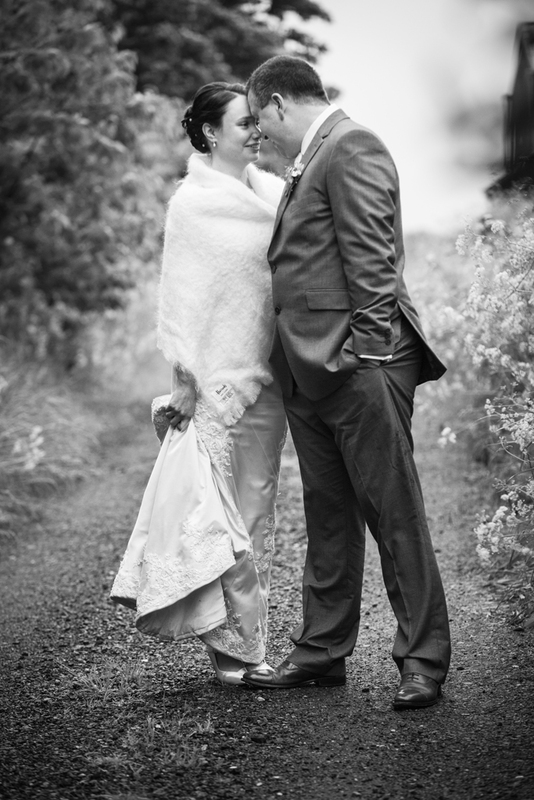 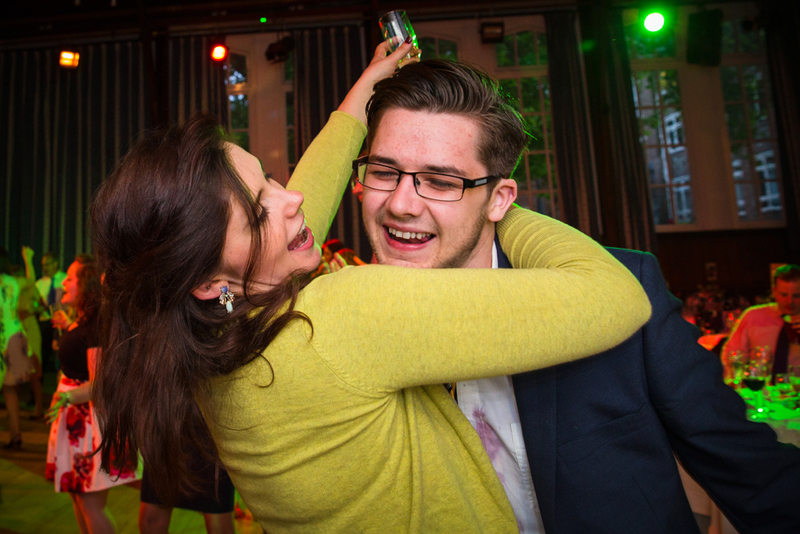 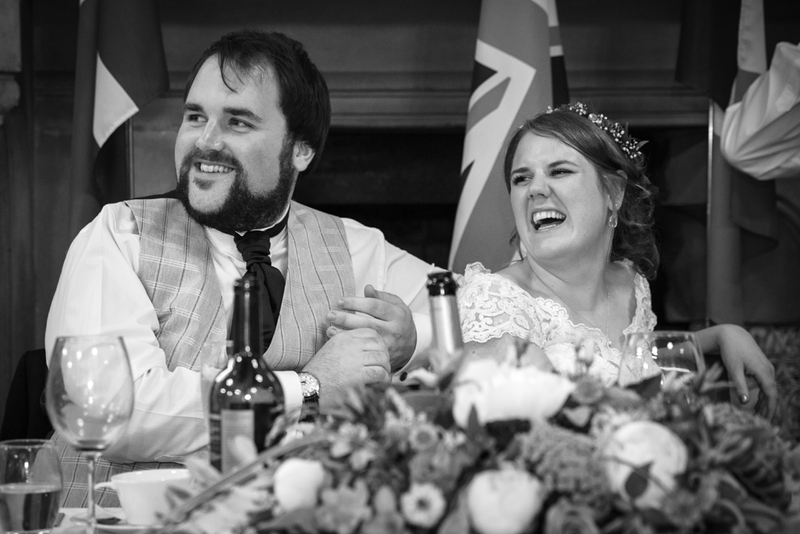 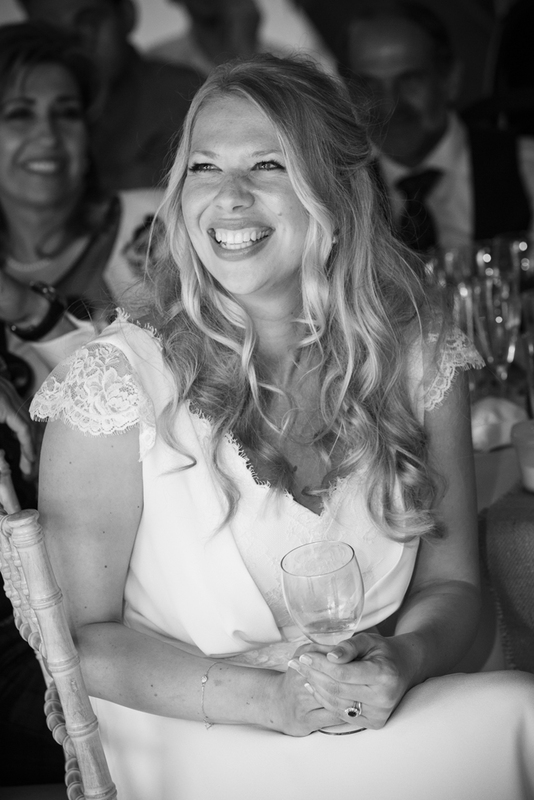 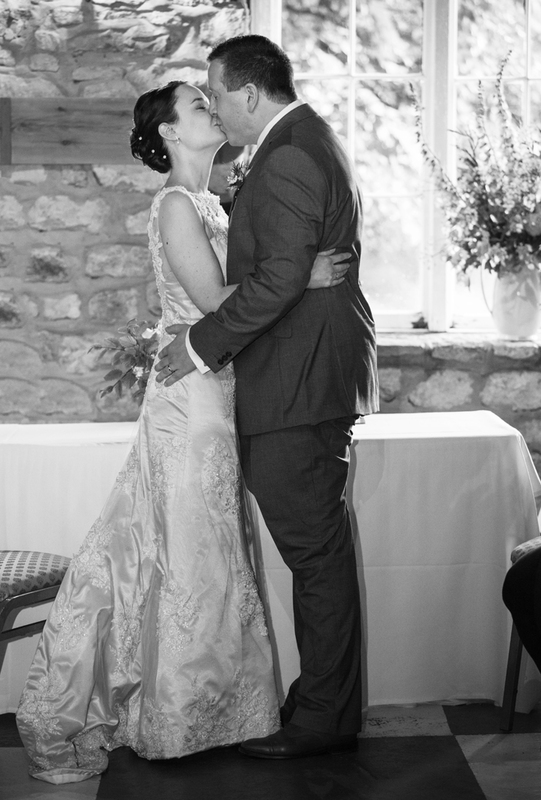 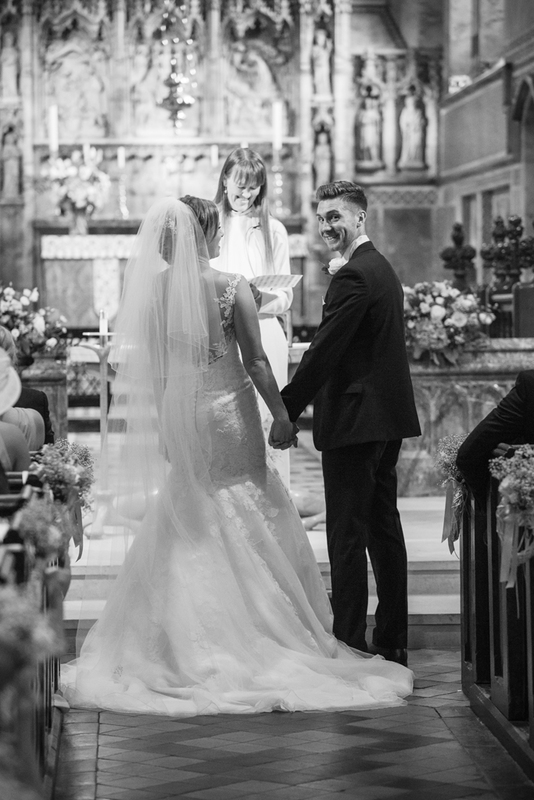 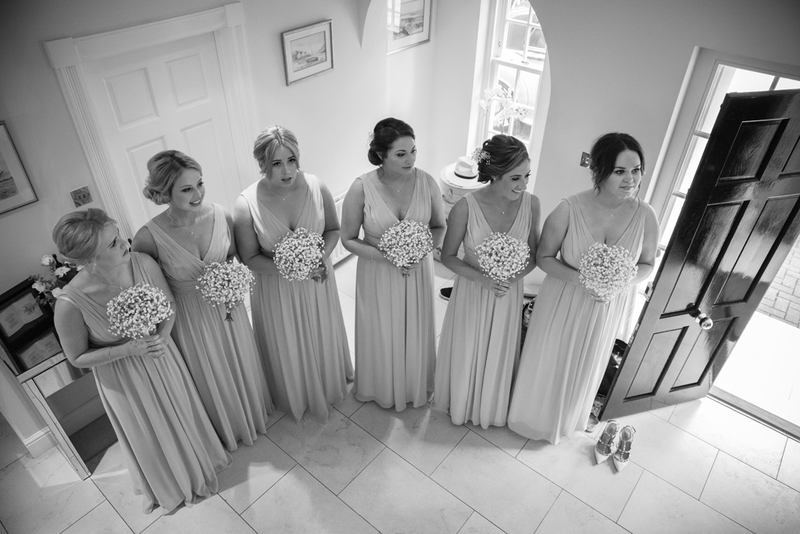 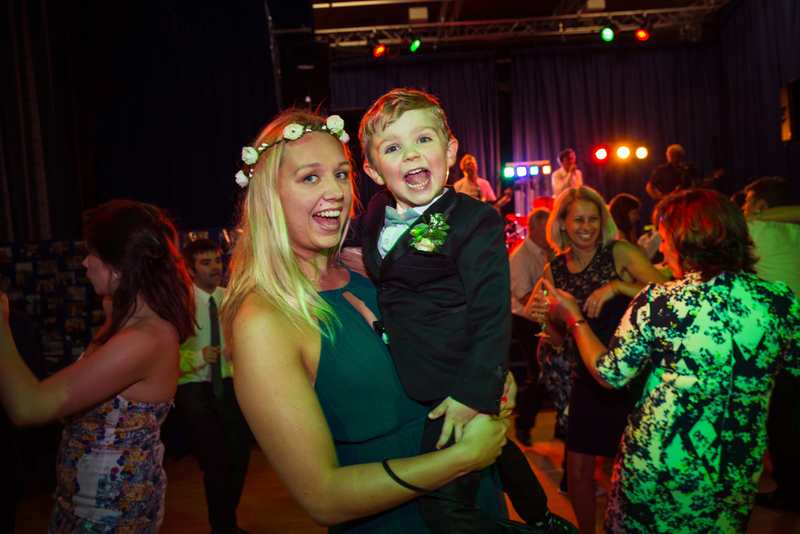 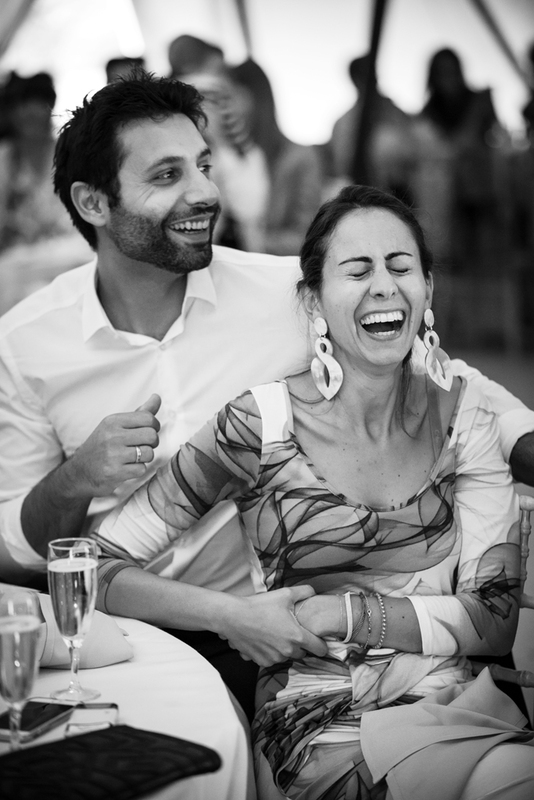 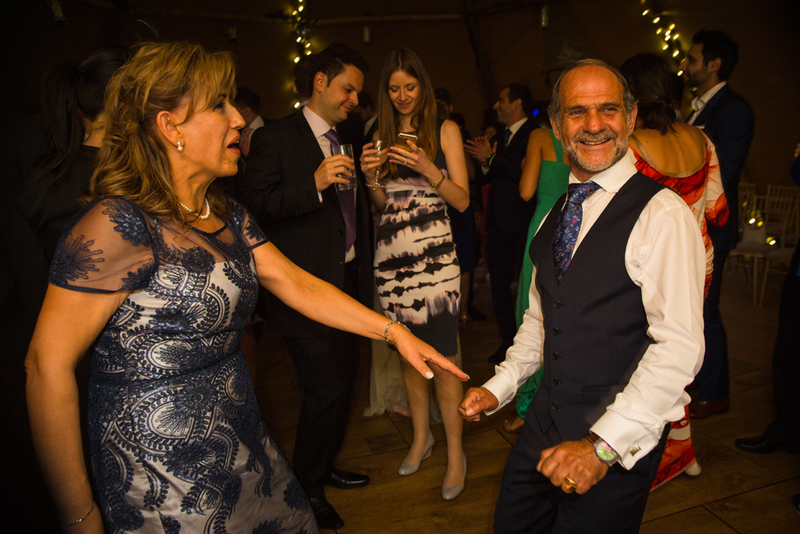 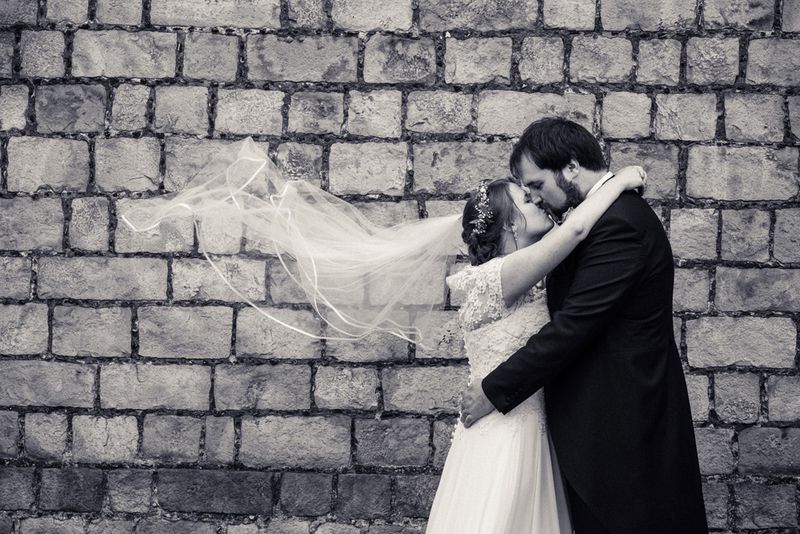 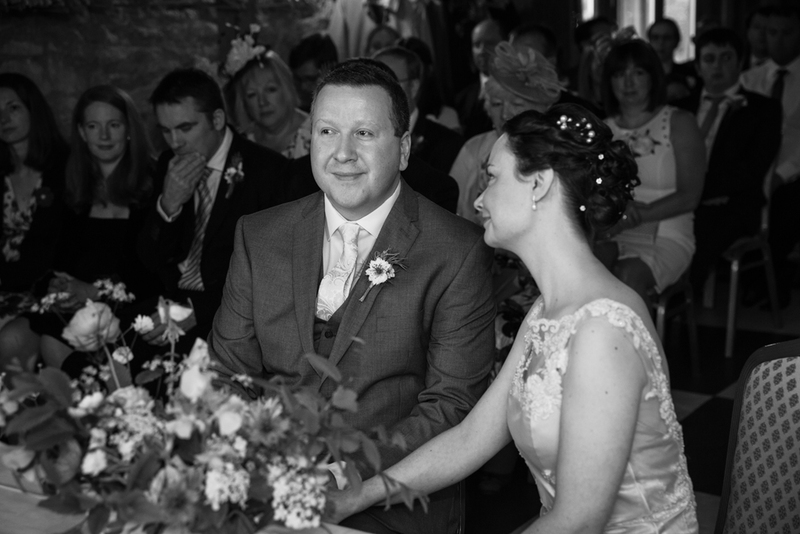 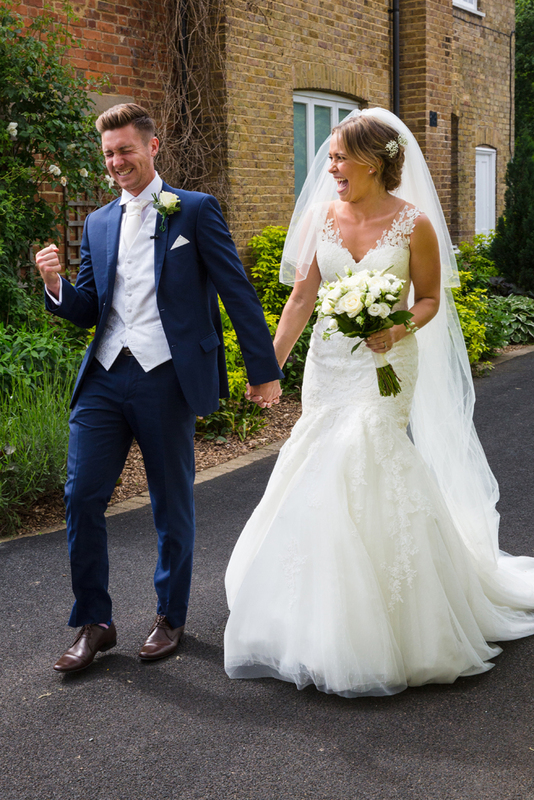 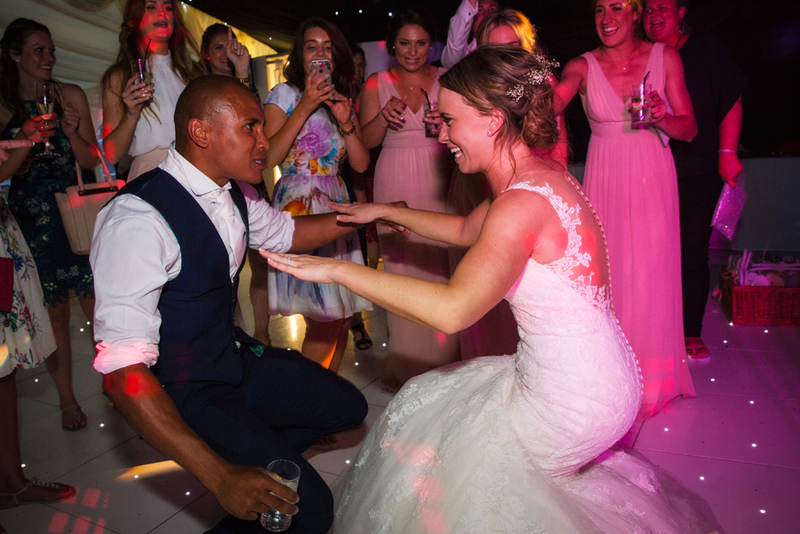 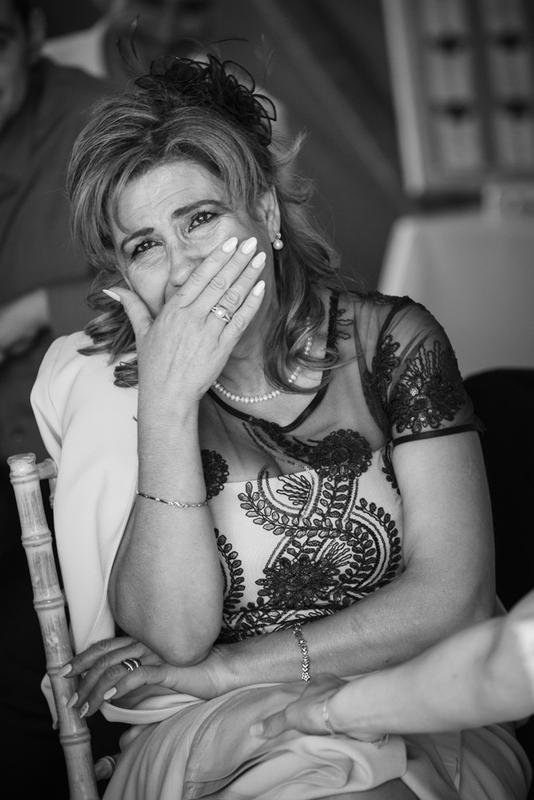 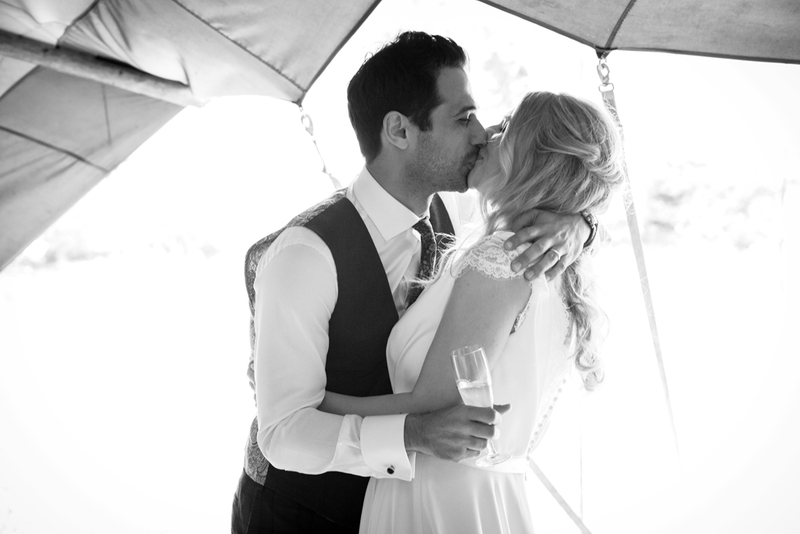 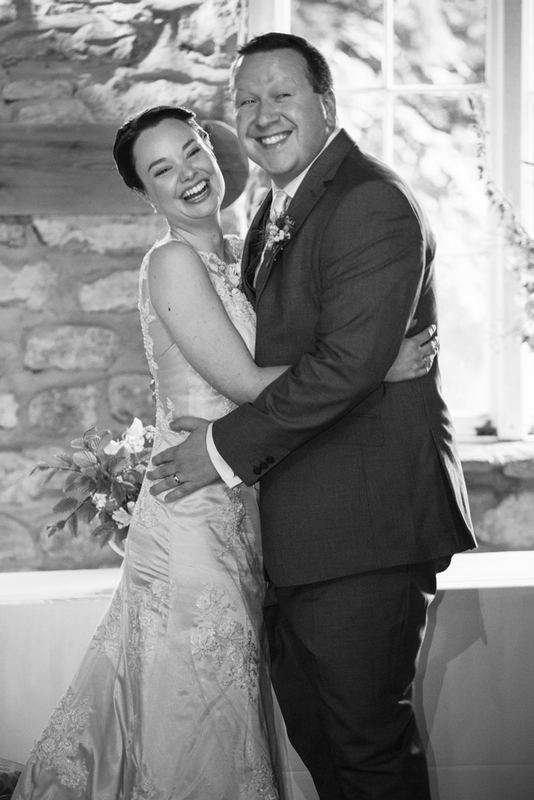 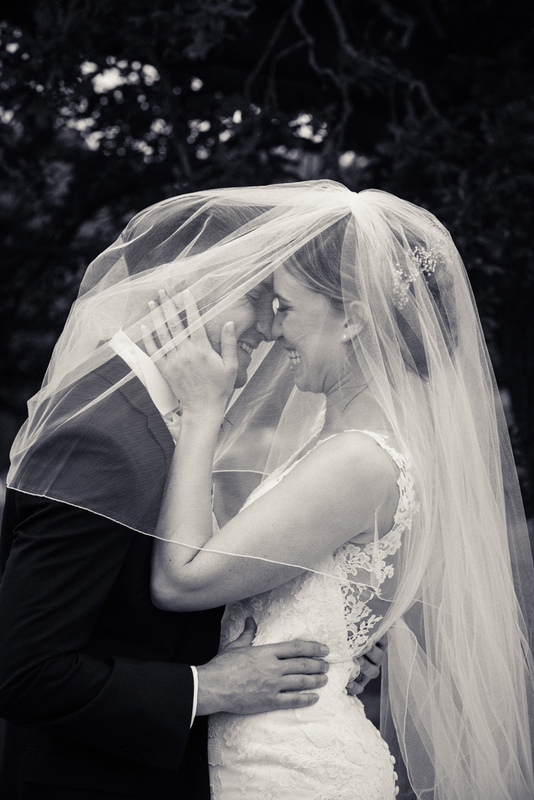 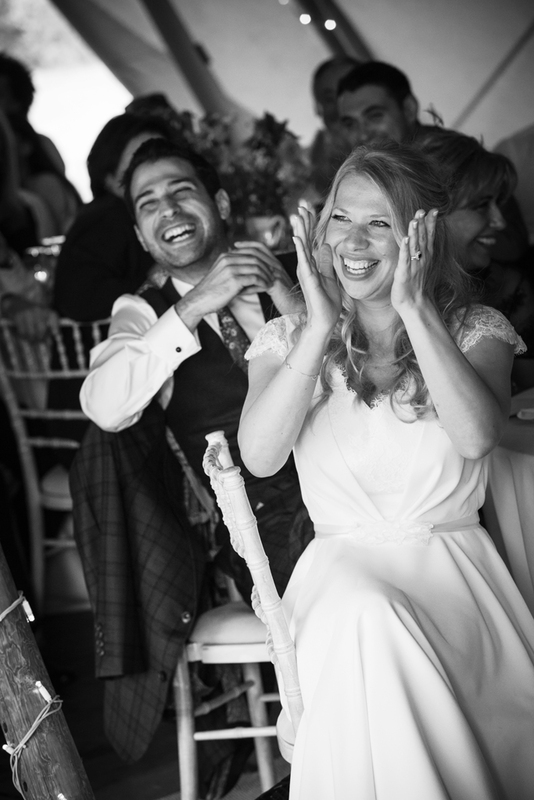 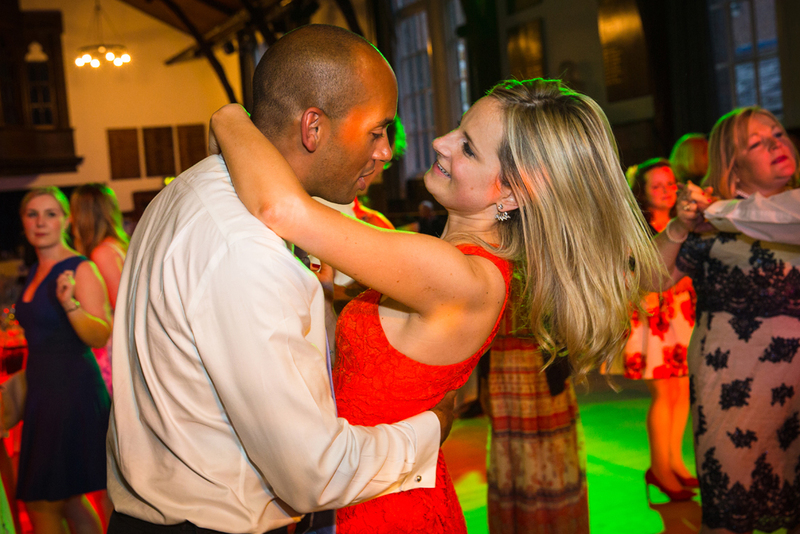 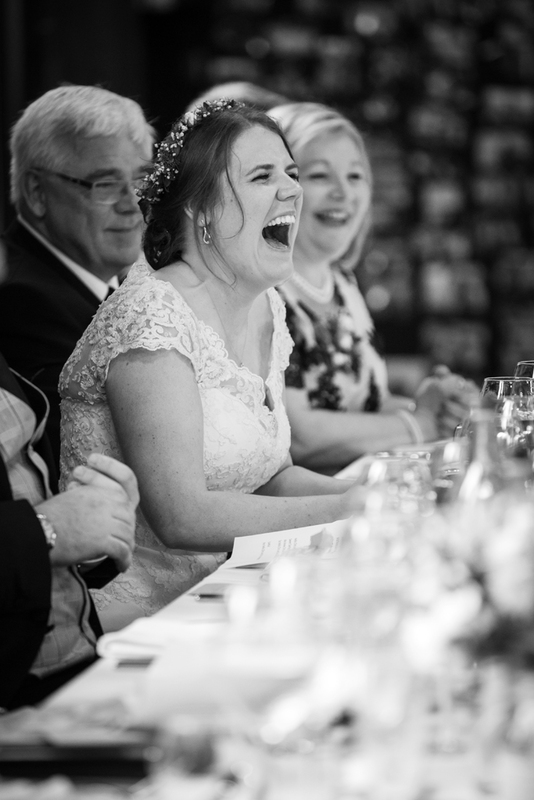 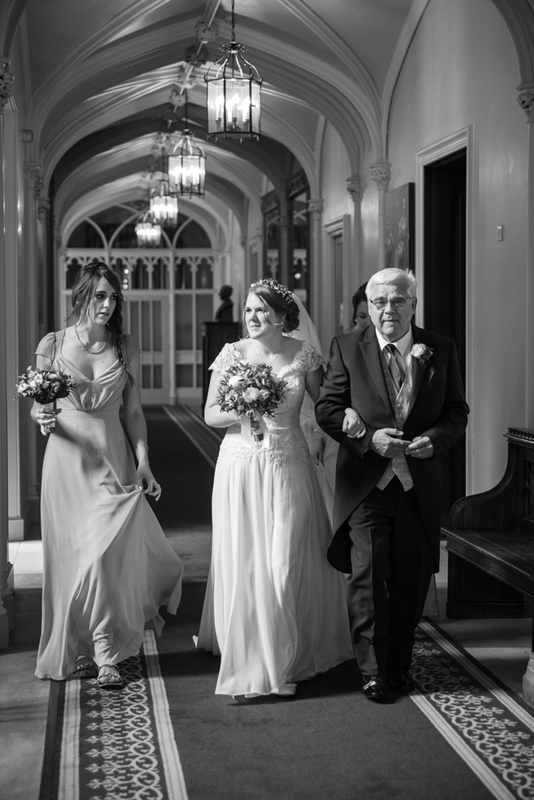 The images Kiti captured really show the emotions & celebrations of this part of the day. 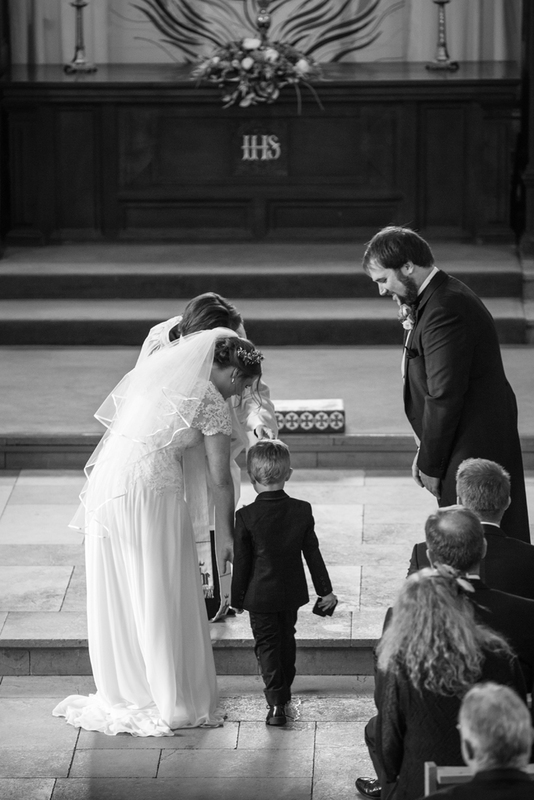 By now an expectant groom was waiting at the altar for his bride. 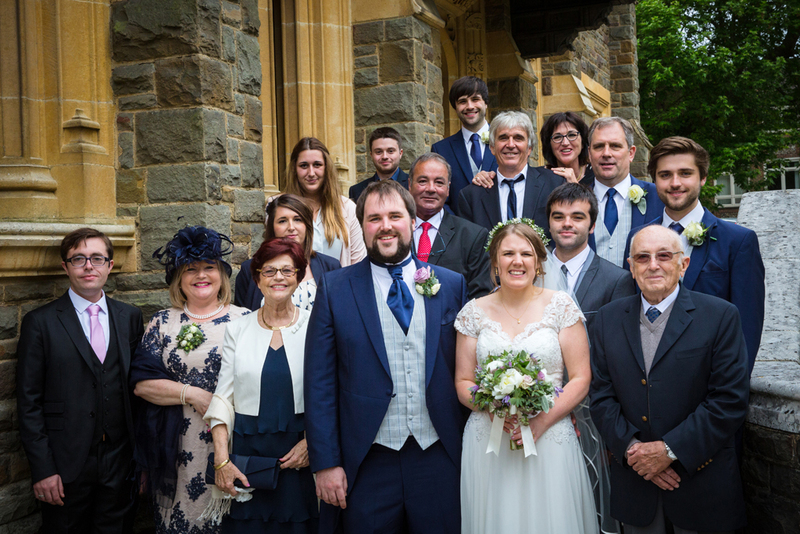 The Best Man & Ushers were waiting outside as we arrived & they accompanied the bridesmaids up the aisle followed into the church by the Bride & her father. 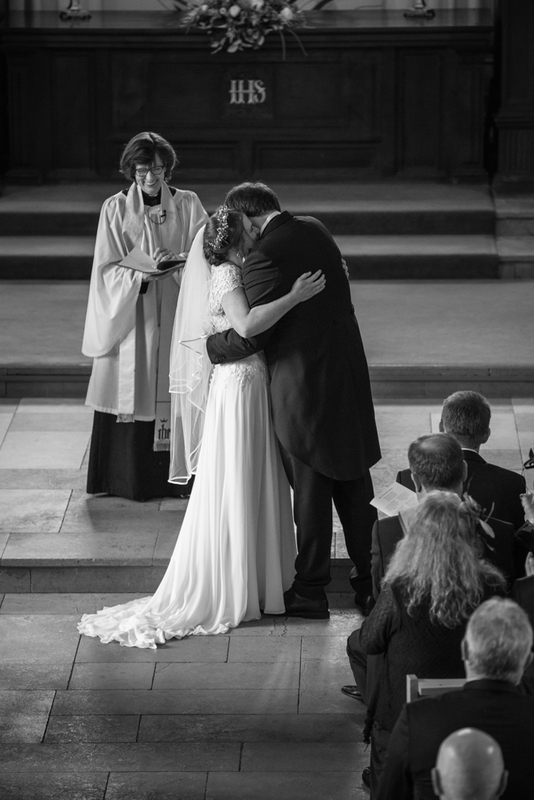 Unusually, at the last minute we found out we would be unable to take any images in the church due to the rules of a visiting vicar. 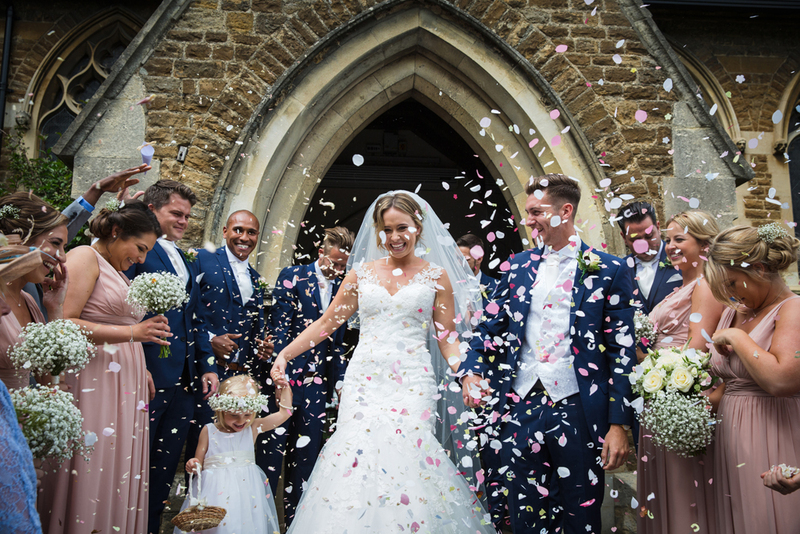 After the service everyone poured out of the church followed by the Bride & Groom who exited to a flurry of confetti! 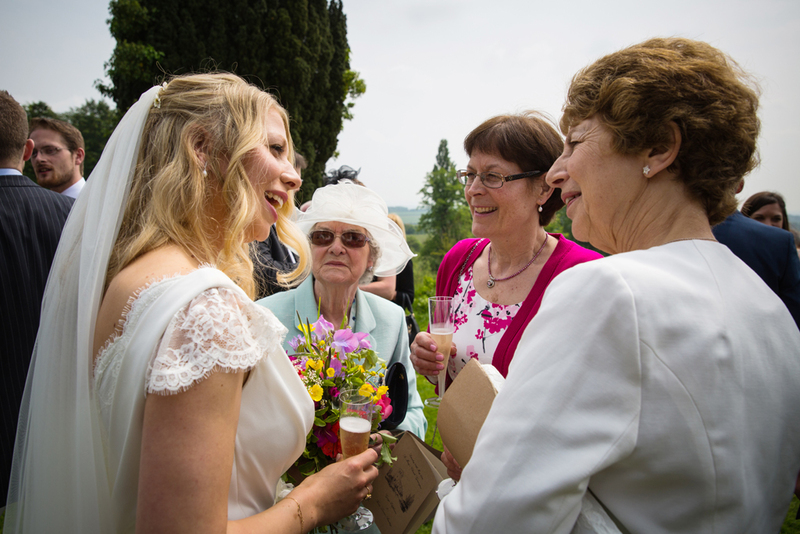 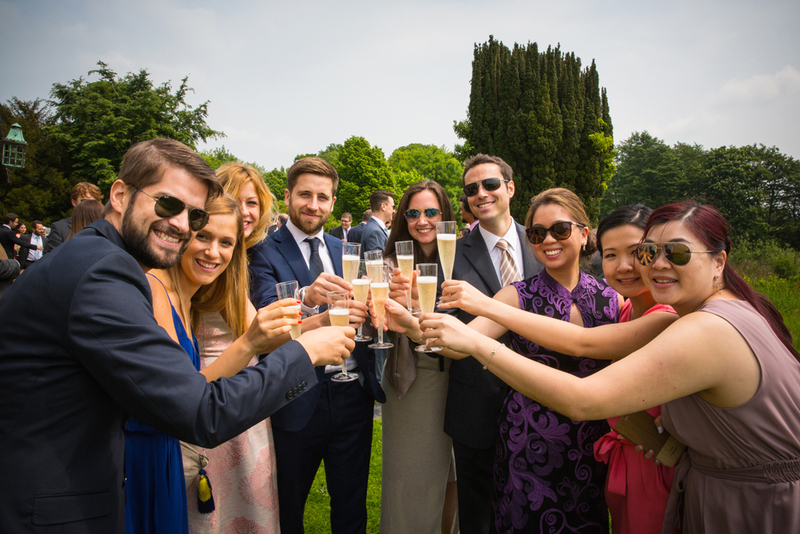 The Bride & Groom, their friends & family mingled in the churchyard with champagne before setting off the venue. 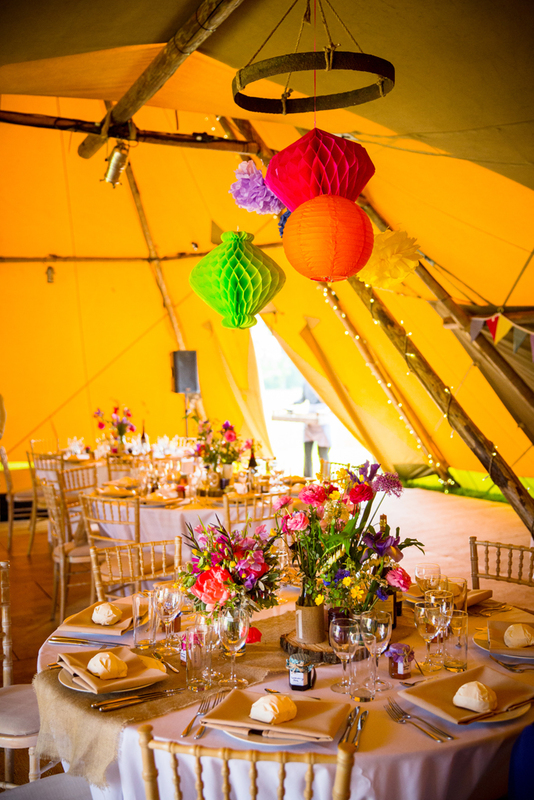 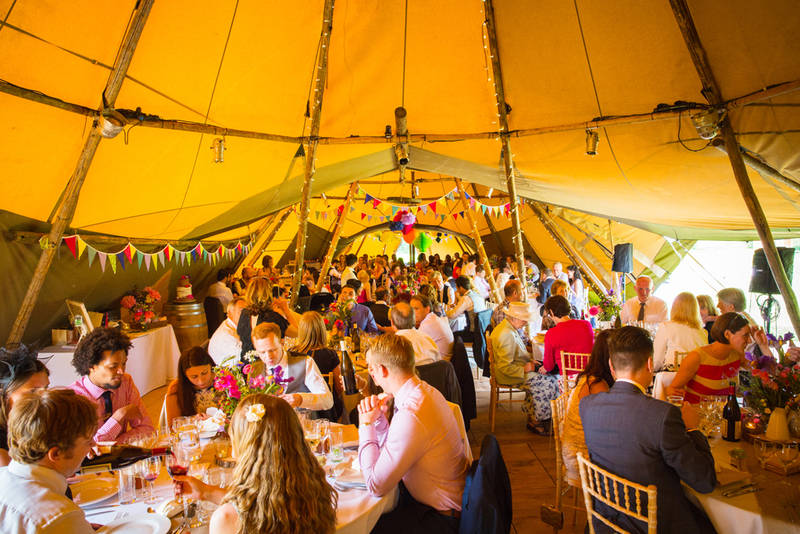 The reception was held in a tipi at City Farm, Eynsham. 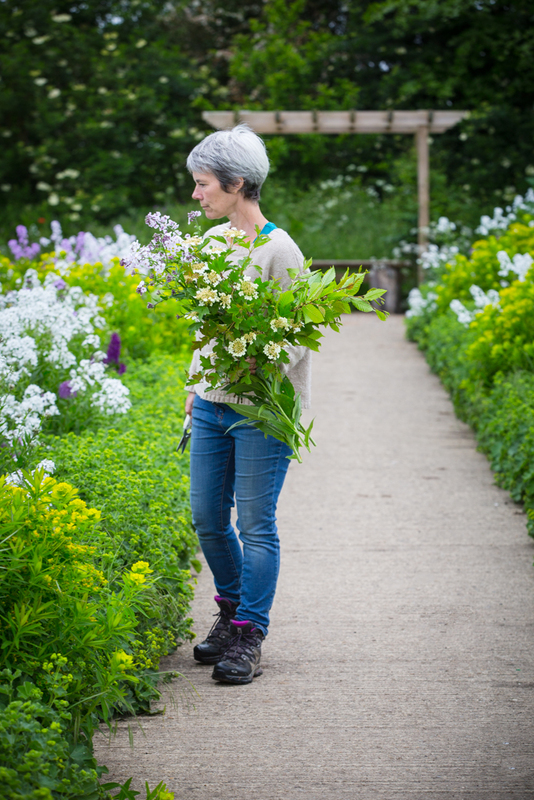 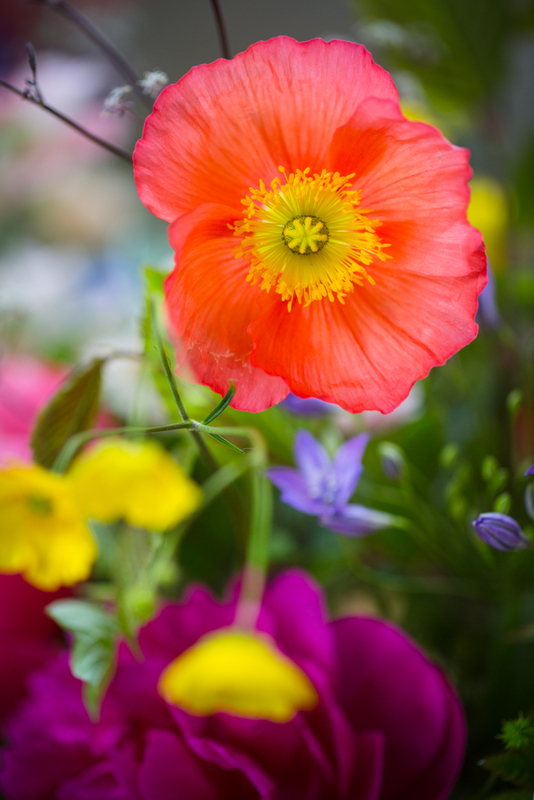 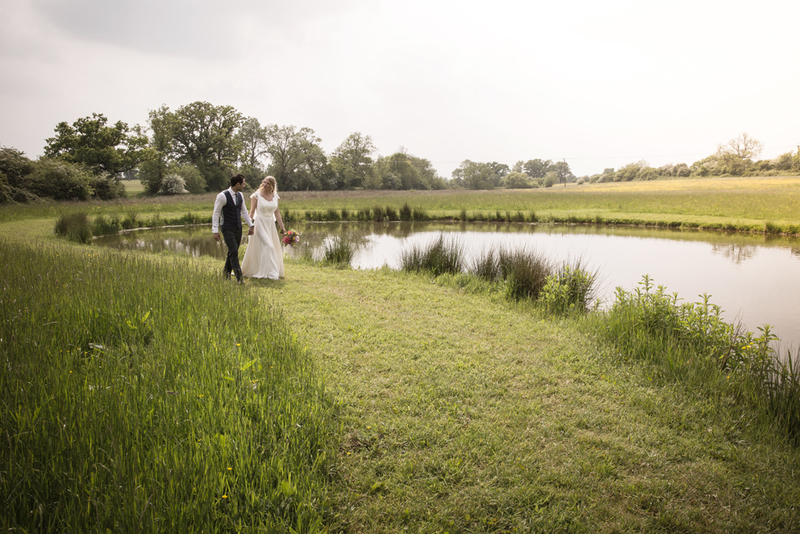 City Farm is a beautiful location & is also know as Rushy Meadows. 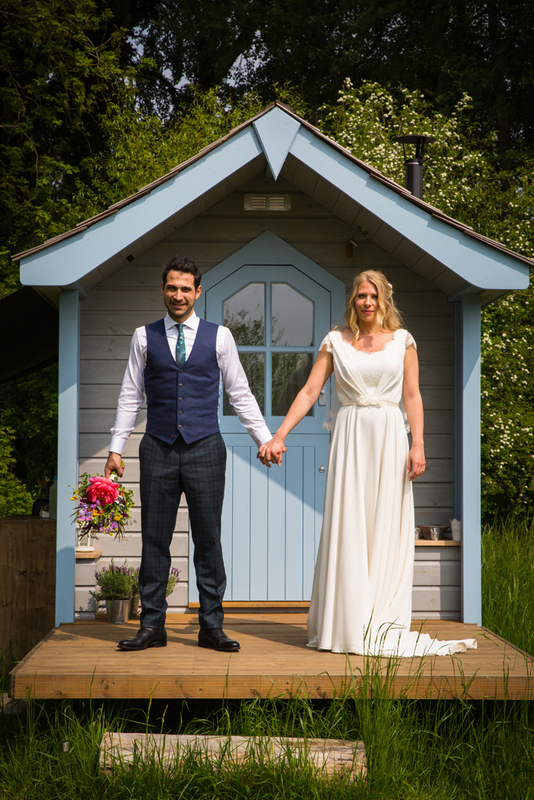 At Rushy Meadows there are 3 separate huts for glamping which you kind find on Canopy & Stars but they also hold weddings there. 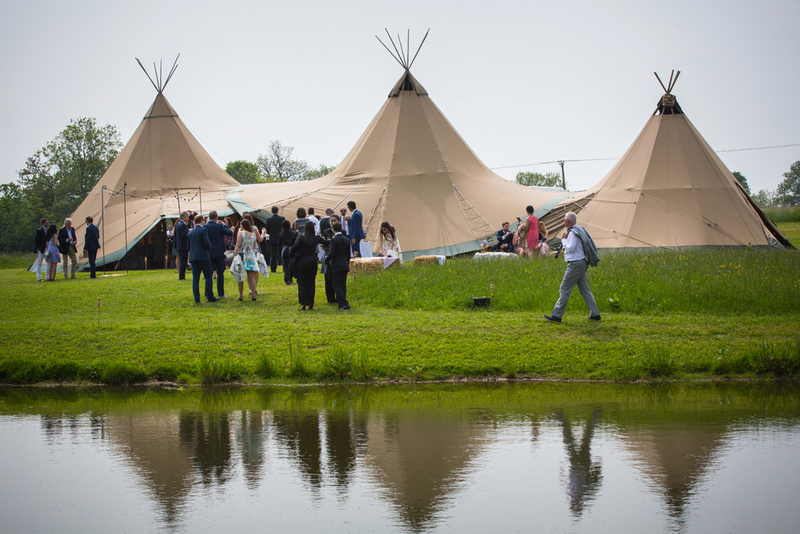 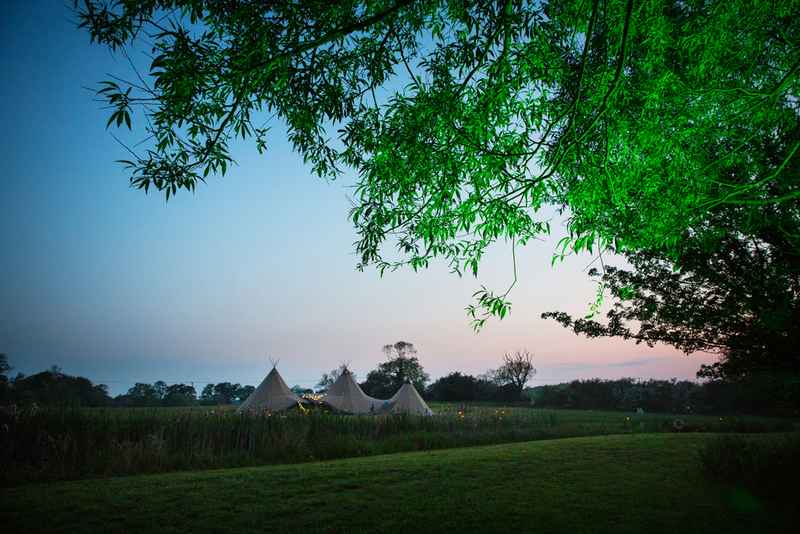 It’s a beautiful area with big mowed parts perfect for pitching a tipi in front of the lake & of course, the Bride & Groom can stay in one of the beautifully appointed huts right next door! 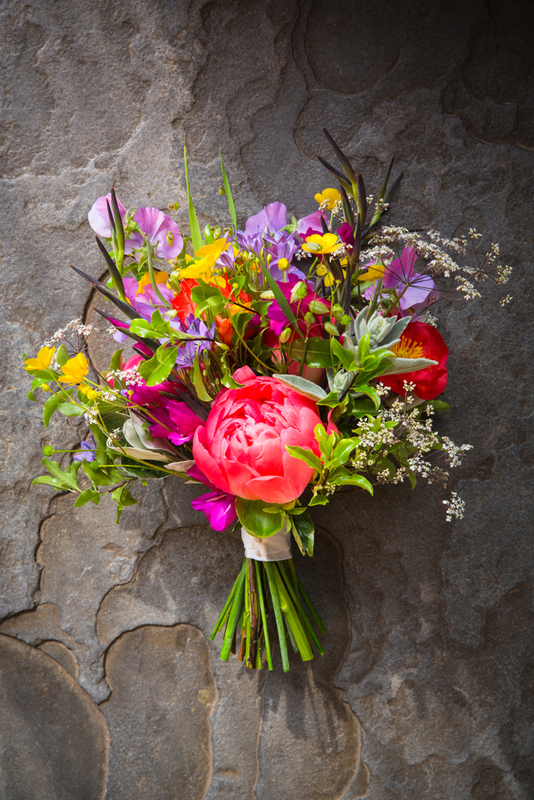 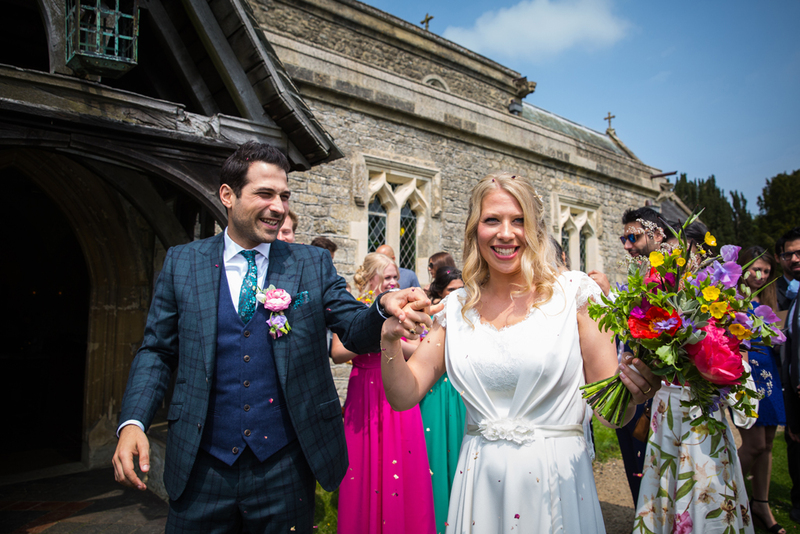 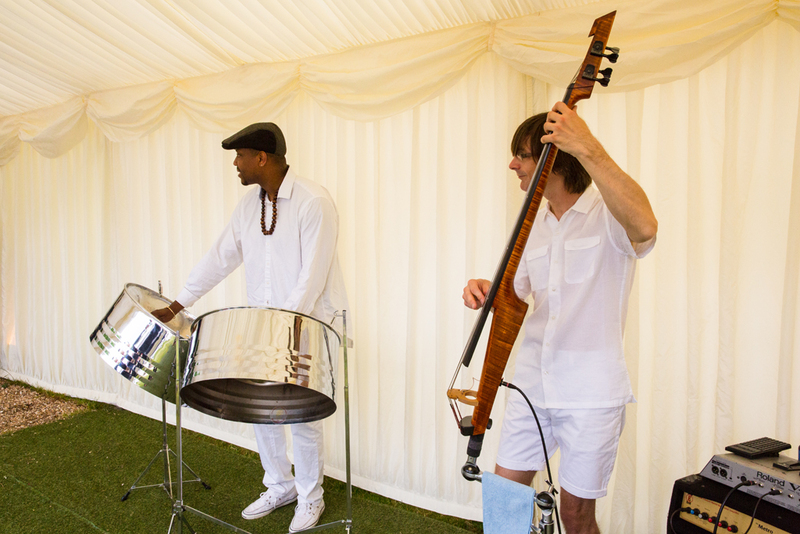 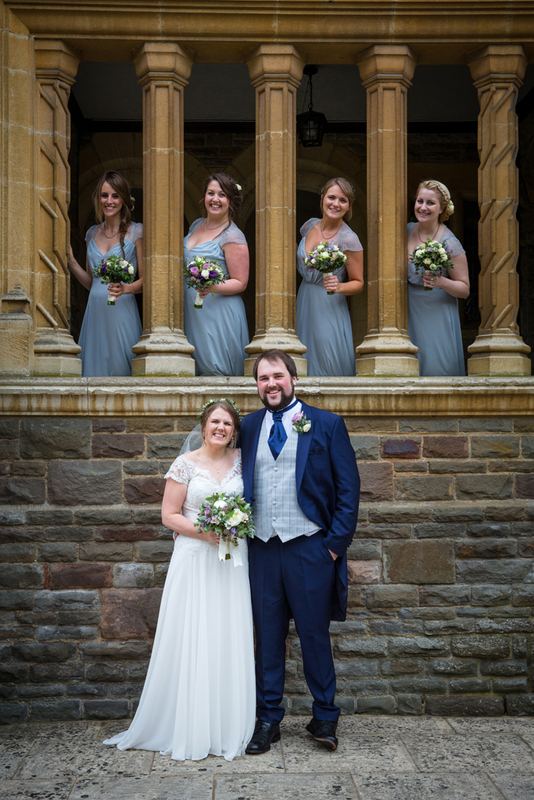 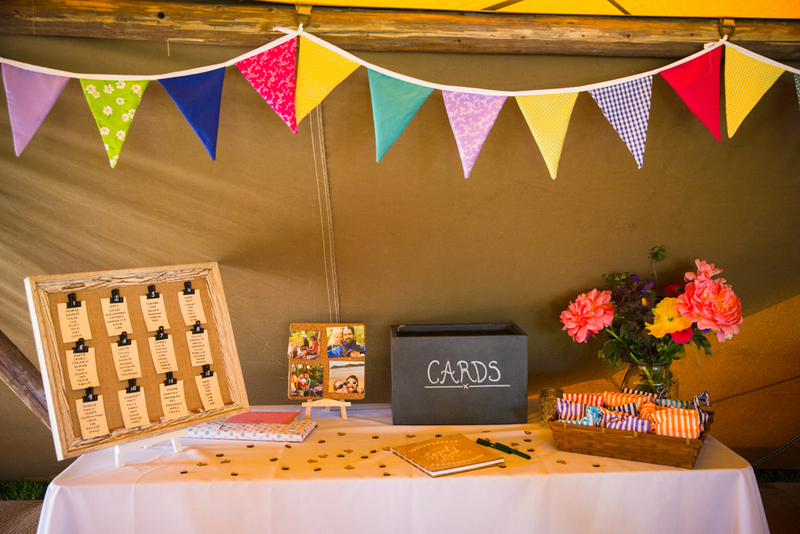 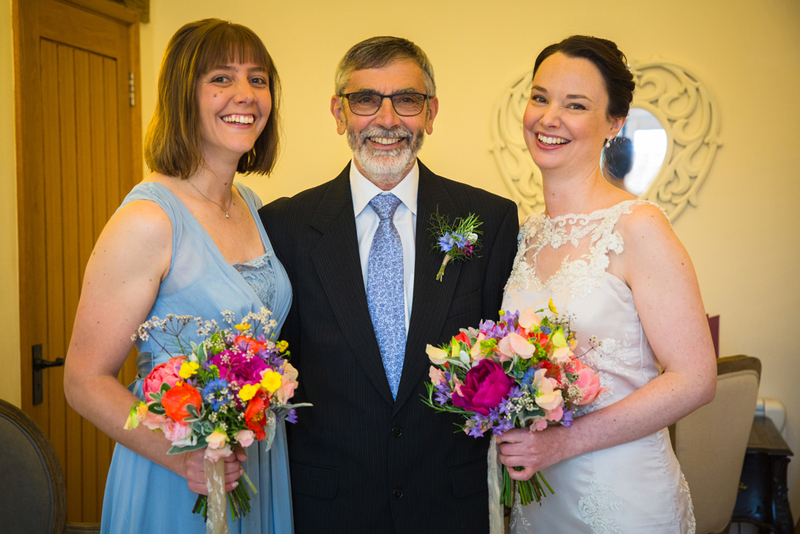 George & Kerrie arranged a beautiful, relaxed, colourful festival wedding & the sun really shone for them! 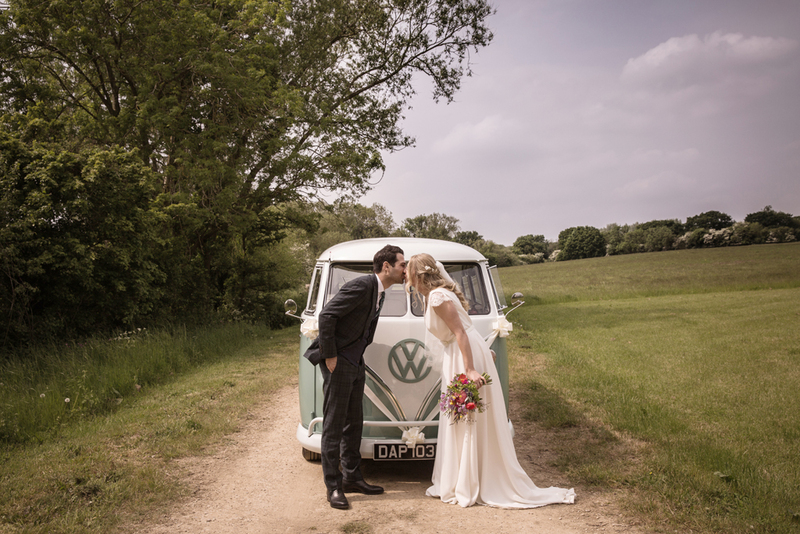 During the drinks reception Kiti & I took them away for some shots of the two of them with the fab campervan & lake offering perfect backdrops. 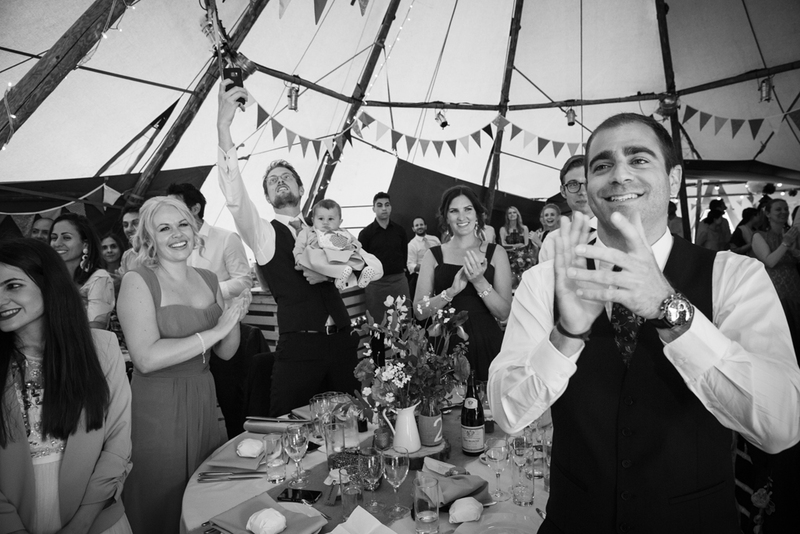 George & Kerrie were announced into the tipi with a round of applause & it was time for the speeches. 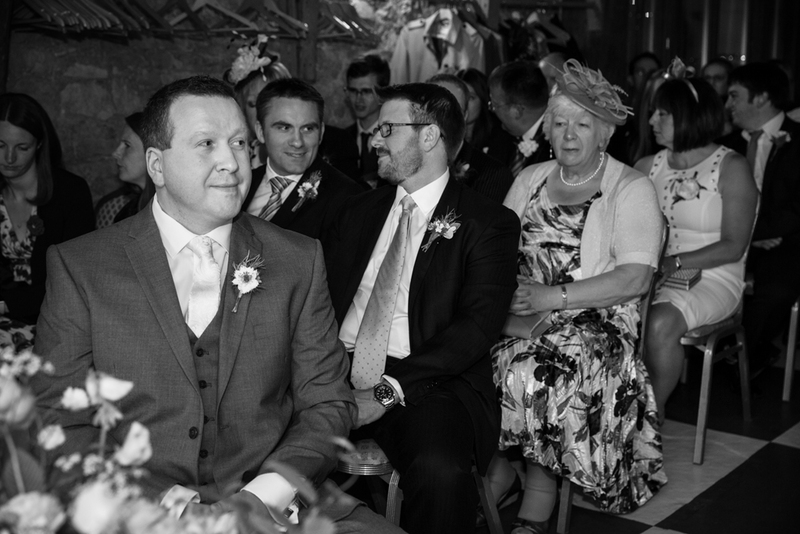 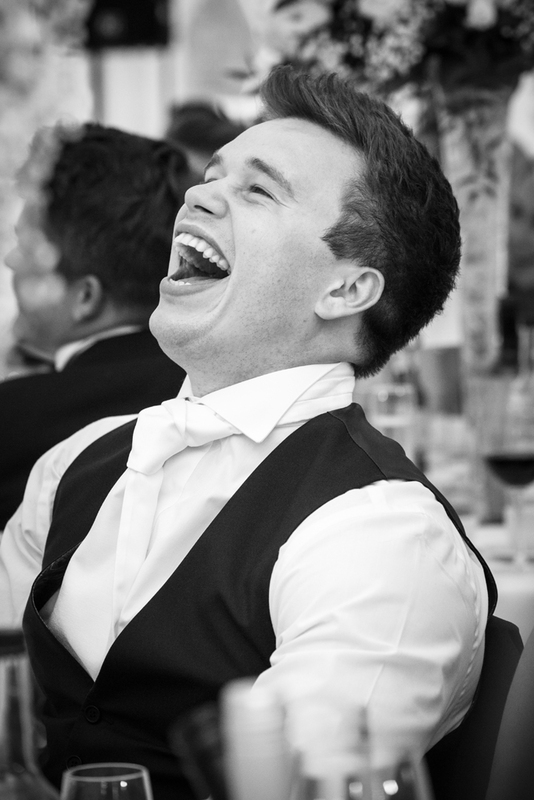 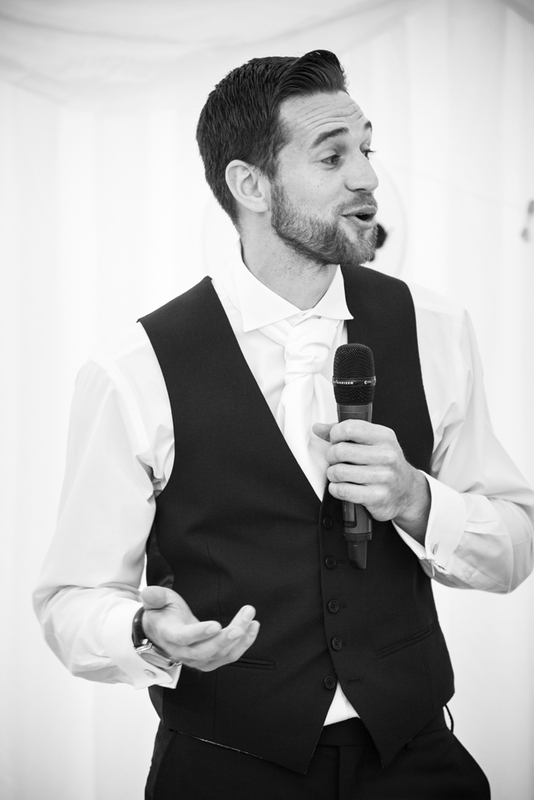 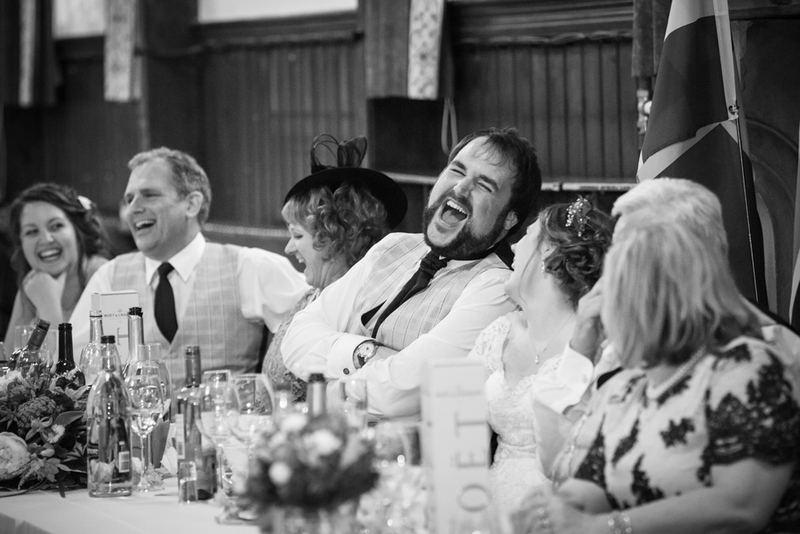 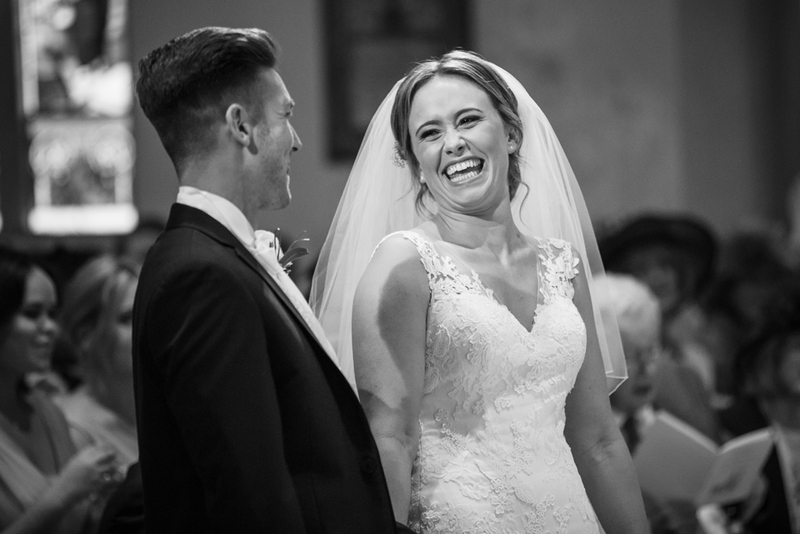 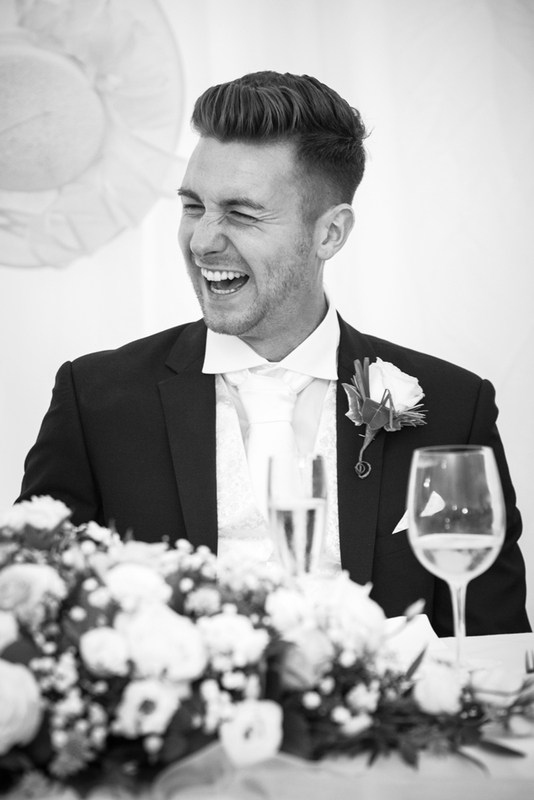 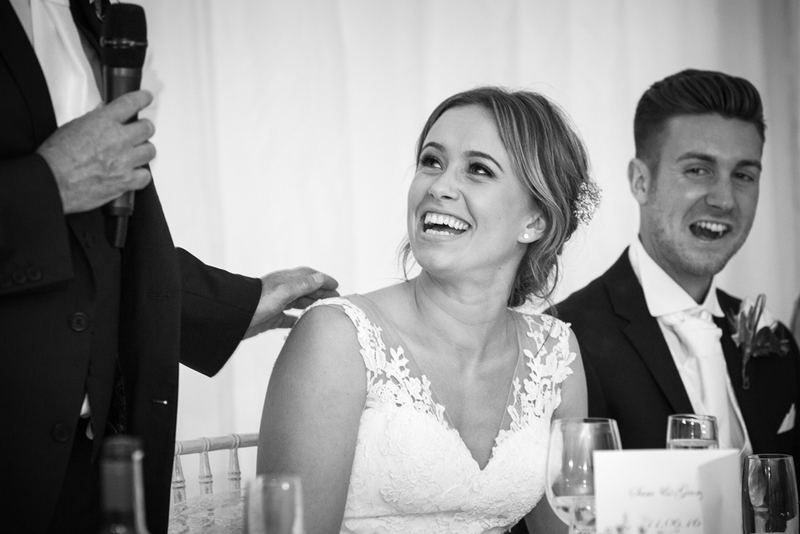 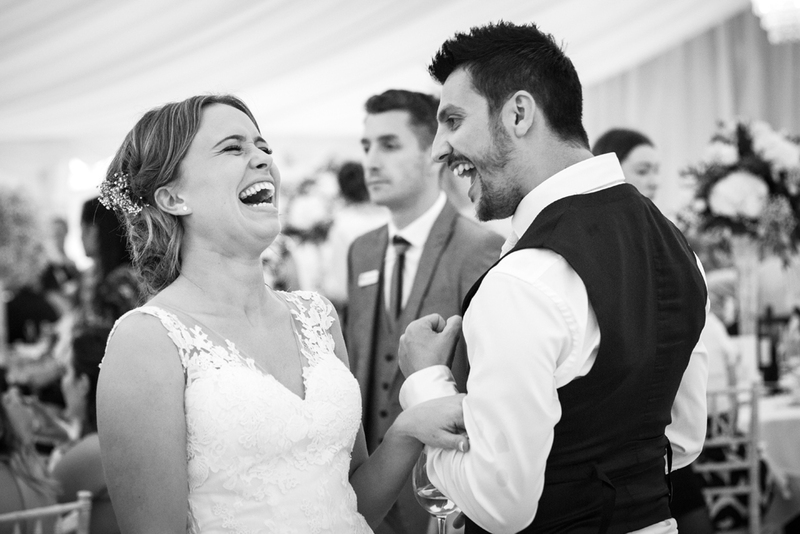 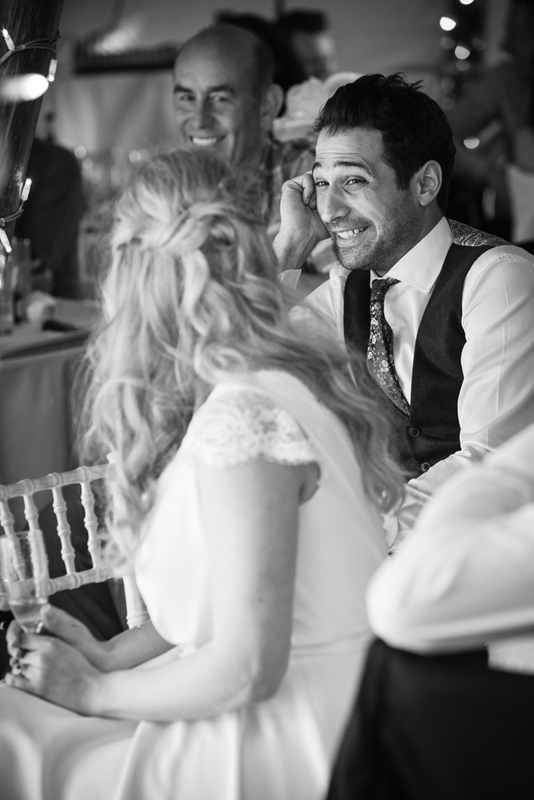 I love the emotions, the fun & the laughter in the images & just what was the Best Man telling Kerrie for the Groom to react like this! 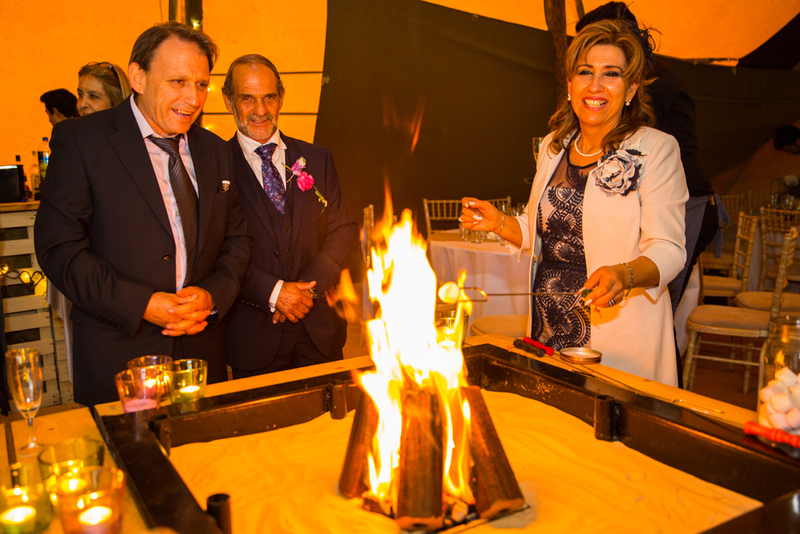 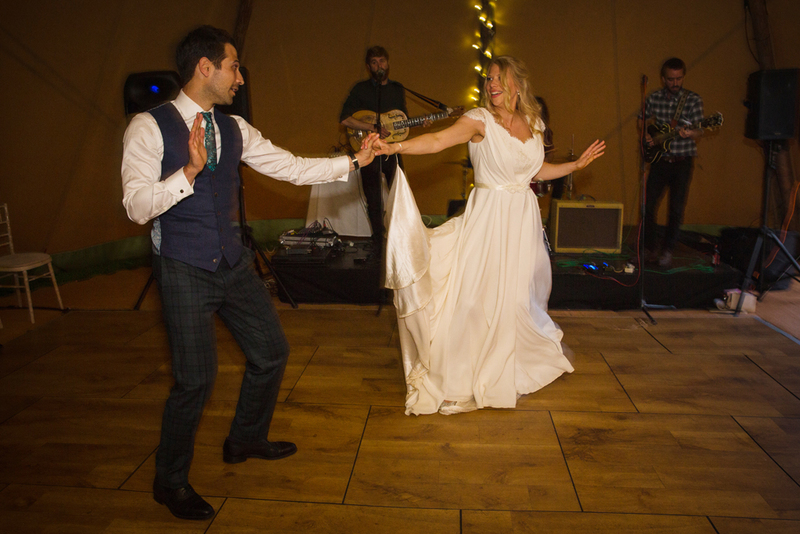 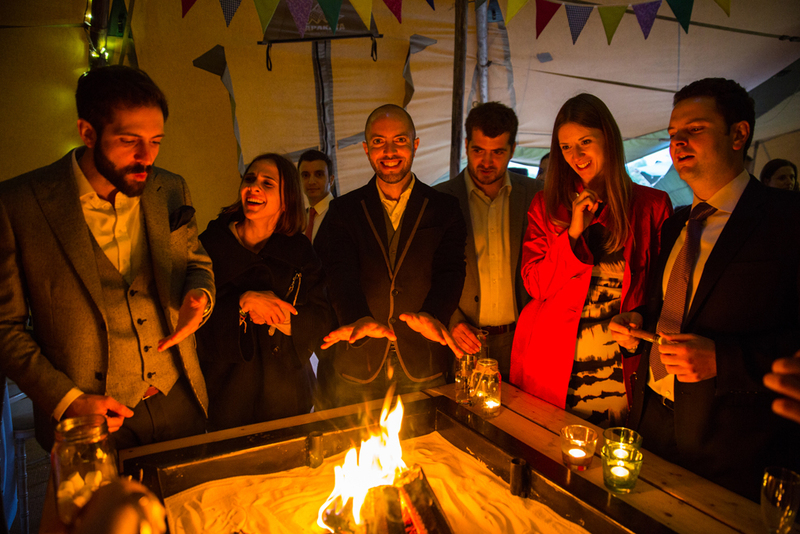 It was a lovely relaxed wedding & the large tipi was fantastic with firepits where guests could toast marshmallows. 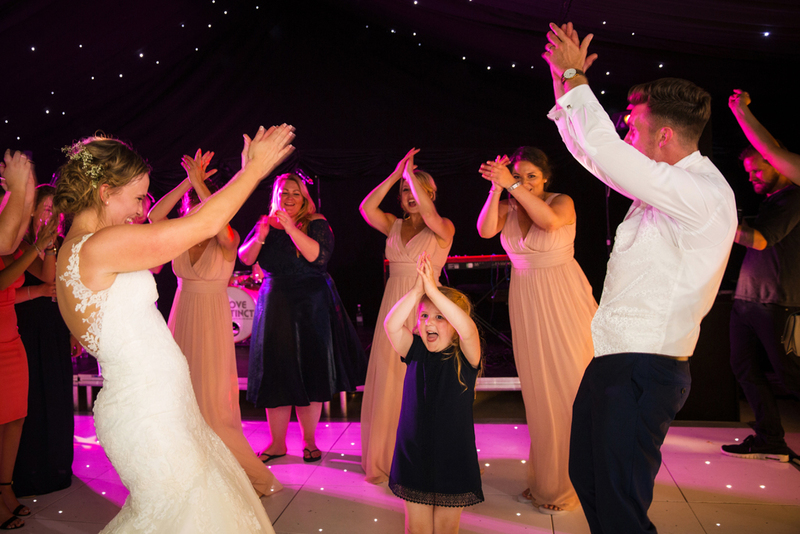 The whole day was a lovely celebration but before too long it was time for the Bride & Groom to cut the cake & then hit the dancefloor for their first dance. 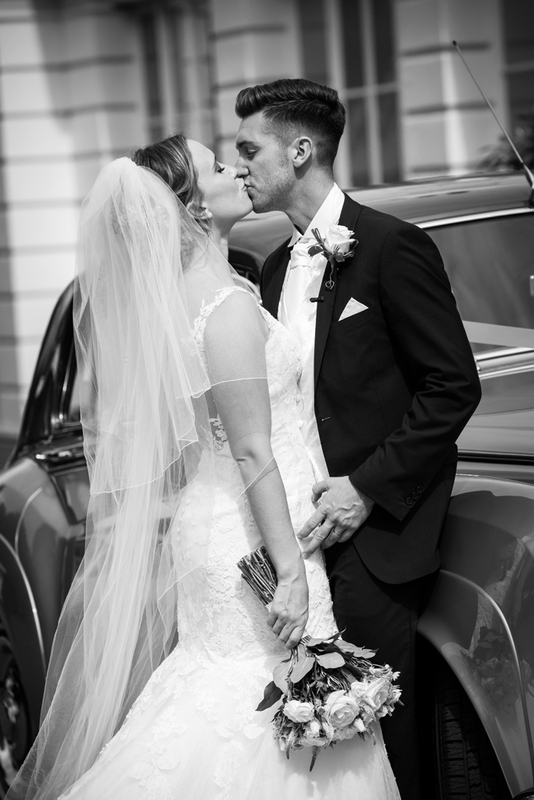 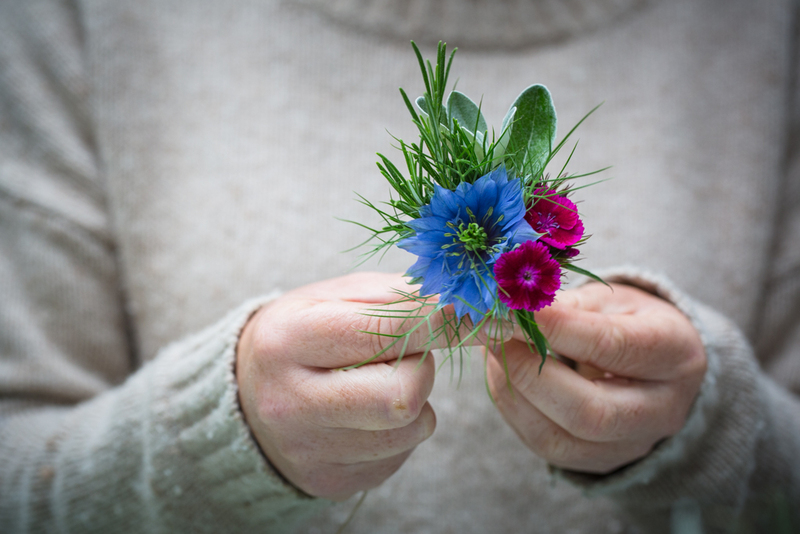 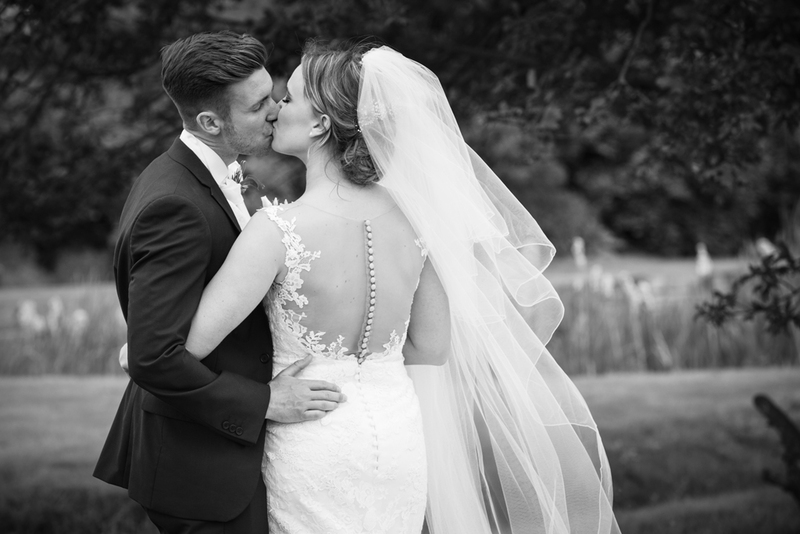 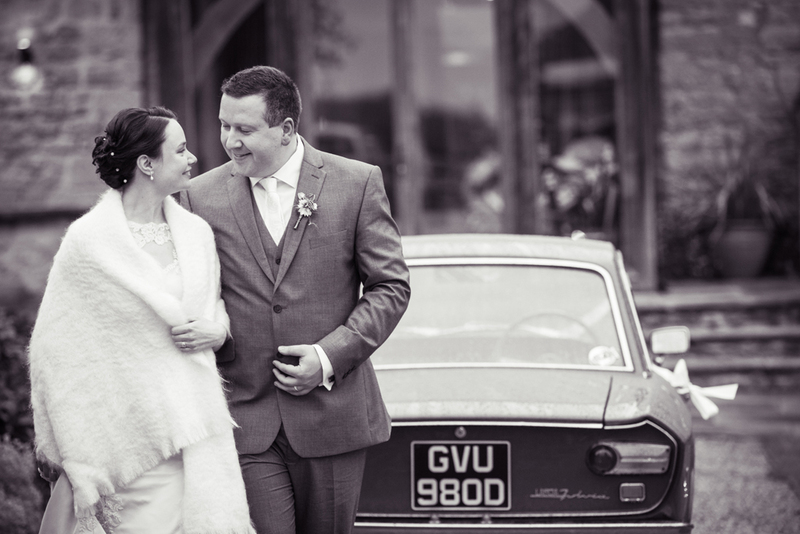 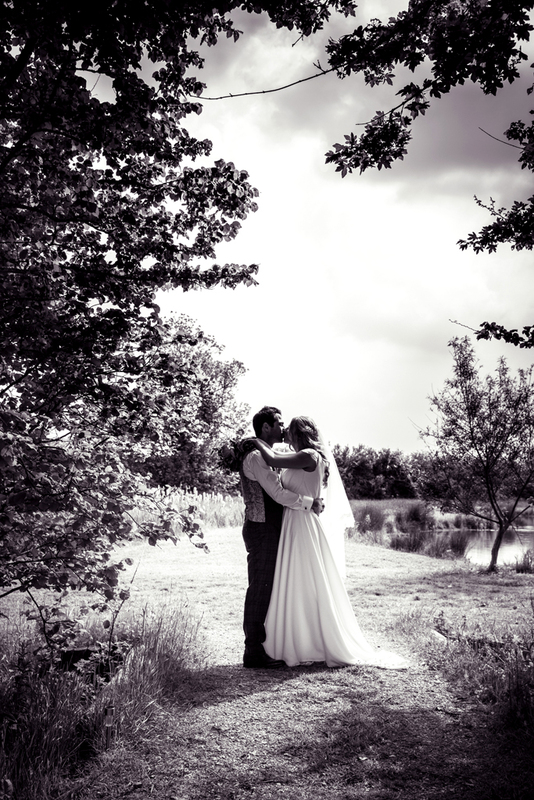 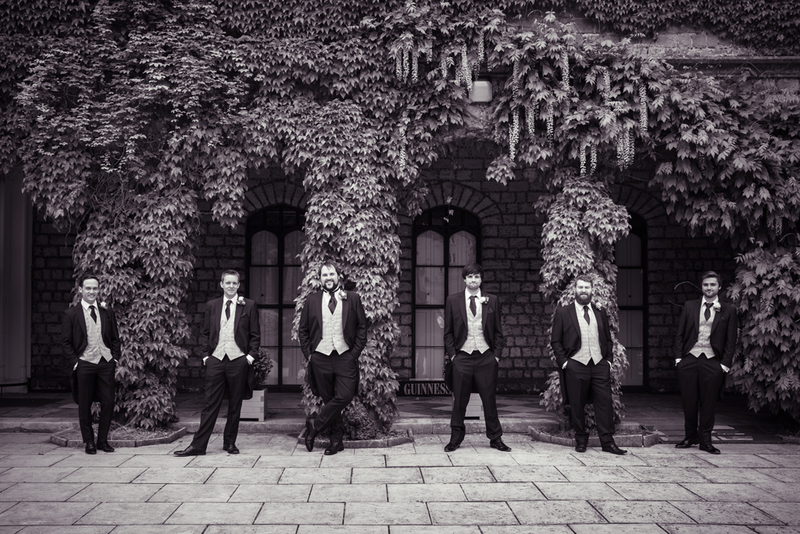 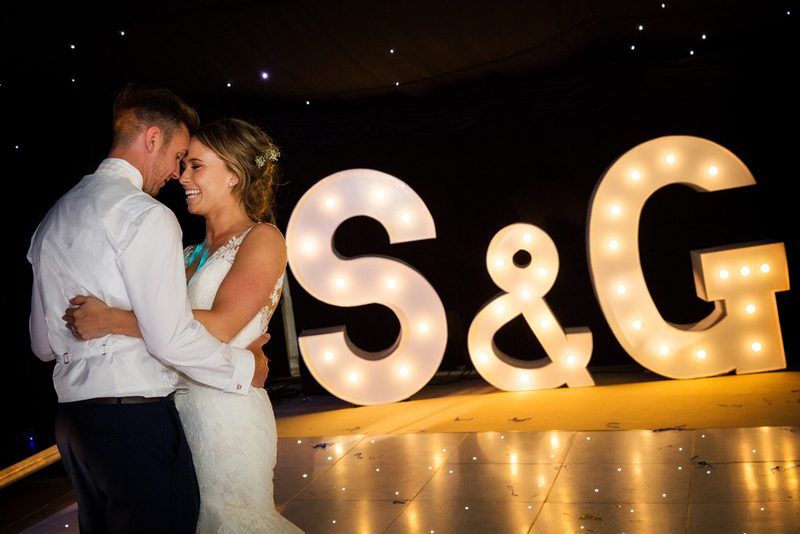 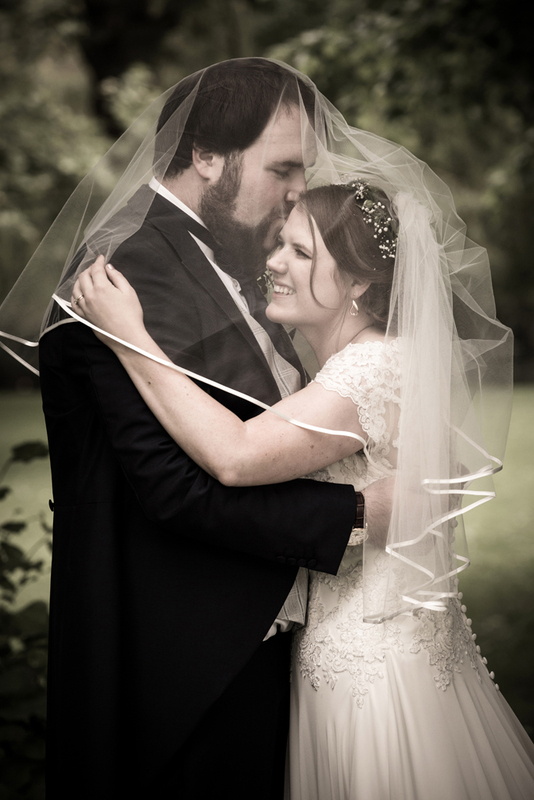 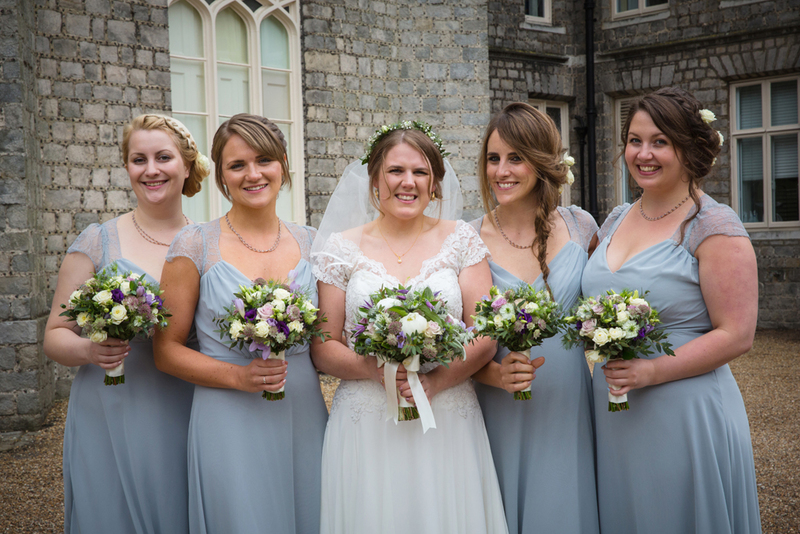 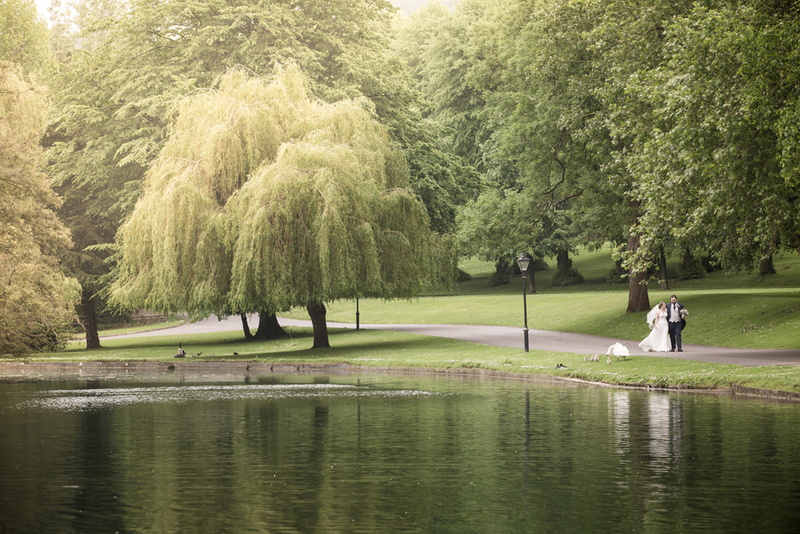 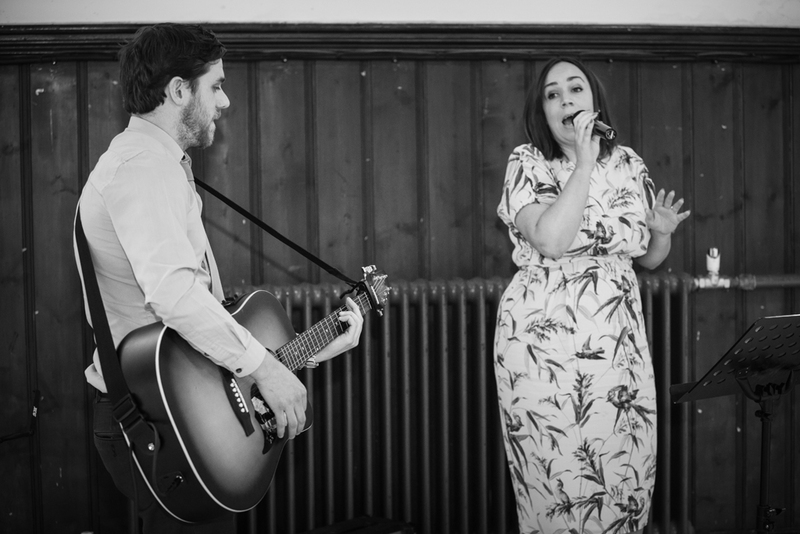 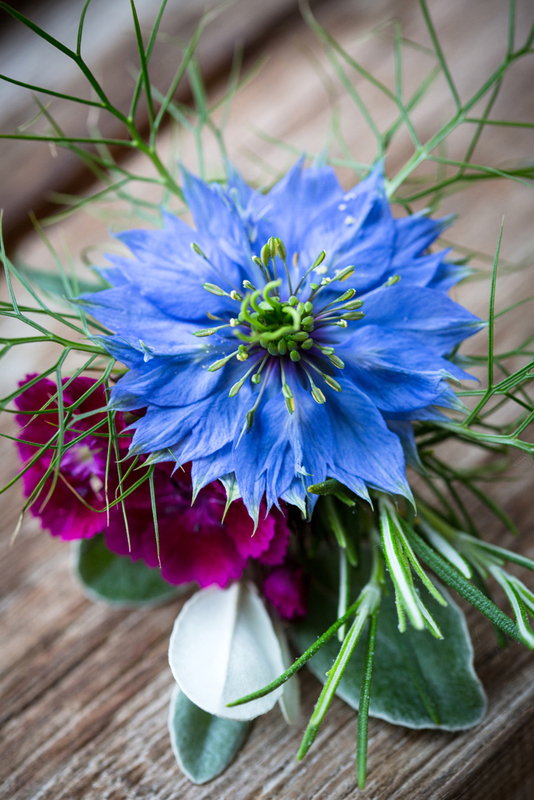 We hope you enjoy your sneak peek George & Kerrie, there are lots more to come!